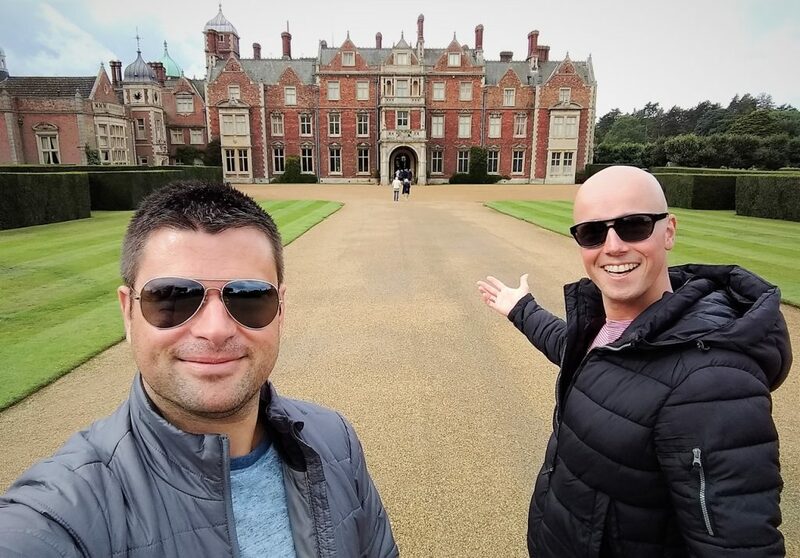 On day thirty-four, after a walk around King’s Lynn, we got back on the road and headed for The Queen’s home at Sandringham (our third royal location on our trip). 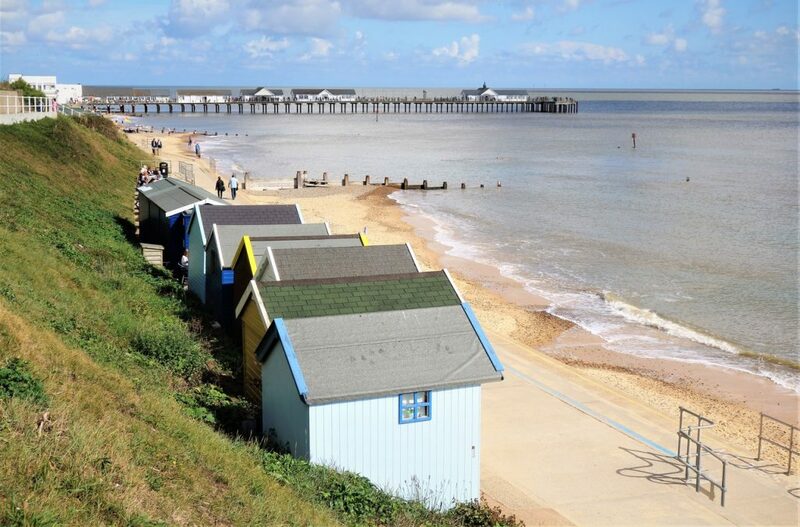 We then continued along the Norfolk coastline to Lowestoft, with plenty of windmills and lighthouses along our journey. We packed a lot into today. 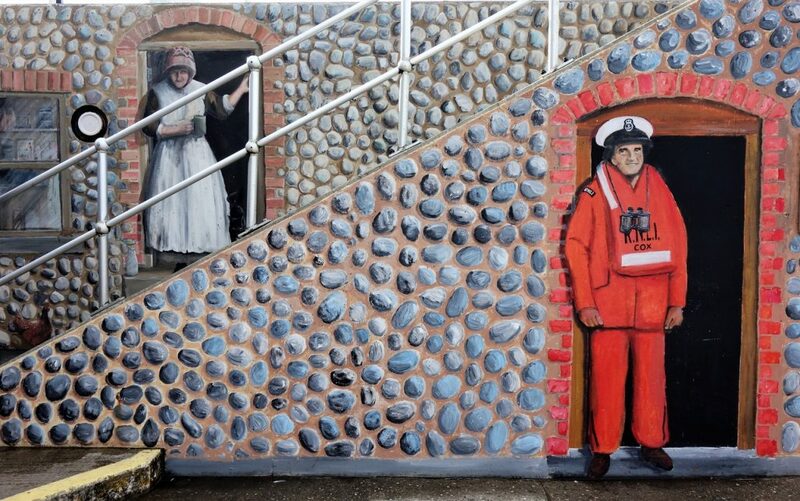 Amazing street art at Sheringham. Some of The Queens’s favorite things, starting with racing horses. 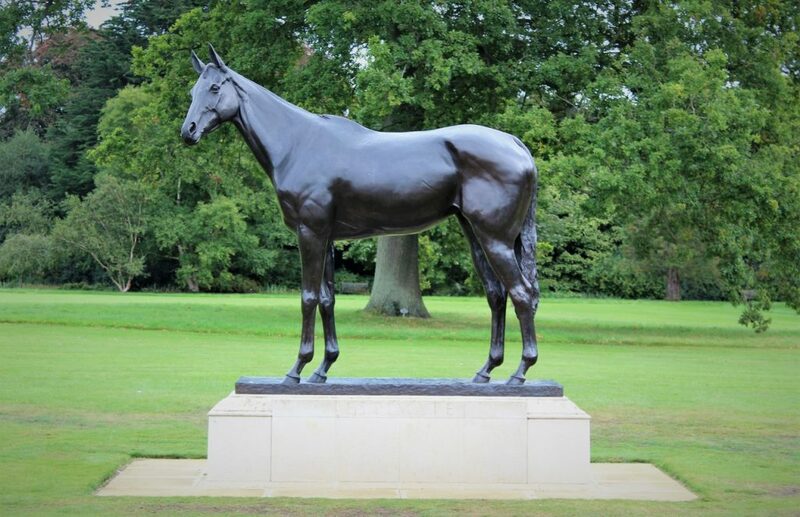 Estimate, who won the Gold Cup at Royal Ascot. 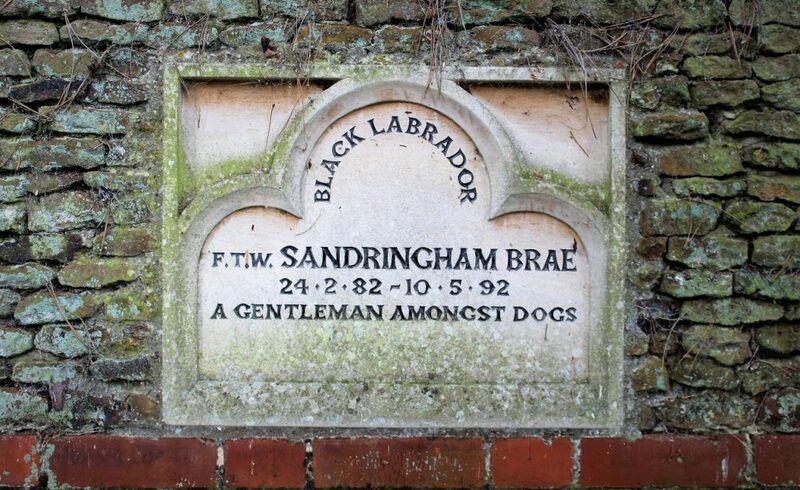 A whole series of stones set in the garden walls, remembering The Queen’s dogs, with lovely little messages. 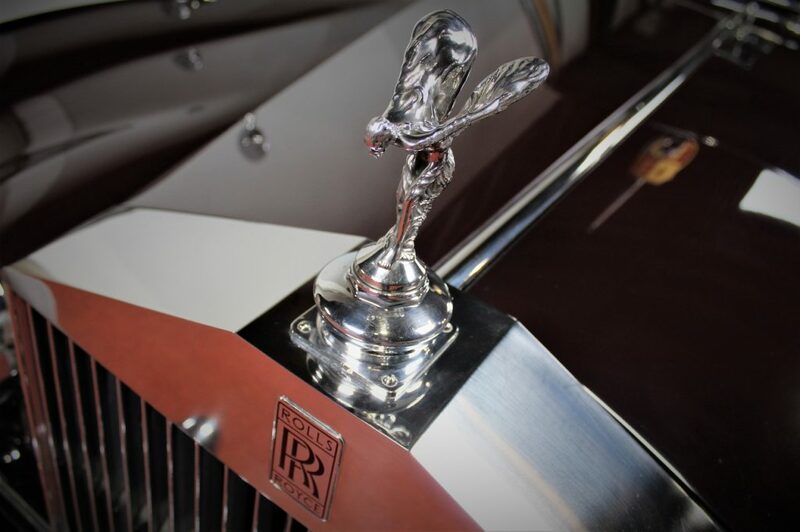 The stunning ‘Spirit of Ecstasy’ adorning one of the Rolls Royce bonnets. 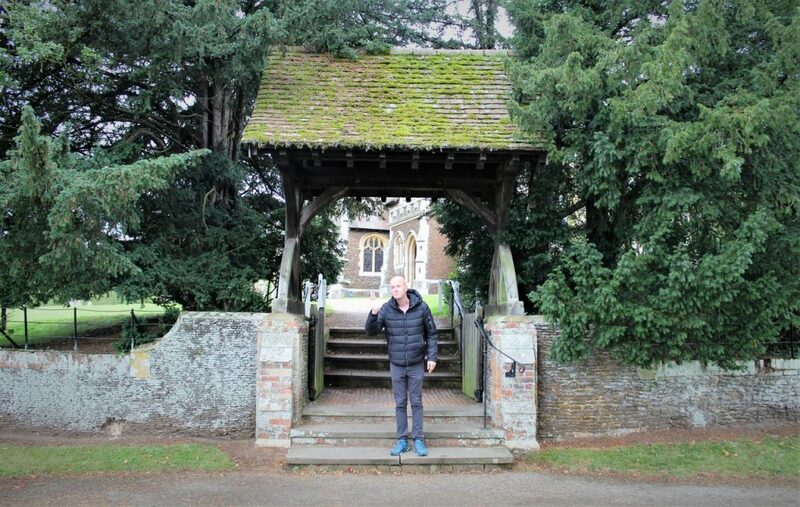 Jarno giving a royal wave in the Lychgate of St Mary Magdalene’s Church, where The Royal Family normally attend the Christmas Day service. 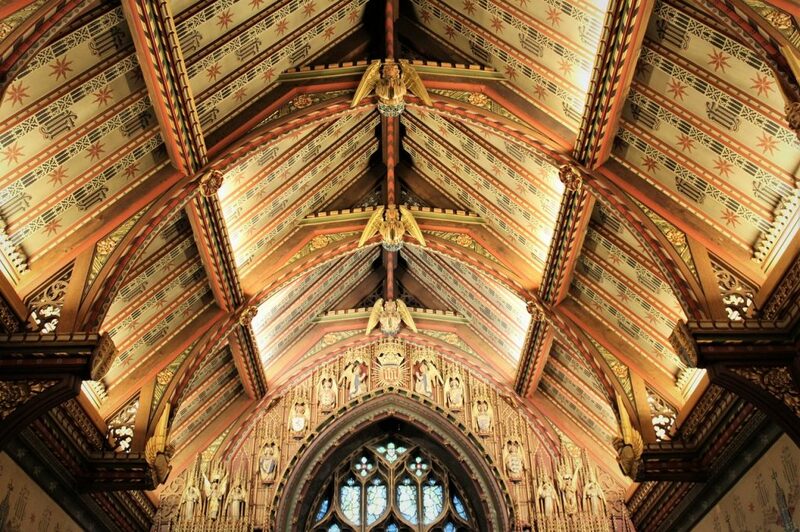 The beautiful ceiling of the 16th century church. 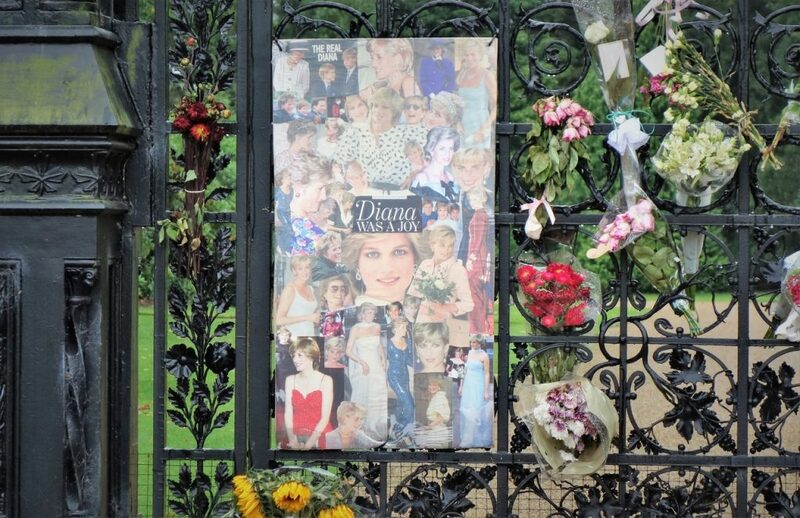 It was the 20th anniversary of the death of Diana. 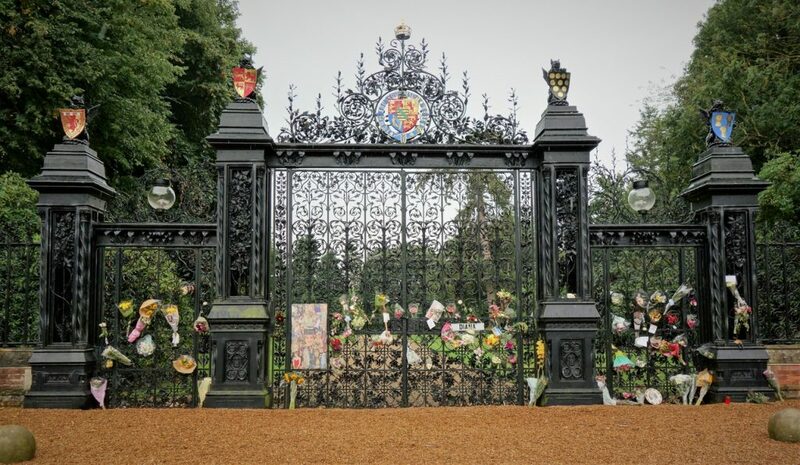 Many tributes had been left at the Sandringham gates. 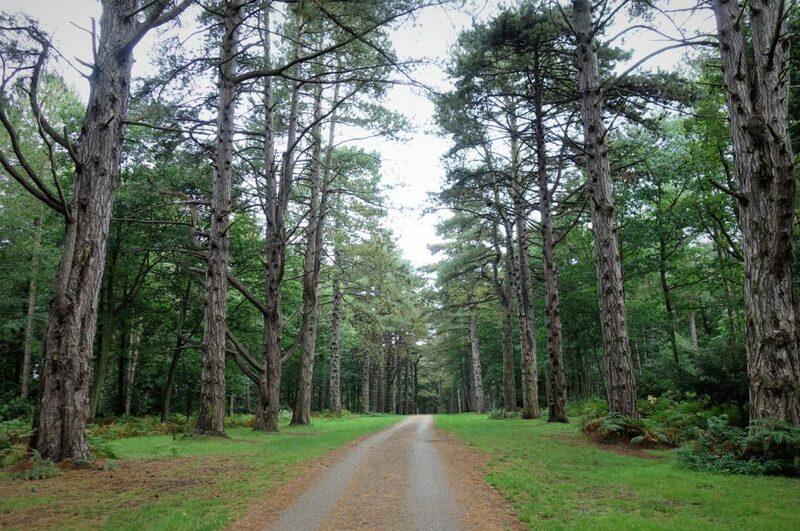 Driving through the tranquil Sandringham Country Park. We made a quick stop at Norfolk Lavender set among 100 acres of lavender fields (yes, we know this isn’t lavender). However, we’d just missed the lavender blooming season (June to August), so made do with a quick walk around their cottage garden. 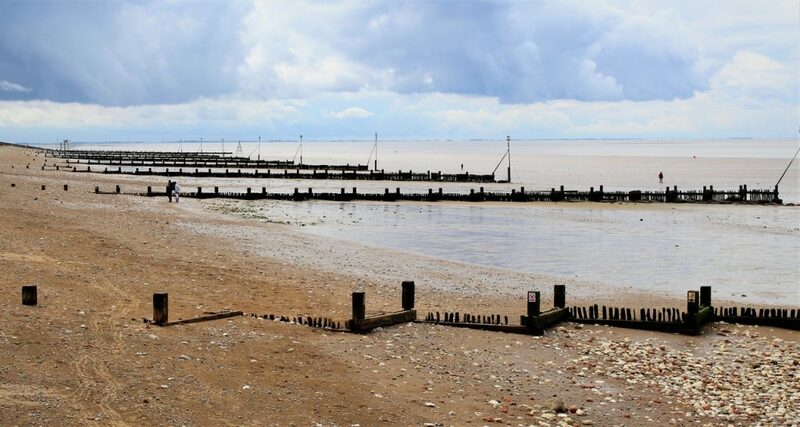 Hunstanton Beach, the only holiday town beach in Norfolk that faces west, so great for viewing the sunset (if we’d been later in the day). 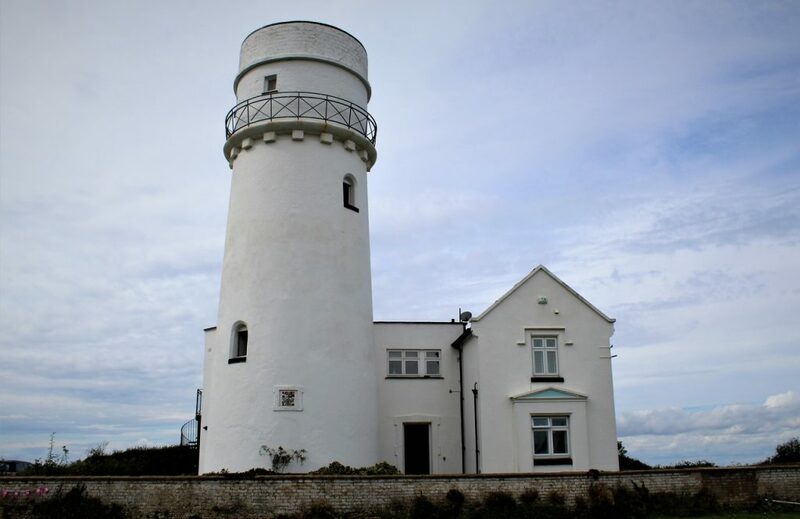 The Old Hunstanton Lighthouse built in 1840. 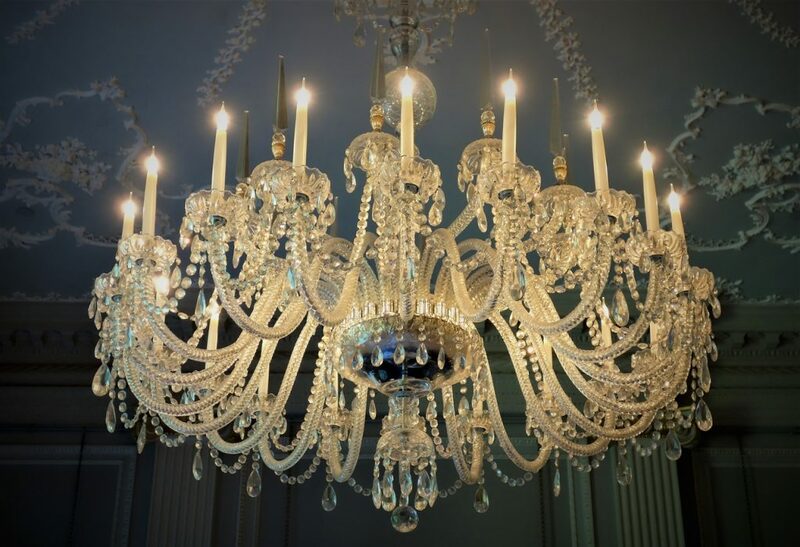 Its predecessor had the world’s first parabolic reflector in 1776. 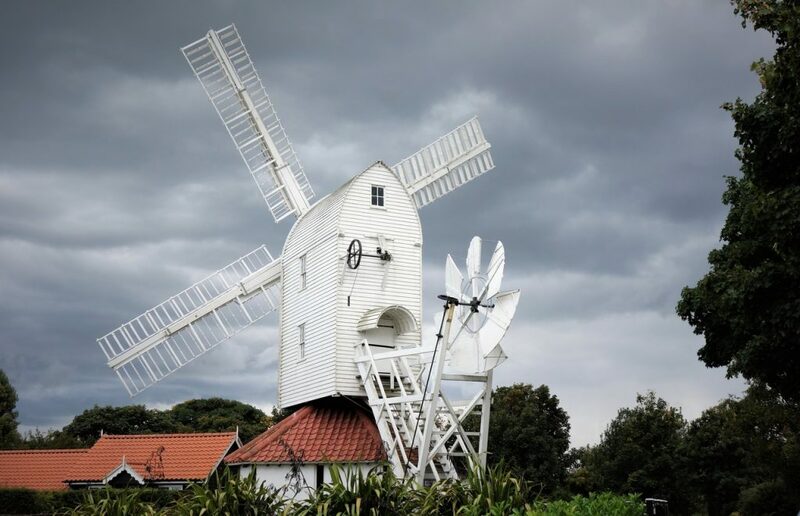 Windmills became a common sight as we drove along the Norfolk coastline. 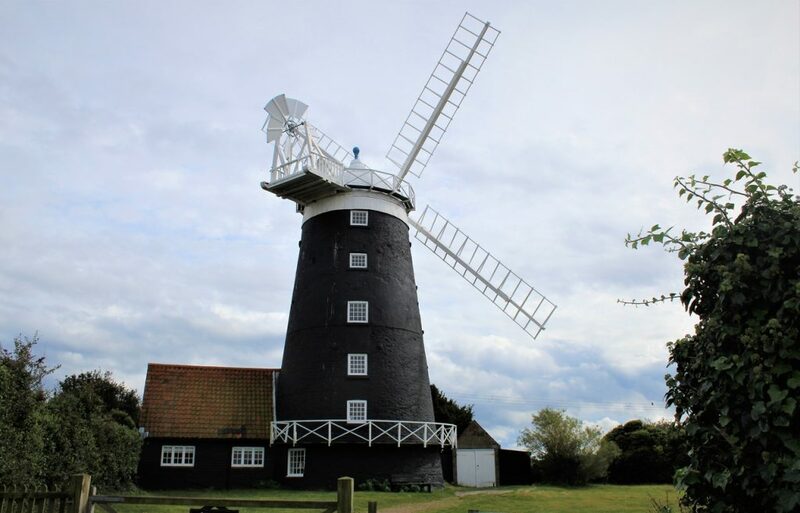 The Tower Windmill at Burnham Overy Staithe, a pretty cool National Trust holiday let. 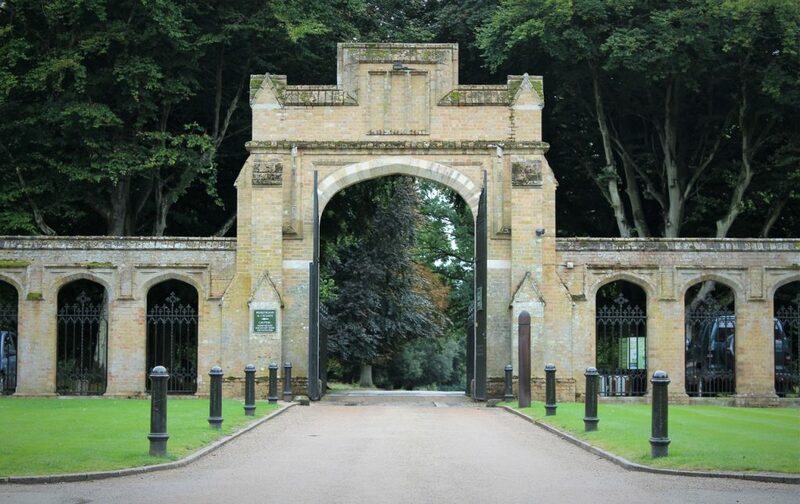 We decided not to visit Holkham Hall, as we’d already spent quite some time in the morning at the Sandringham Estate. 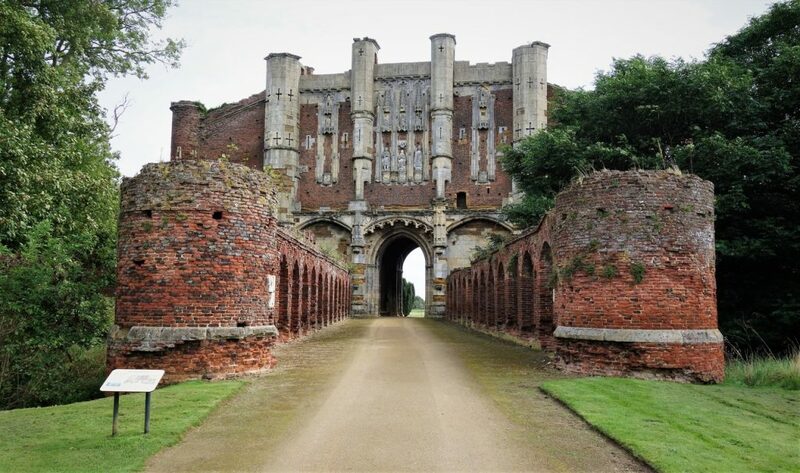 So we made do with just viewing Holkham Hall’s North Gate instead. 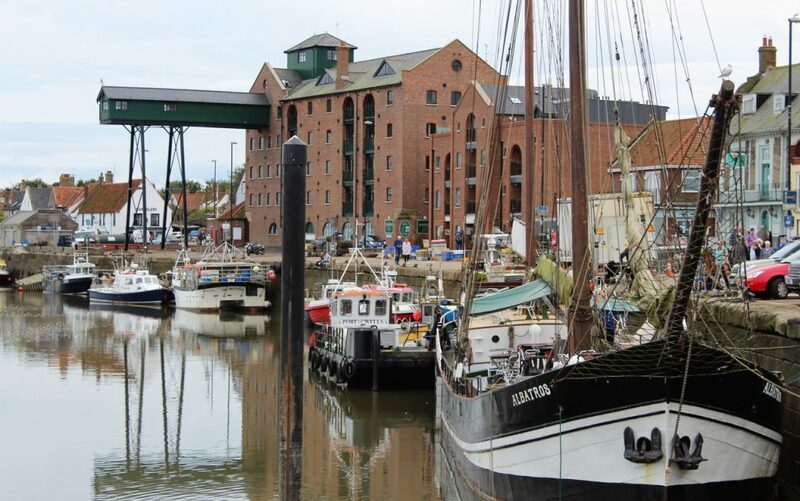 The very busy (with tourists) and picturesque Wells-next-the-Sea, with its impressive granary malting building and huge canter-levered gantry. 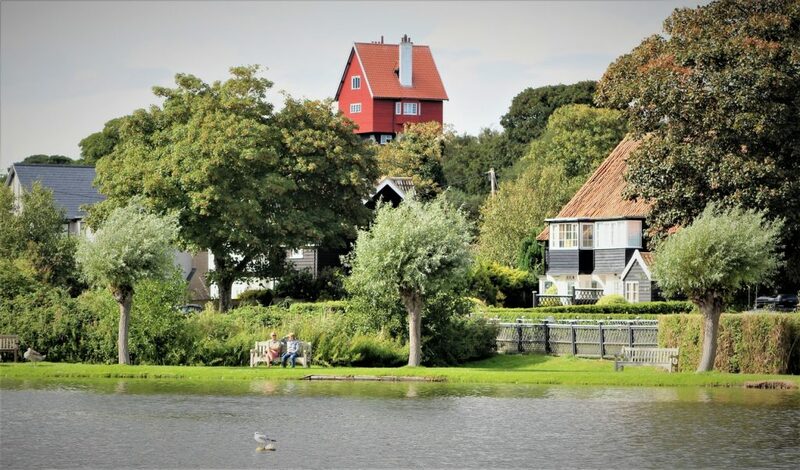 More picturesque villages as we drove along the coast to Blakeney, where we stopped for a coffee at the National Trust run Blakeney National Nature Reserve. 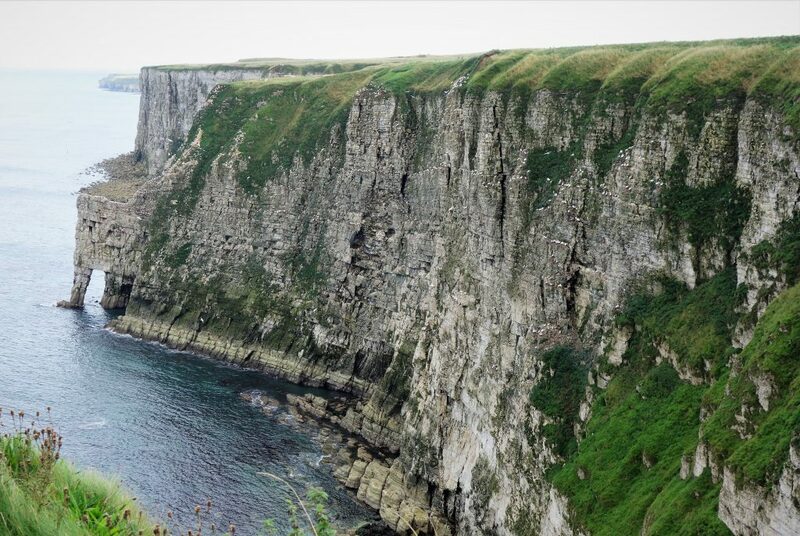 The largest seal colony in England, and a very important breeding ground for grey seal pups in the winter months. 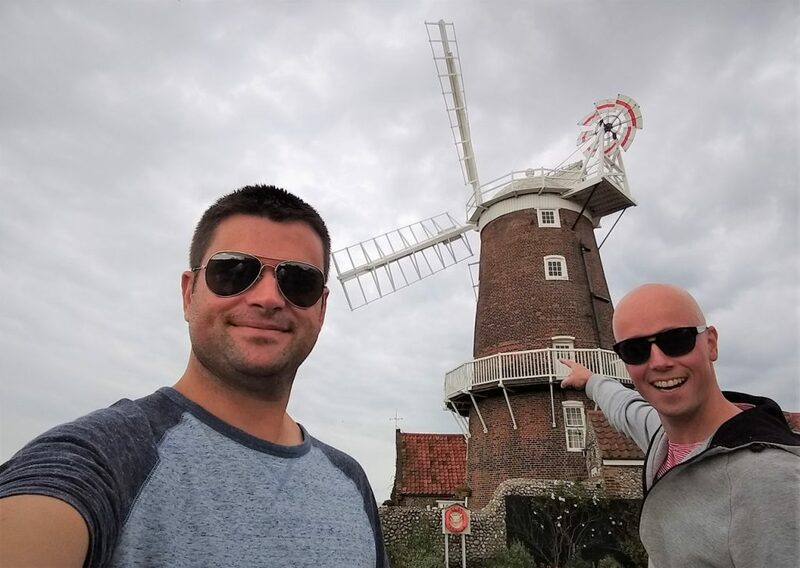 We almost gate-crashed a wedding party staying in Cley Windmill. 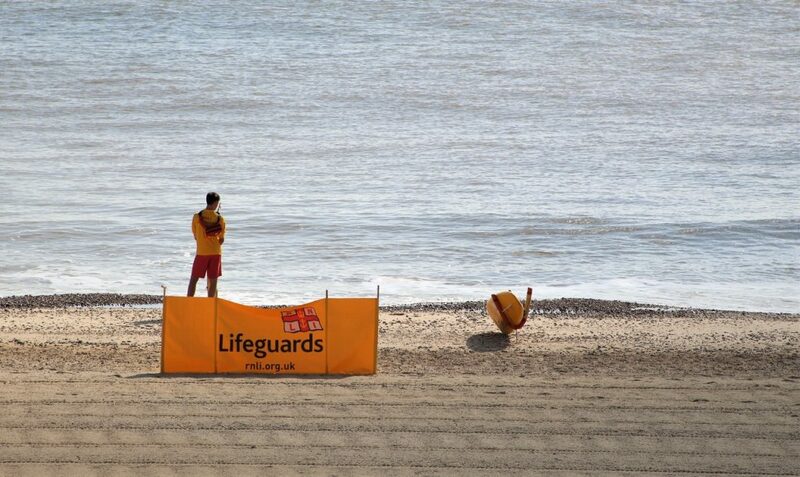 As we stopped to take photos in Sheringham several locals asked if they could help us. 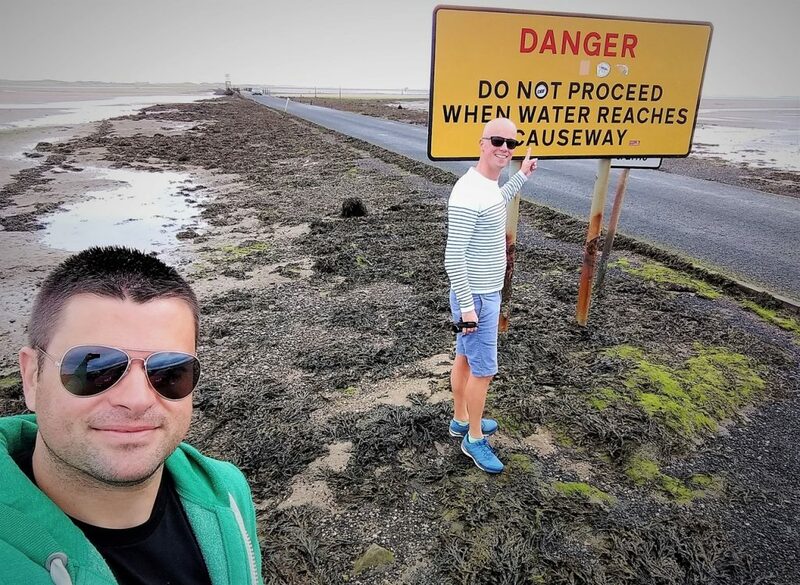 Very friendly, or we just looked lost. Amazing street art murals on the walls outside the local Mo Museum. 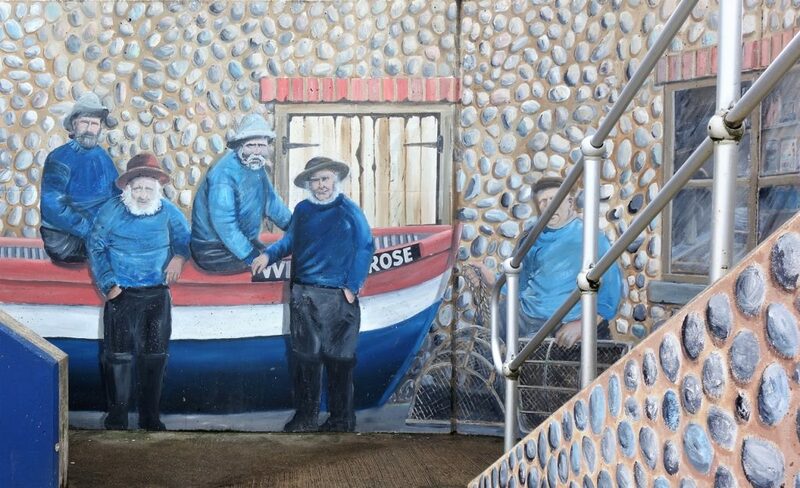 Fishermen posing for street art. 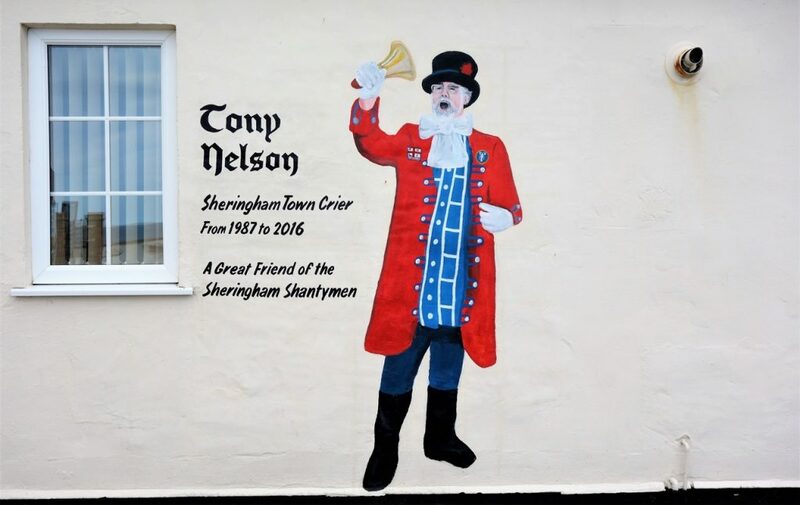 In memory of the local town crier. 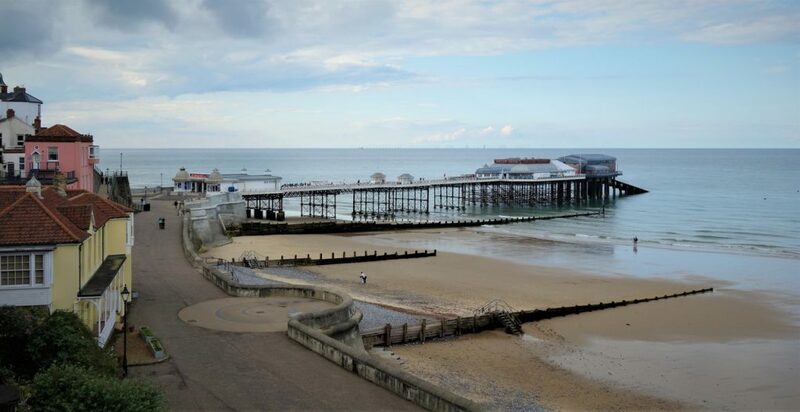 The Victorian Cromer Pier, famous for its end of the pier variety show, the last remaining one in the UK. 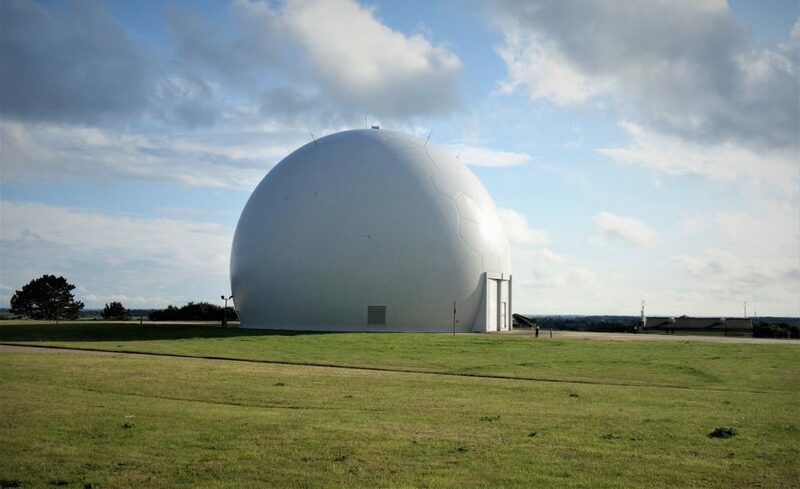 The radar station at Trimingham (AKA Trimingham Golf Ball). 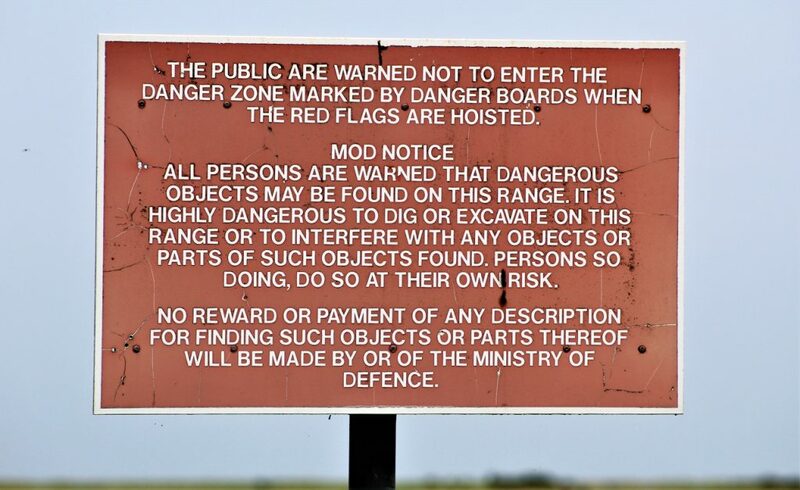 This location was established in the early 1940s to detect low flying German aircraft and E-boats. 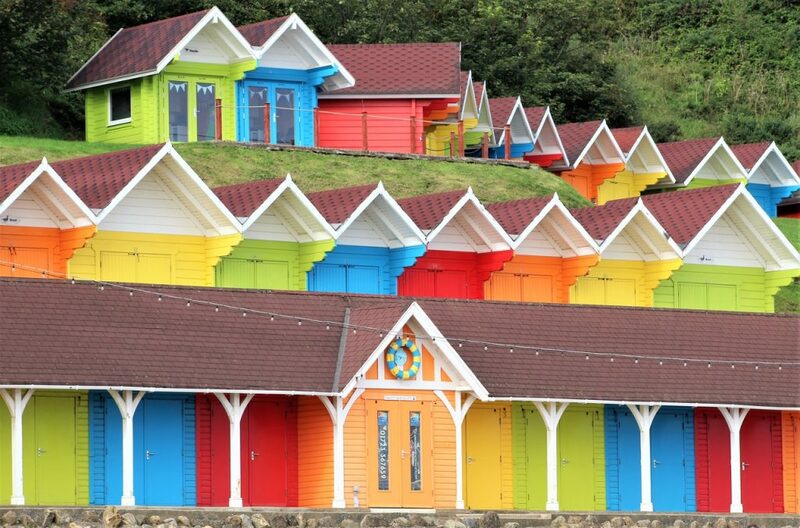 More colorful beach huts along Mundesley Beach. 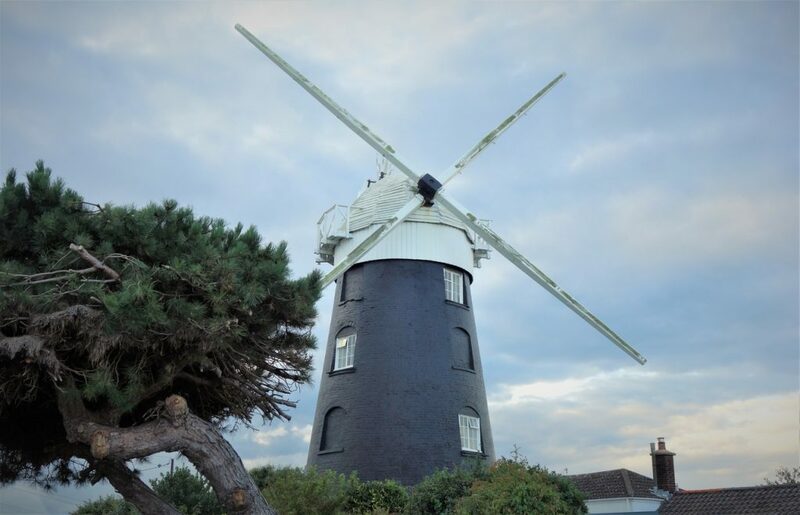 Stow Mill, the local corn windmill, just outside of Mundesley village, now another holiday let. 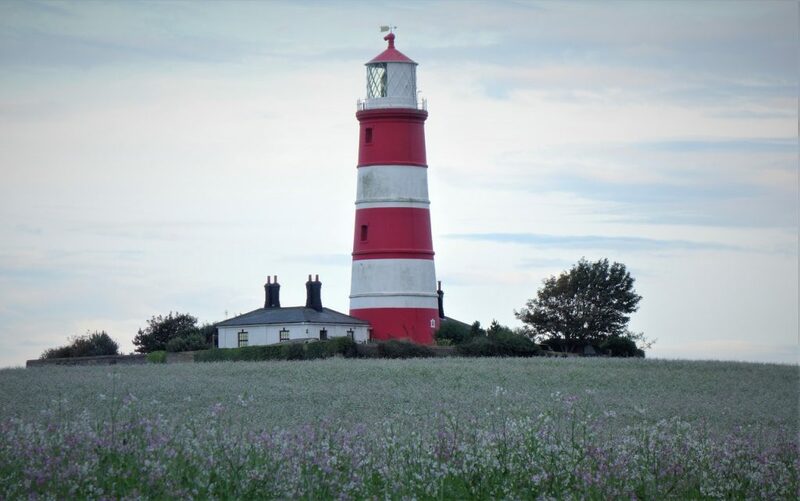 After driving through yet another lovely Norfolk village, we arrived at the very handsome Happisburgh Lighthouse across the fields. 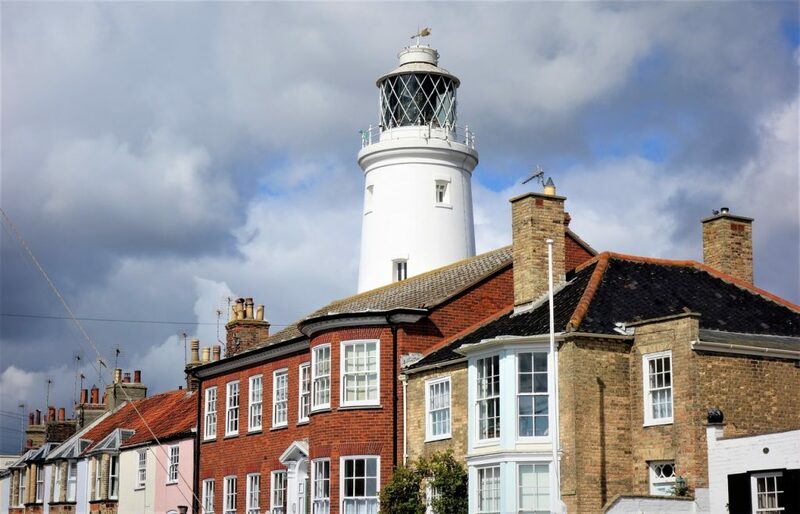 It’s the only independent lighthouse (run by local volunteers) in Great Britain, and the oldest working one in East Anglia. 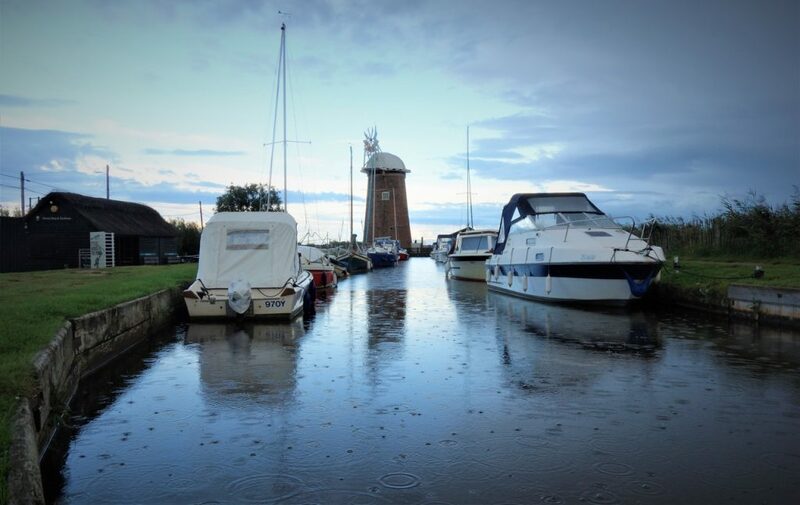 Eerie lighting as the dark rain clouds passed over us at the National Trust’s Horsey Windpump. As we drove past Winterton-on-Sea, we noticed this lighthouse protruding above the coastal houses. As we got close we realised it was also now a private home (holiday rental), so just took a quick photo from a neighbour’s drive and continued on our way. 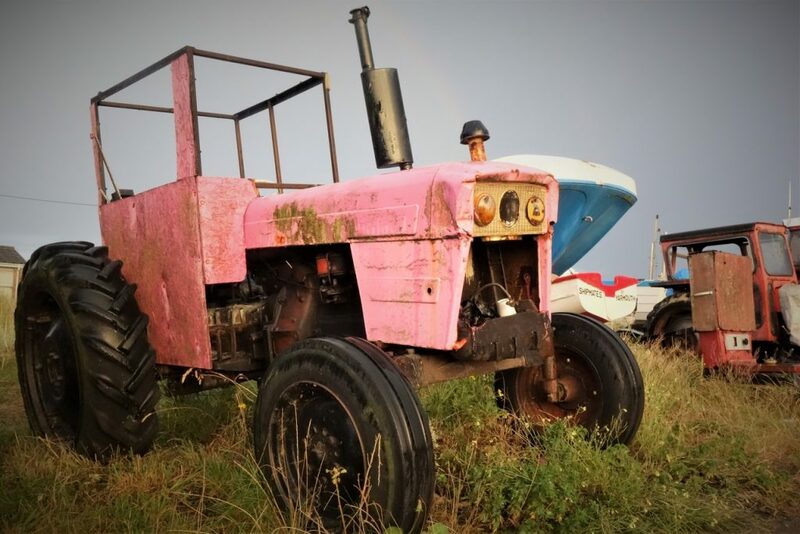 Whilst hunting down a fish & chip shop for our dinner, we came across brightly painted fishermen’s tractors behind the beach at Caister-on-Sea. 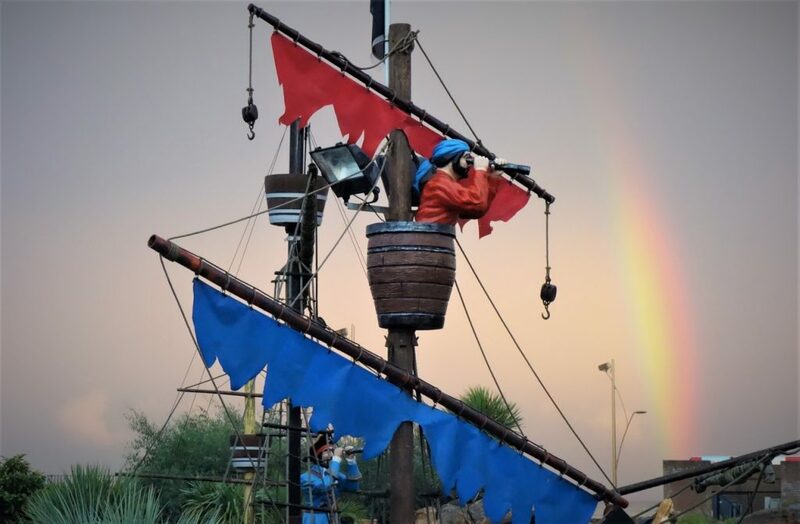 Great Yarmouth pirates on the lookout for a pot of gold at the end of the rainbow. No, we are not in Las Vegas. 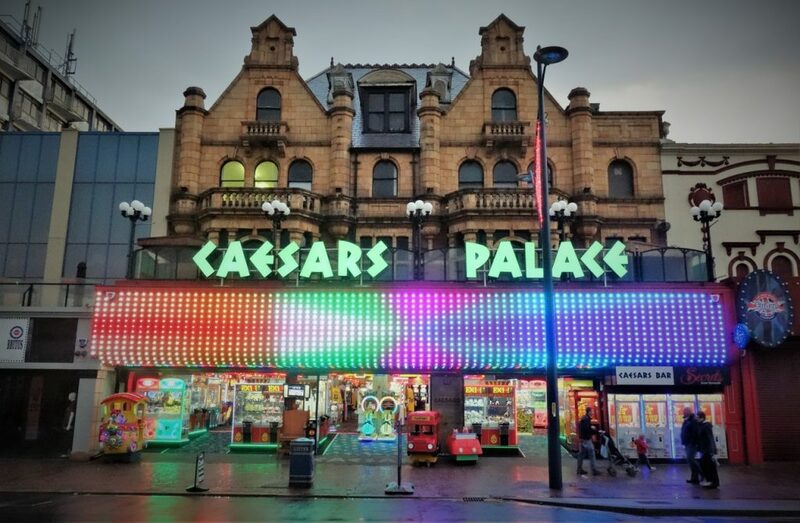 It’s the other Caesars Palace, the one in Great Yarmouth. 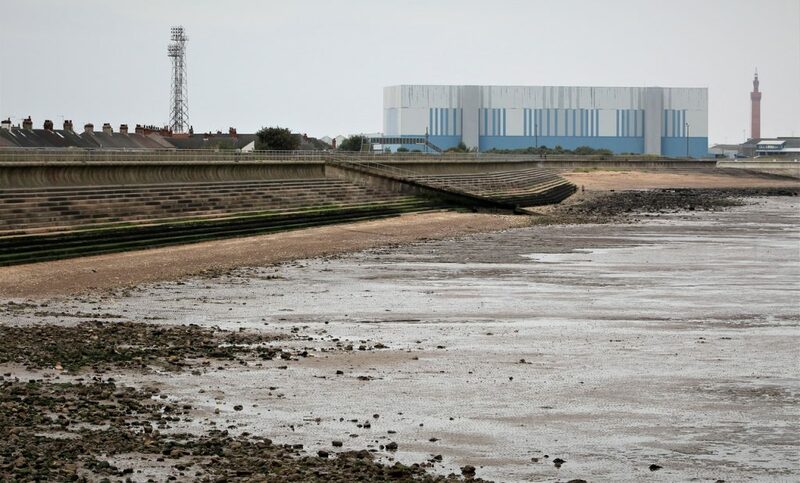 Finally, as the night closed in, we drove south along Great Yarmouth’s promenade reaching Peel Ports. 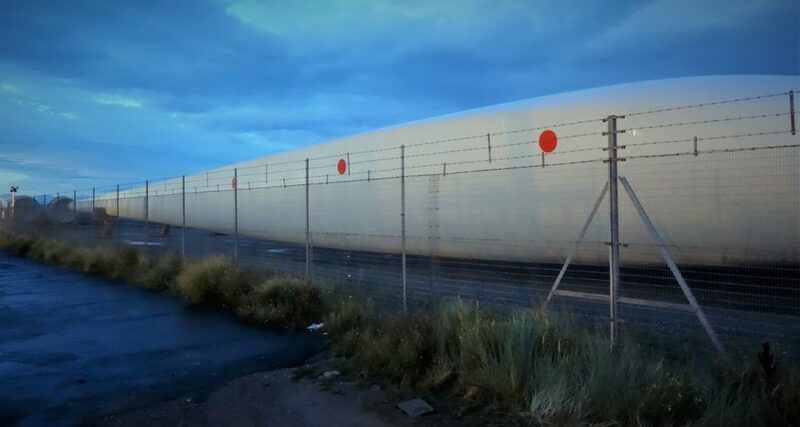 Giant wind turbine blades were sitting ready to be shipped to an off-shore wind farm. 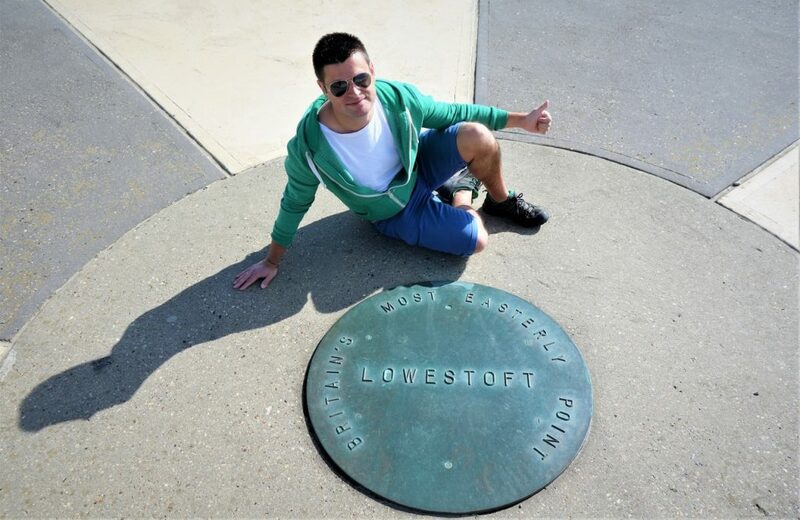 Next stop, down the road at Lowestoft for the night. 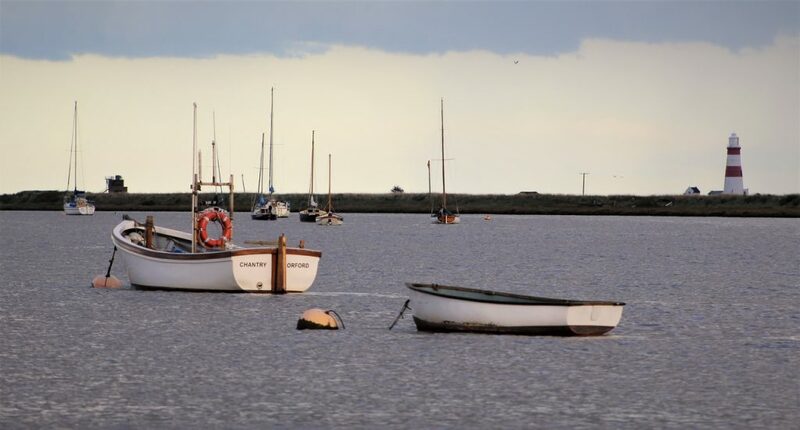 Despite a bright start to the morning, the weather was pretty miserable for the rest of the day, so maybe we didn’t see the coast from Hull to King’s Lynn in its best light. 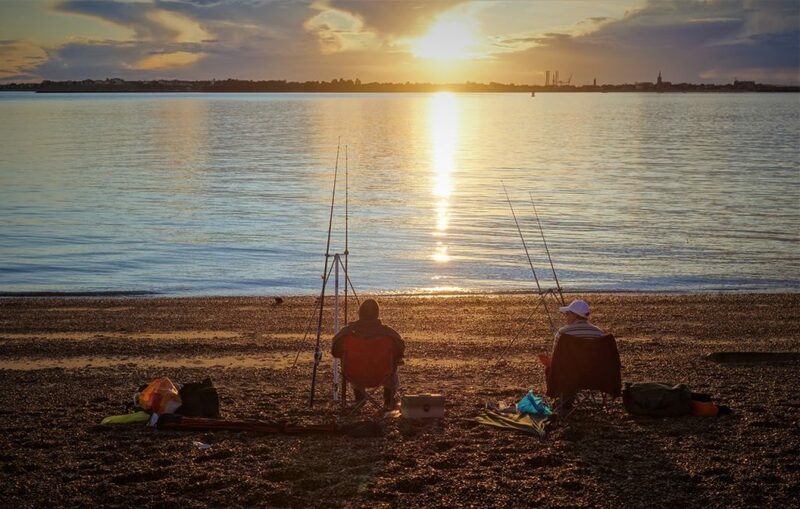 However, as usual we made the most of the day, rain or shine! 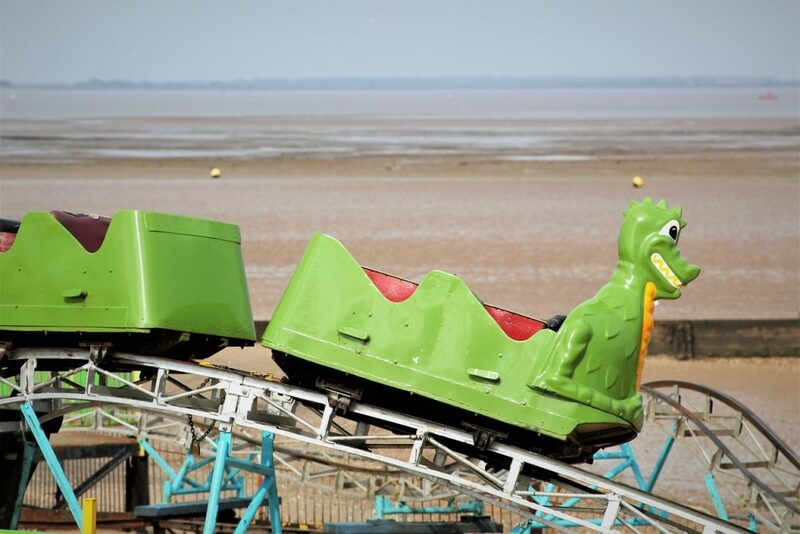 A dragon in its natural habitat on the beach at Cleethorpes. 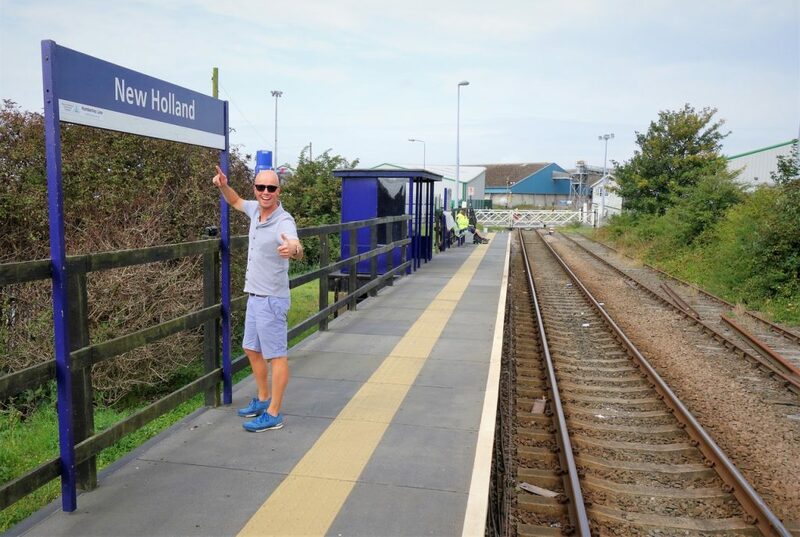 After leaving Hull, we found New Holland on the map just south of the River Humber. 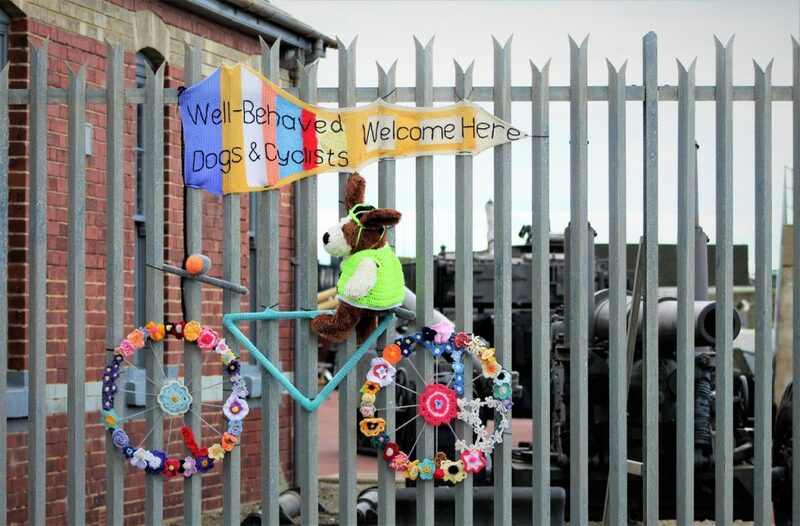 Perfect for a quick Dutch photo opportunity at the local (very quiet) station in the middle of the docks. 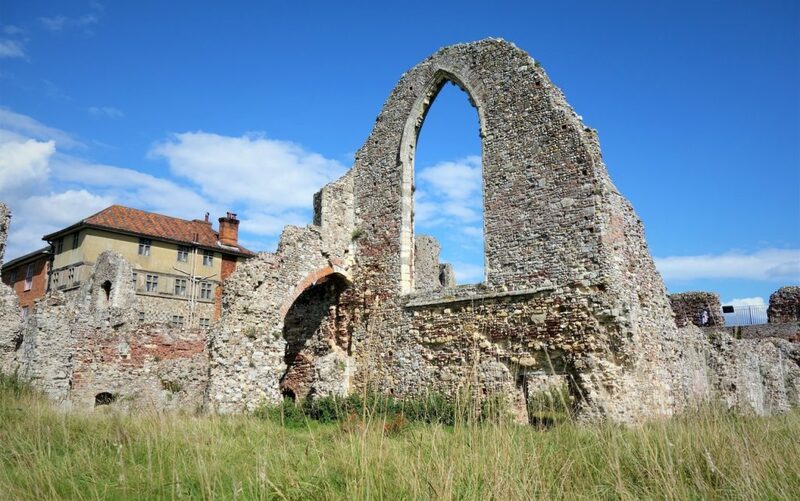 After a short ten minutes drive through the North Lincolnshire countryside we arrived at the remains of the Augustinian Thornton Abbey. 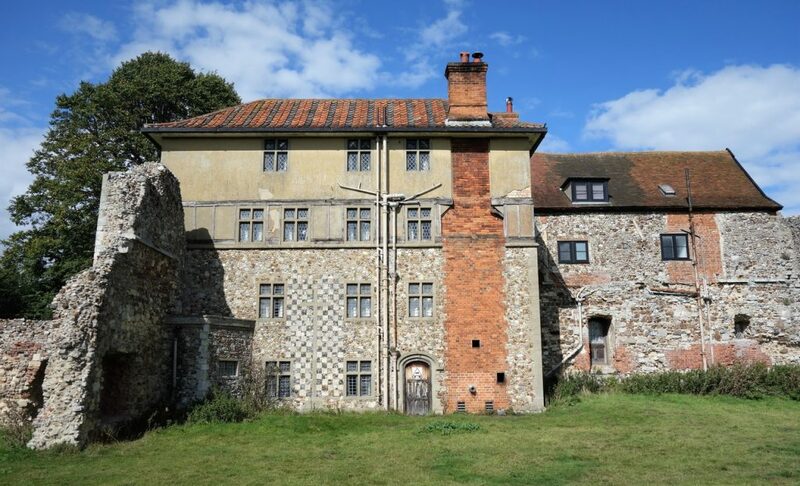 The fortified gatehouse, considered to be one of the finest in England. 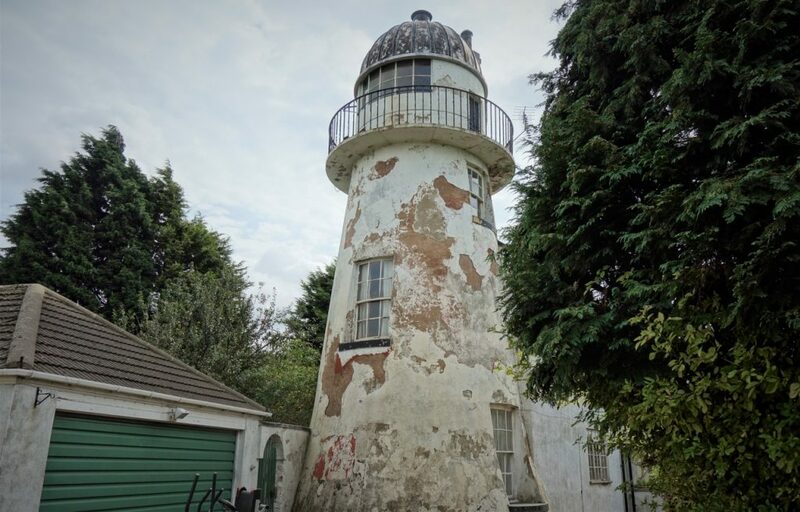 Killingholme North Low Lighthouse, looking a little unloved. 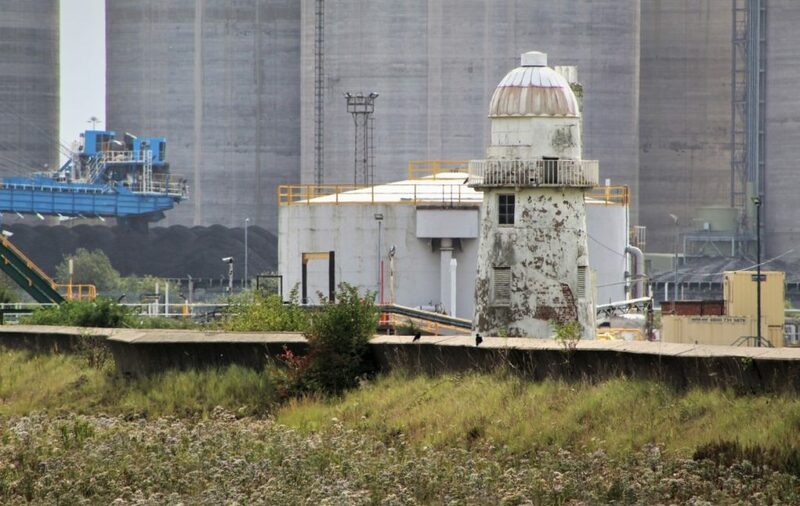 Its sister, the Killingholme South Low Lighthouse, wedged between a waterworks, coal docks and the Humber. 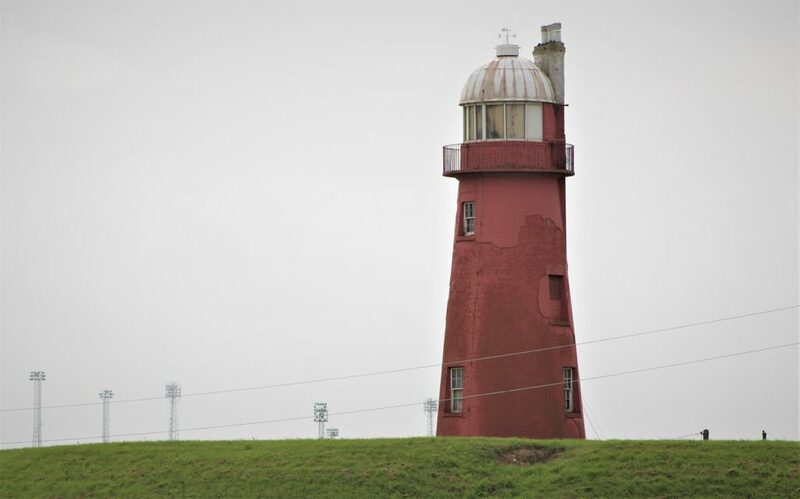 And finally its big brother, Killingholme High Lighthouse in the middle of the waterworks. 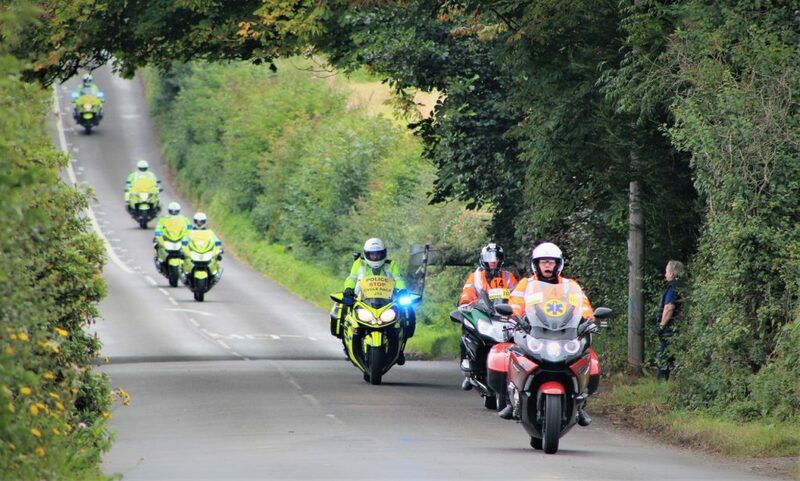 As we really weren’t sure if we should be here, we took some quick photos, then got back on the road to Grimsby. 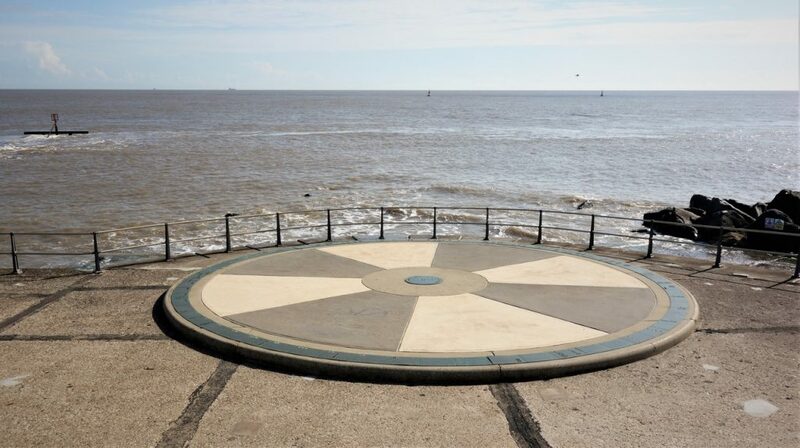 The view back to Grimsby from the north end of the promenade at Cleethorpes. 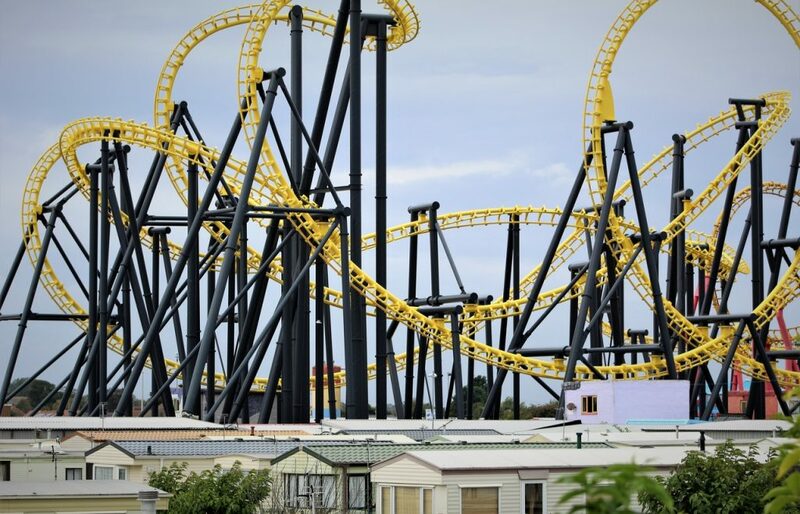 Not the most inviting view. 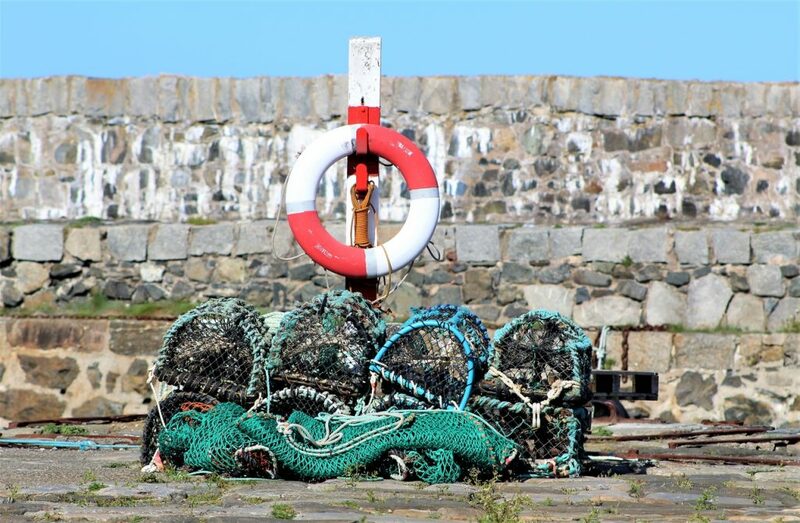 Grimsby once had the largest fishing fleet in the world, but lost that crown in the Iceland cod wars. 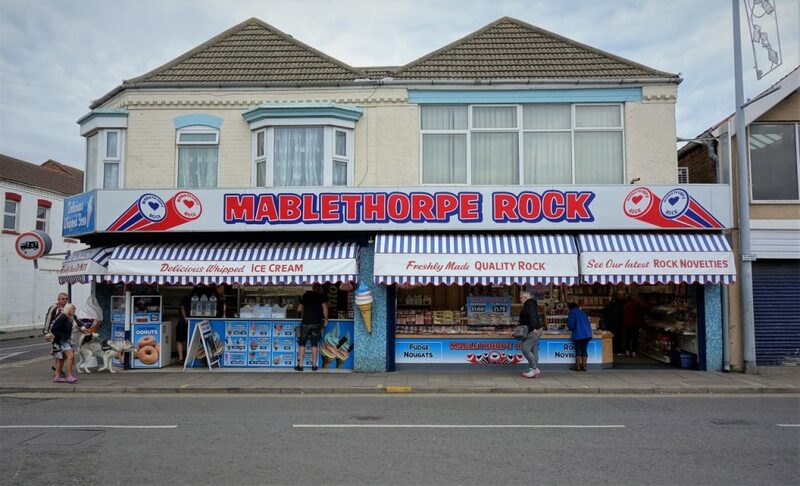 However, it still has the UK’s largest fish market. The view from our car as we sat eating our lunchtime sandwiches. 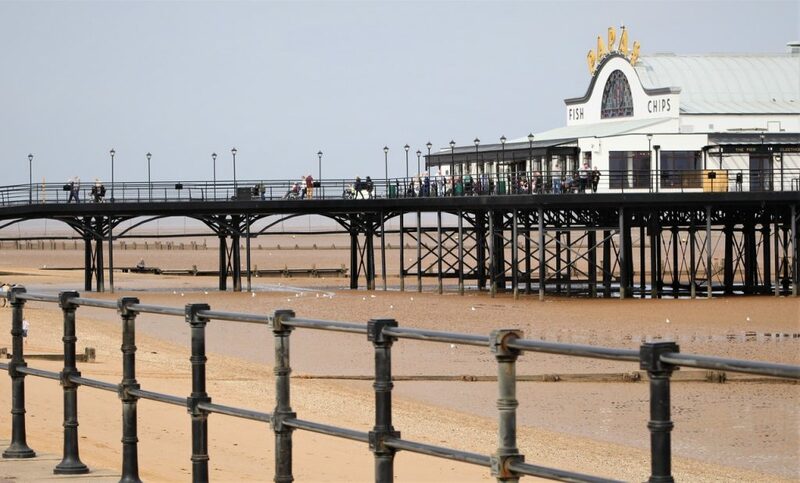 Cleethorpes Pier, now the largest fish & chip shop in the country! 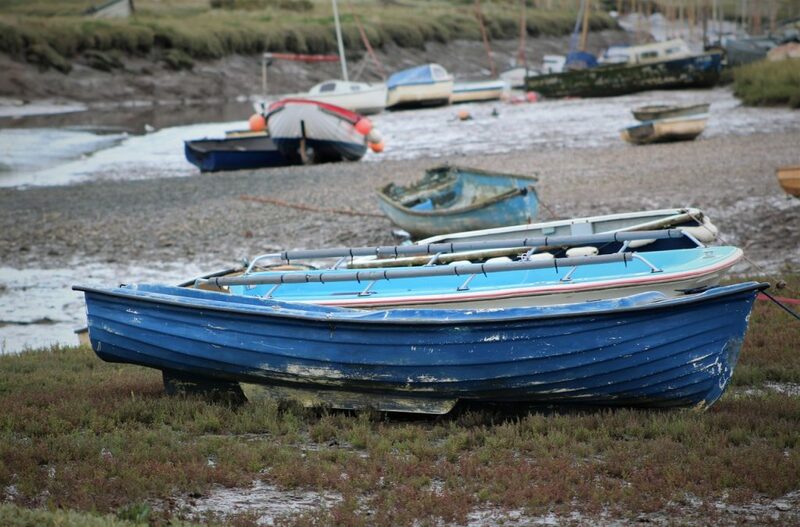 We only stopped briefly at the dunes and mudflats, as the sign put us off a little…. 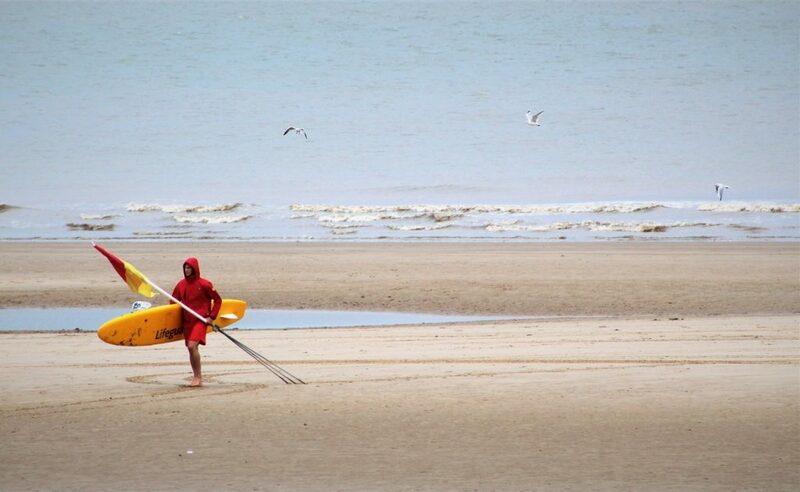 A very quiet day for the lifeguard at Mablethorpe, as we arrived he was already packing up for the day. 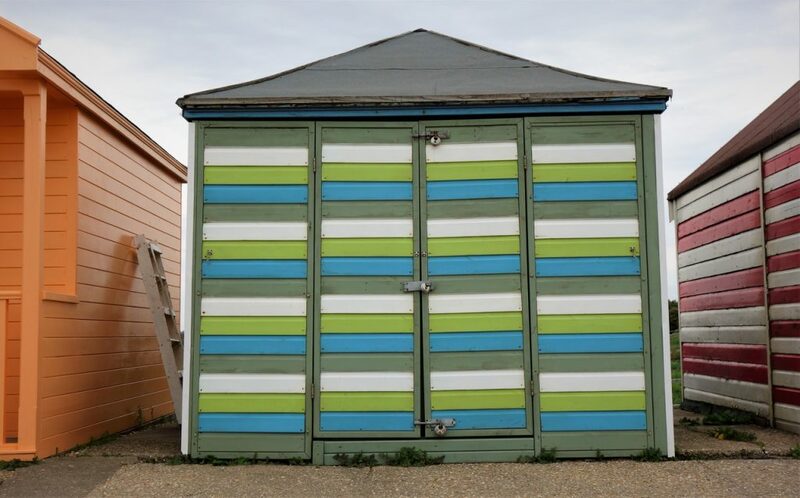 Stripey beach huts at Chapel Point Beach, quite a contrast to the Second World War defences that they had replaced. 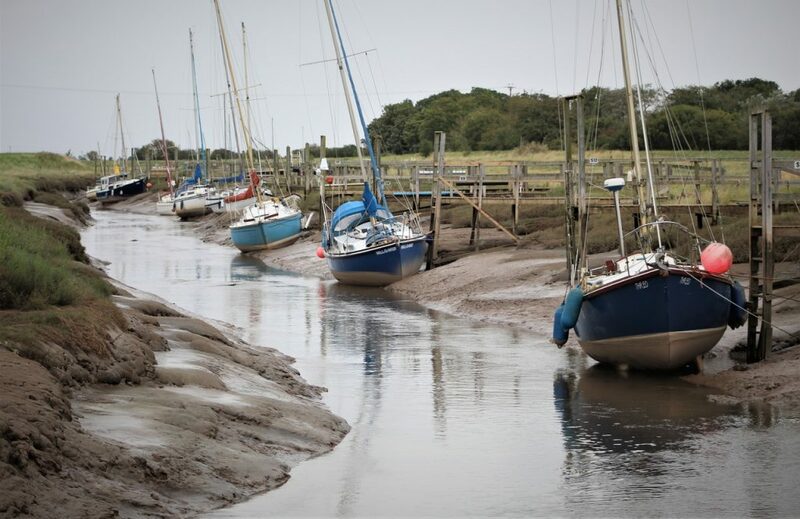 Boats moored along the very muddy (and slippery) Steeping River. 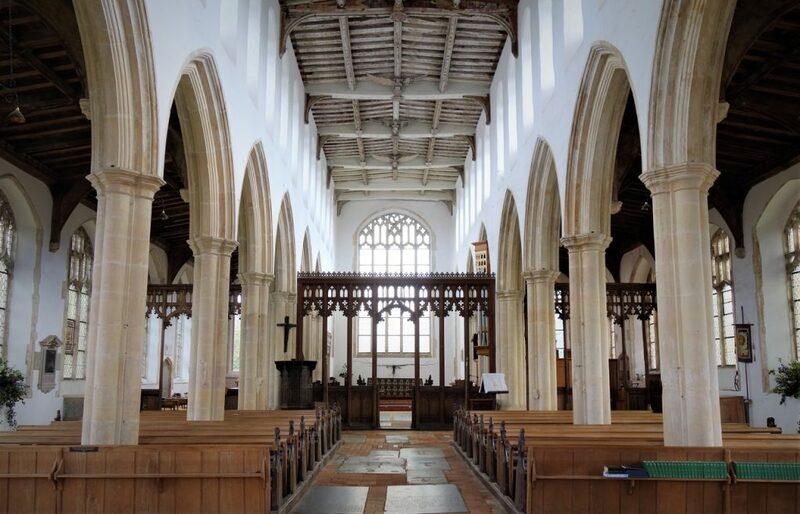 Stopping briefly at the early Victorian Barkham Street in Wainfleet All Saints. 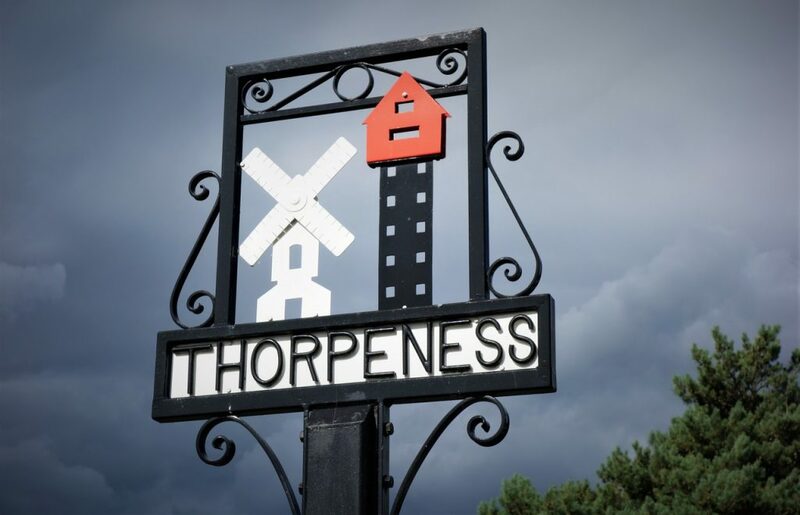 A street you would expect to see in London, and probably not in a small Lincolnshire town. 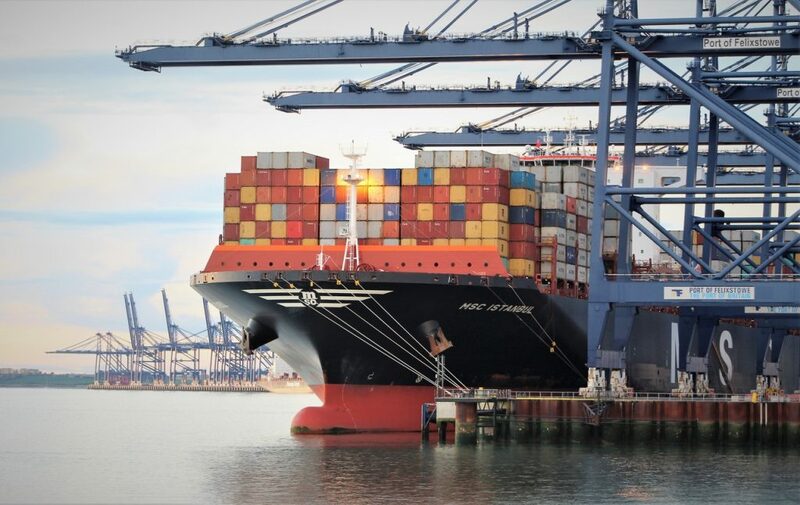 As we drove to King’s Lynn for the evening we decide to make our final stop of the day at Boston. As we approached through the flat fens we were drawn towards the huge 83m high St Botolph’s Church tower (AKA Boston Stump) sticking out on the horizon. 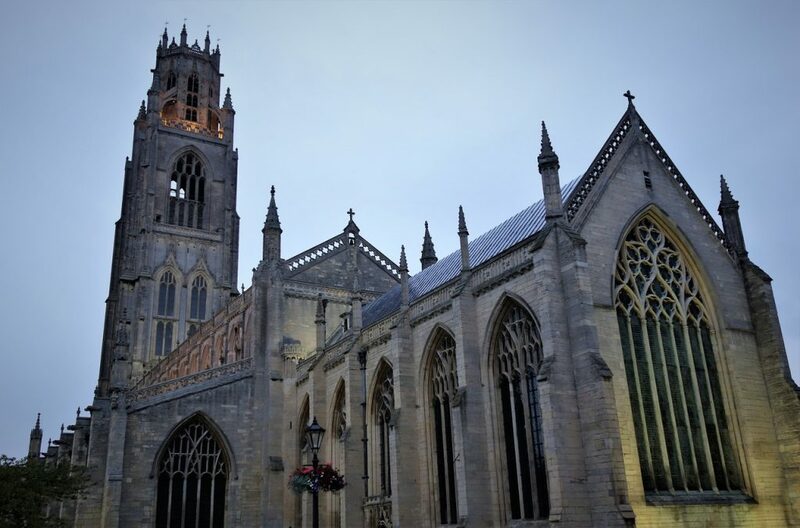 Considered to be the largest parish church in England (actually we assumed it was a cathedral). 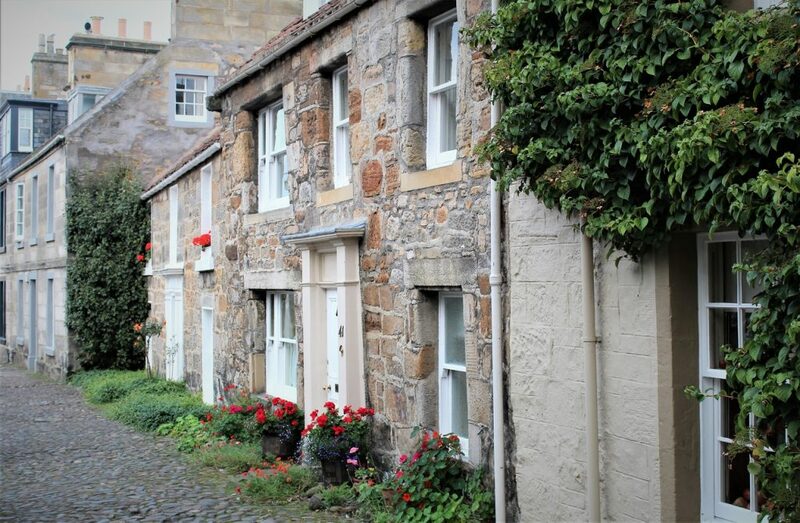 A lovely cozy market town feel to the cobbled lanes around the church. 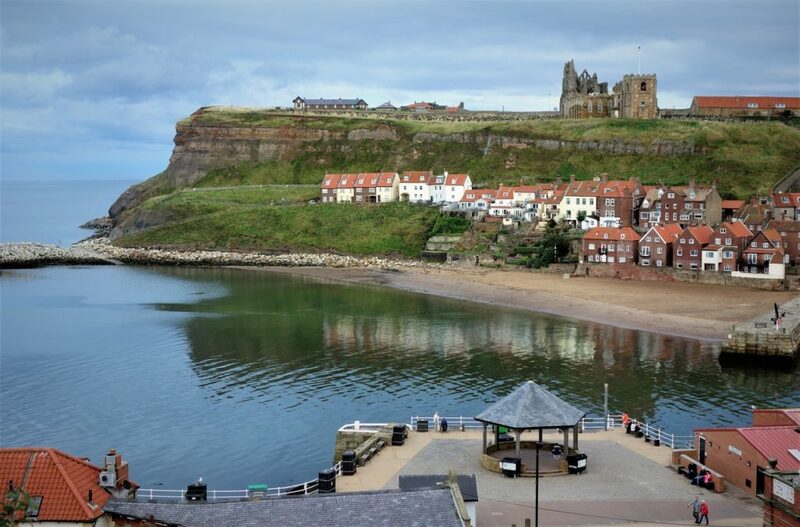 Another day of varied coastlines as we drove south from Scarborough to Hull on day thirty-two. As always, some nice little surprises along the way. 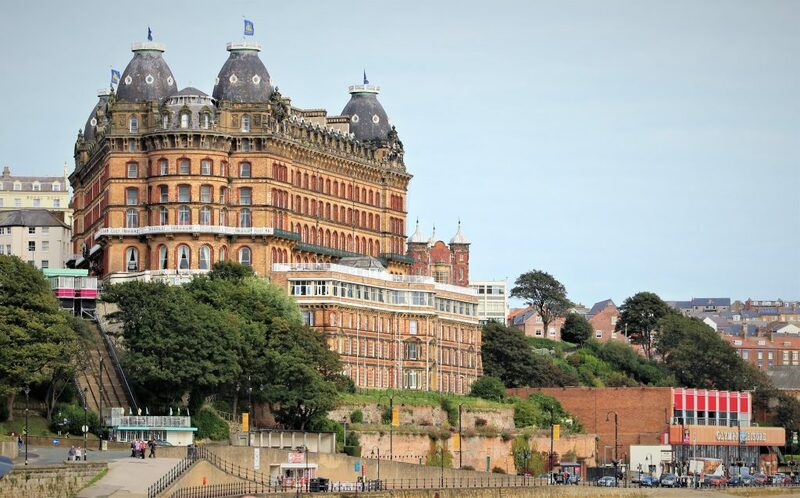 The Grand Hotel sitting proud above Scarborough’s south bay promenade and beach. The lighthouse along the pier with the Lunar Park funfair in the background. 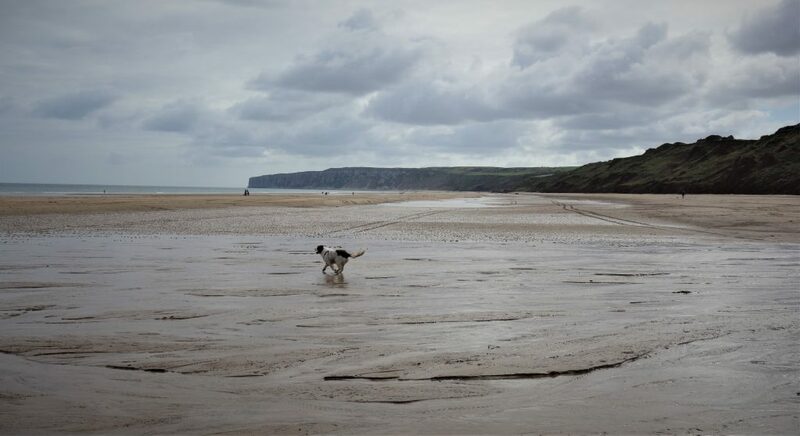 Wide open sands at Hunmanby Gap. 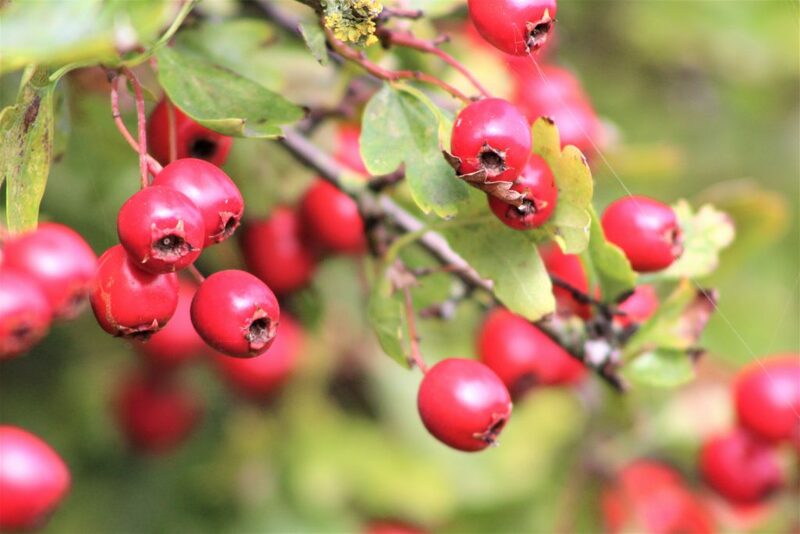 Juicy berries on the bushes surrounding the fields above Hunmanby Gap. 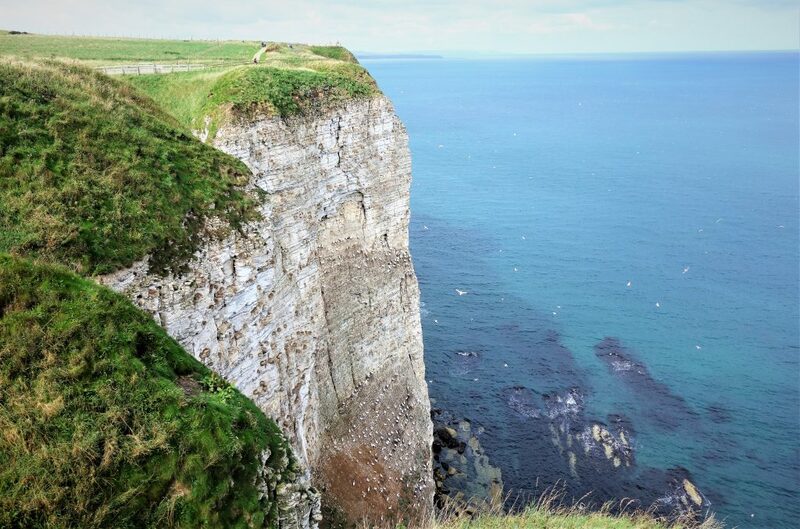 Great views of Bempton Cliffs at the nature reserve managed by the RSPB. 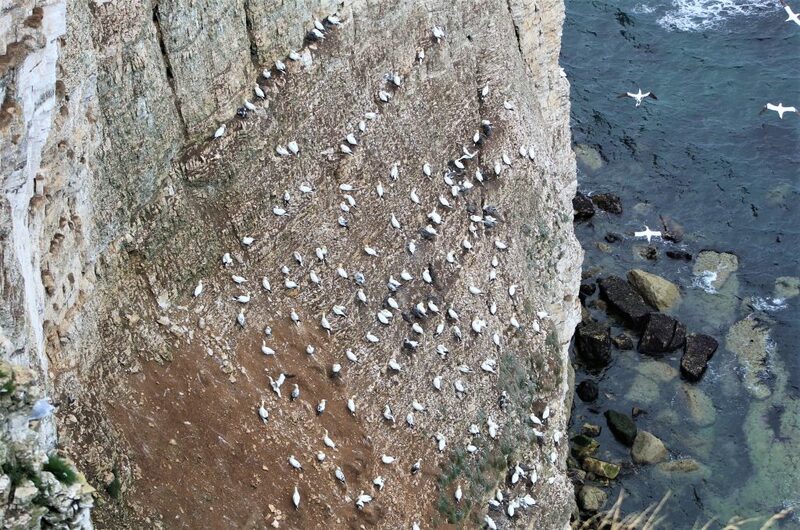 Hundreds of Gannetts clinging to the cliffs. 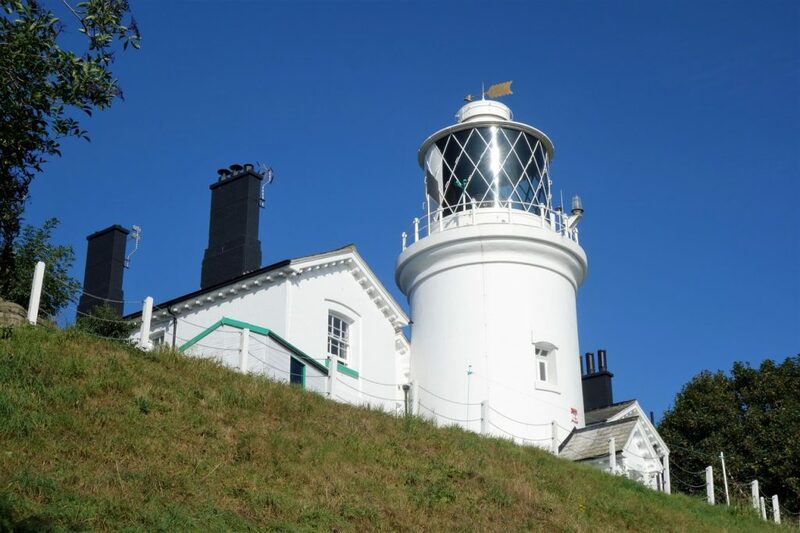 The current lighthouse, built in 1806. 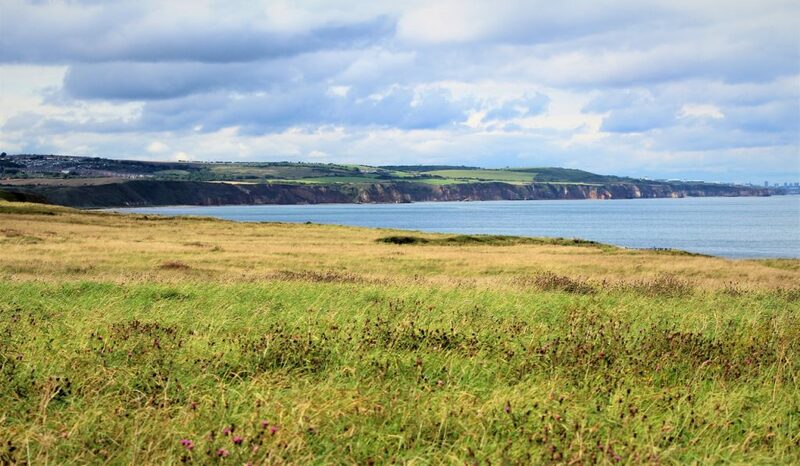 The view over Selwicks Bay at Flamborough Head. 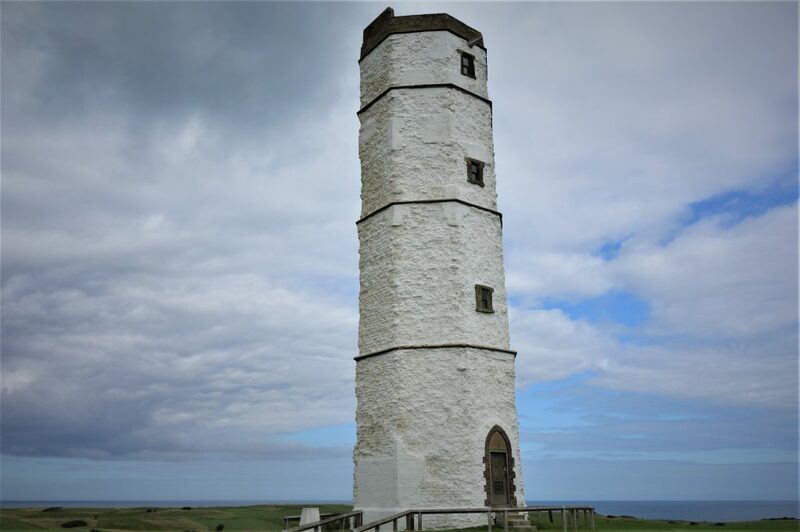 The Old Lighthouse at Flamborough Head, constructed from chalk in 1673, considered to be the oldest building of its type in England. 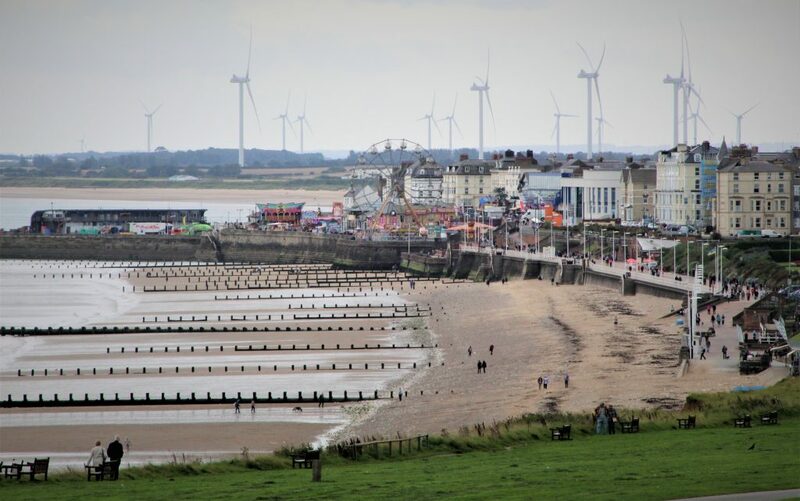 The view down to Bridlington from Sewerby, and again the now familiar sight of wind turbines along the coast. 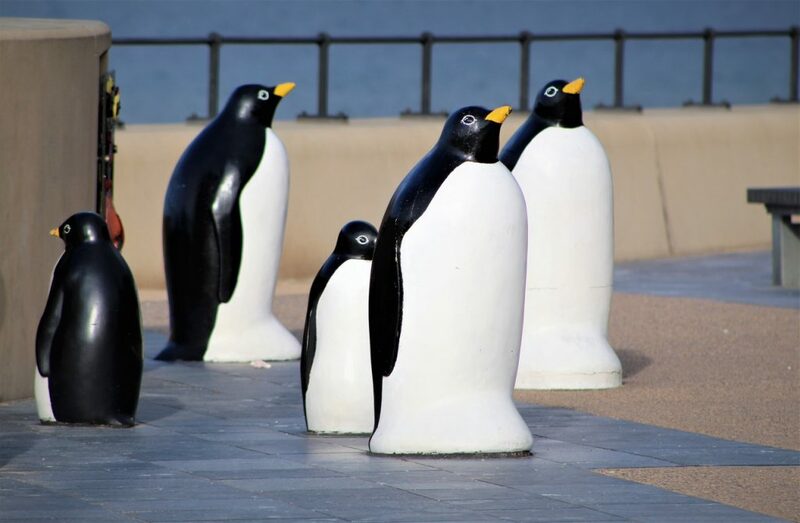 OK OK, not a real lighthouse, but they made an attempt on the grass banks of Bridlington Harbour. 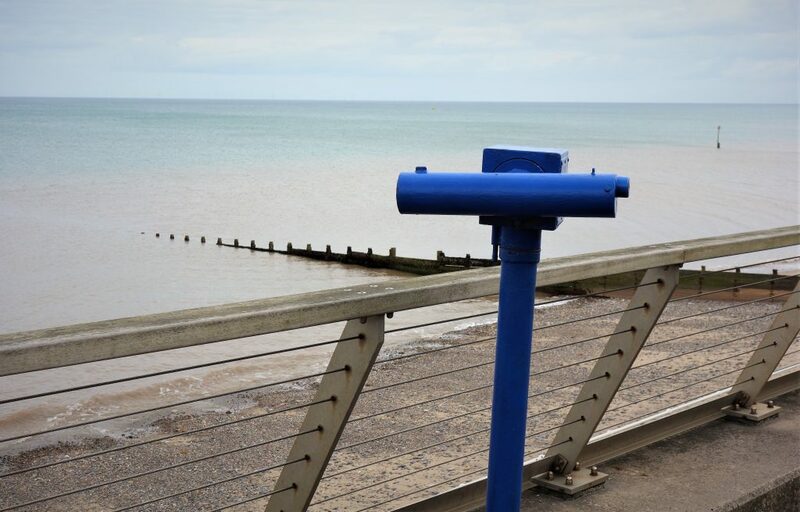 Hornsea Beach, not a huge amount to see on this grey afternoon. 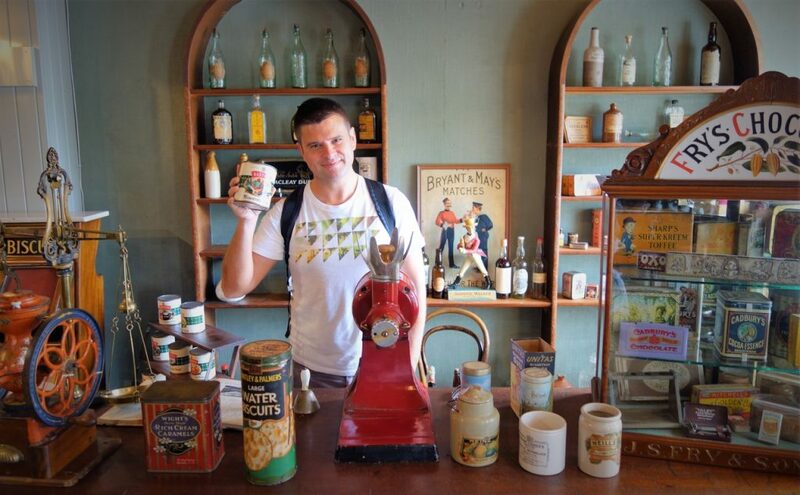 So we just had a quick coffee pick-me-up… and got on our way. 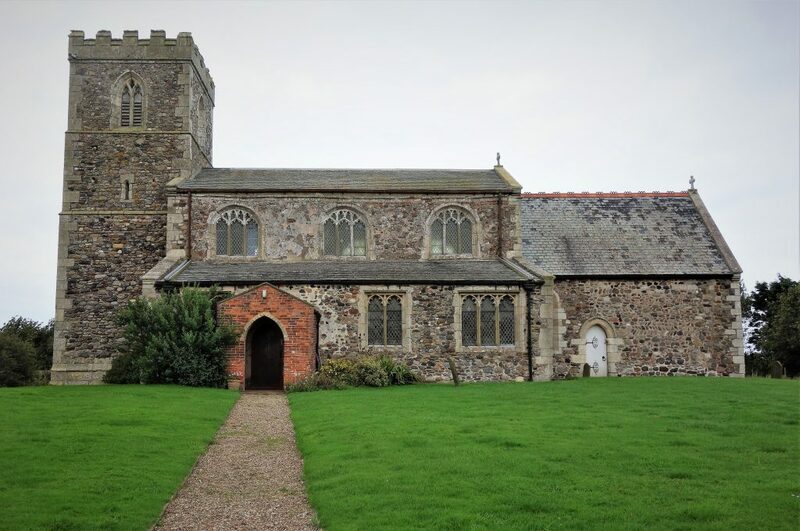 Trying to navigate our way to the coast at Tunstall, we got as far as the All Saints Parish Church. 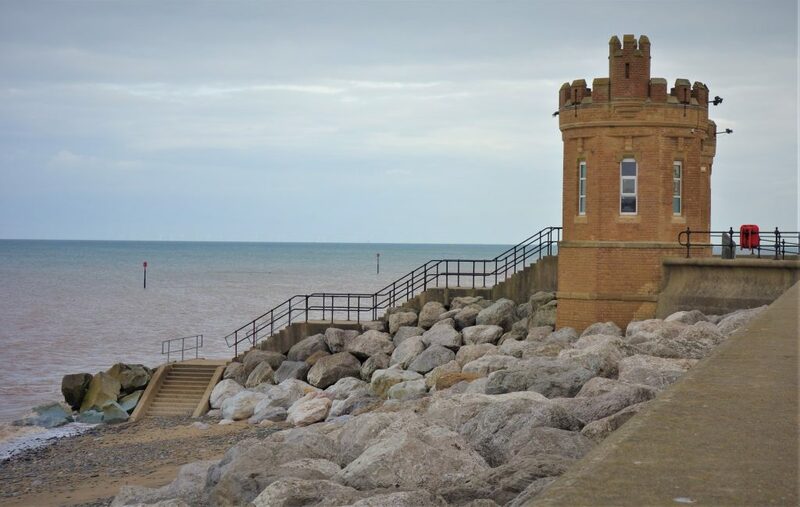 Withernsea Castle (if you can call it that), previously the entrance to the pier before it got washed away. 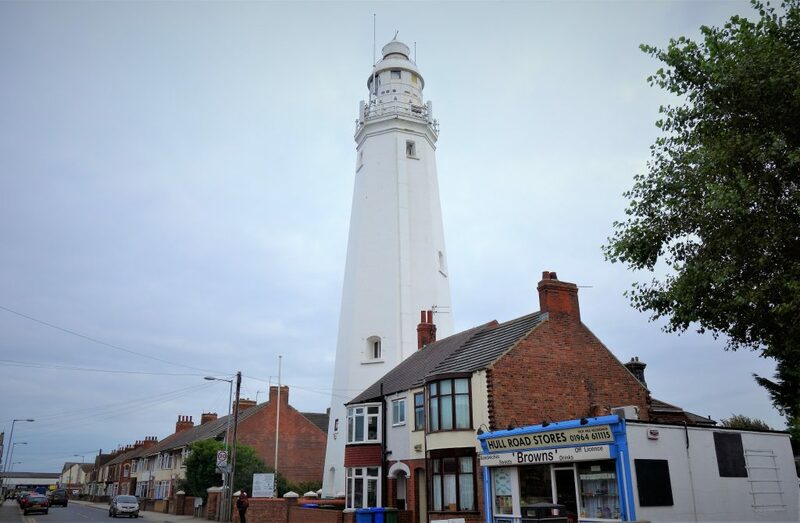 Withernsea Lighthouse curiously sitting inland in the middle of a row of houses. 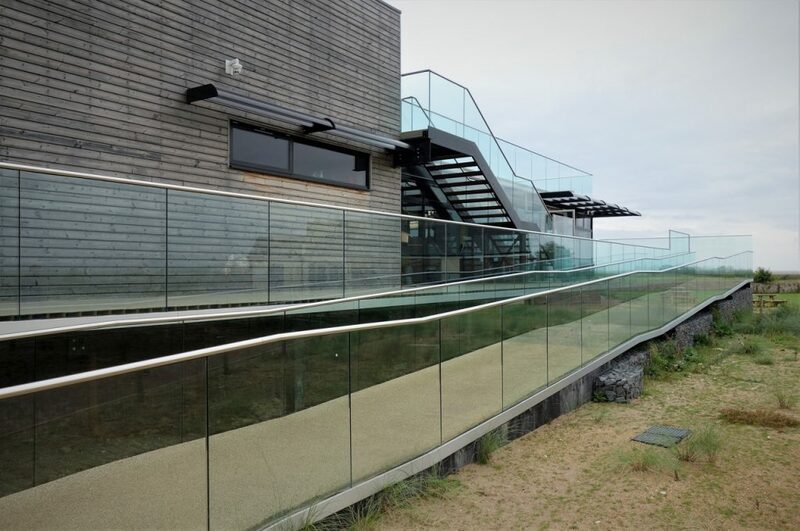 The Holderness coastline is the fastest eroding in Europe, at 2.1m each year! 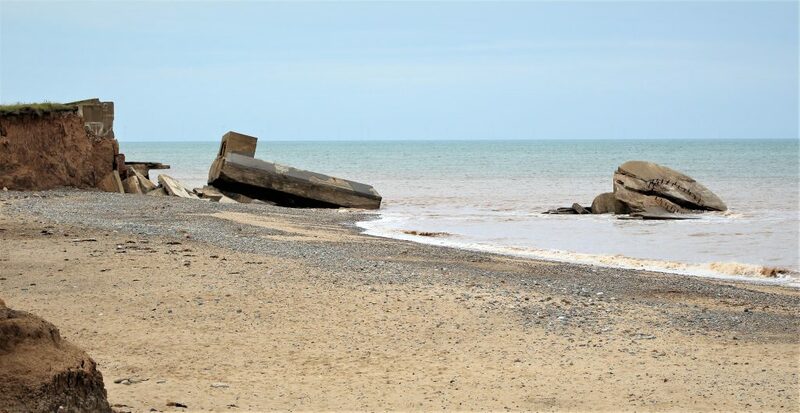 The beach at Kilnsea was littered with bits of road and buildings that had collapsed into the sea. 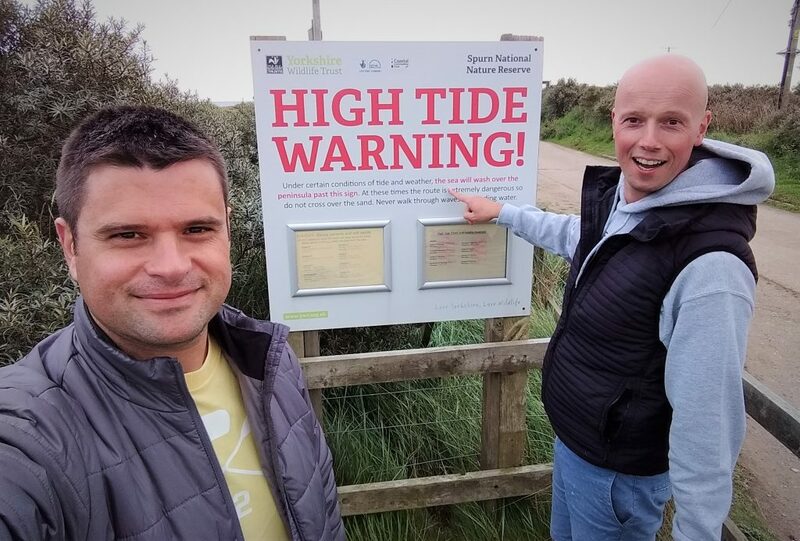 Another high tide warning, so we decided not to proceed along the road to the tip of Spurn Point…. 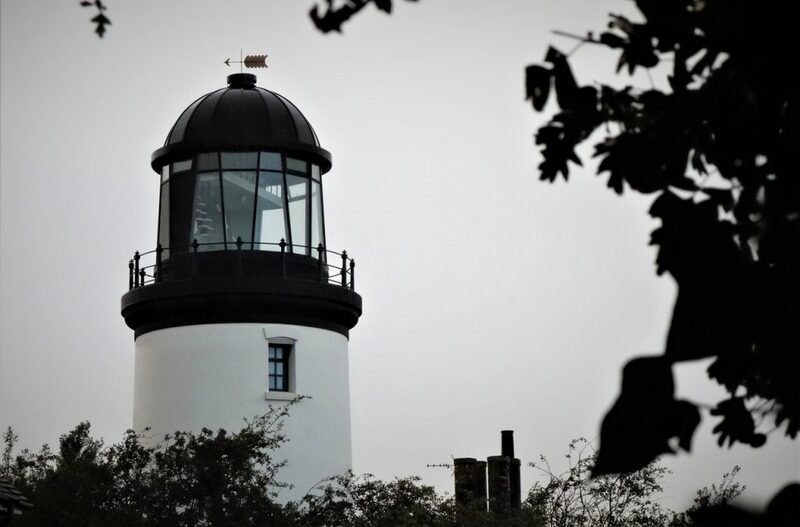 … instead we viewed the Lighthouse from a safe distance. 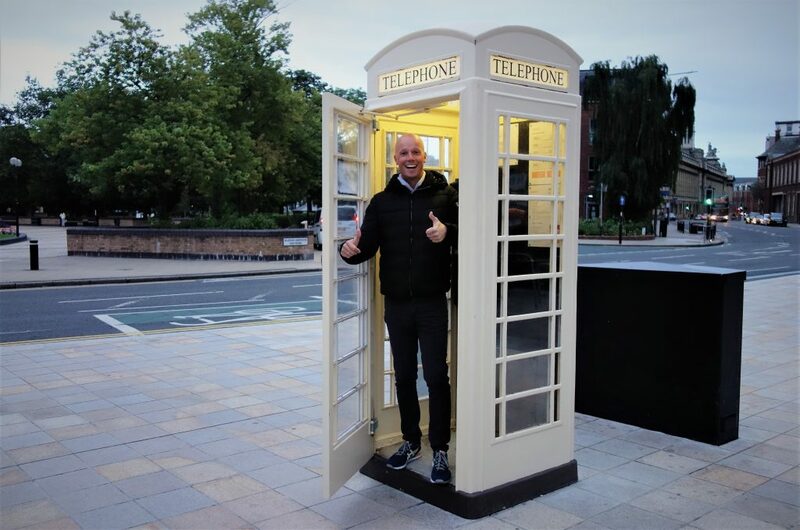 A quick walk around Hull before dinner, and Jarno got very excited about spotting a cream coloured phone box. 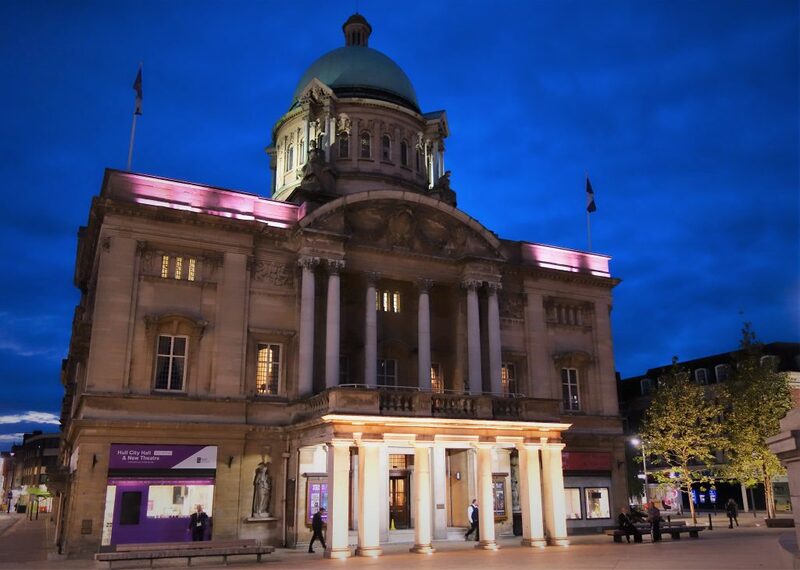 The grand Hull City Hall in Queen Victoria Square. 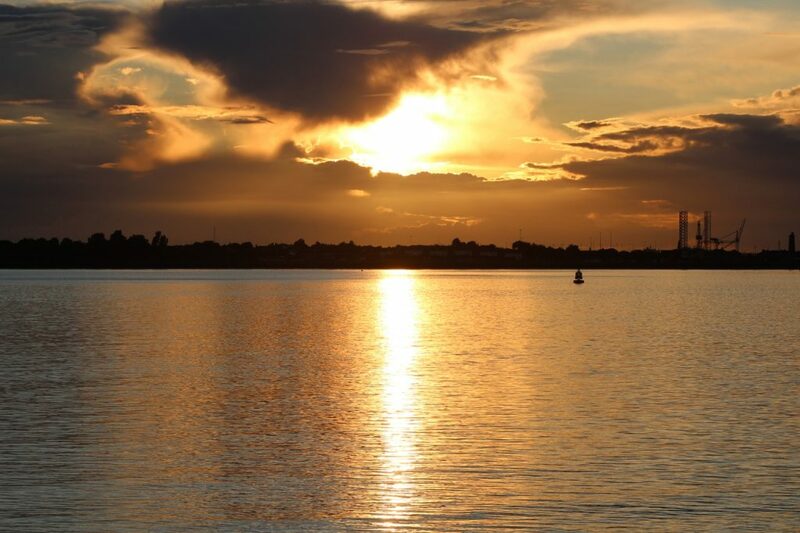 From the little we saw of Hull we were surprisingly impressed. We’ll have to come back when we have more time. 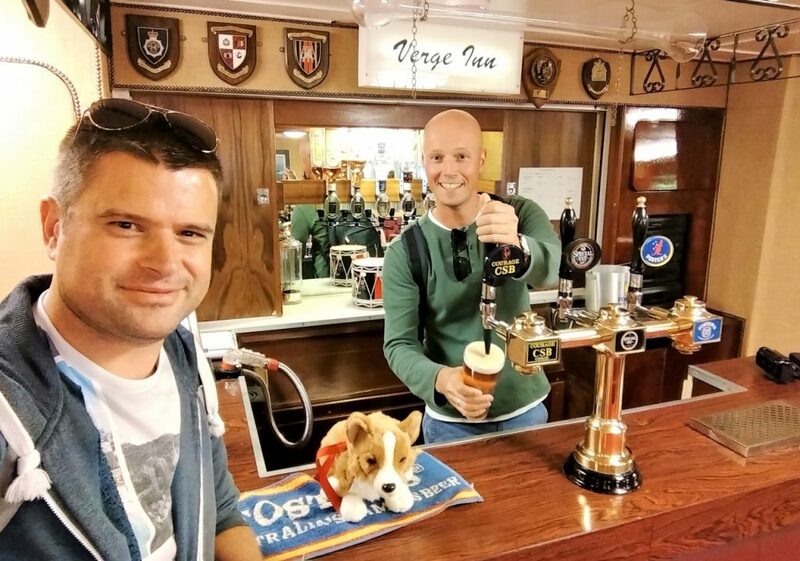 It’s day 31 and we are driving down from Newcastle along the Durham Heritage Coast and into the North Yorkshire Moors. 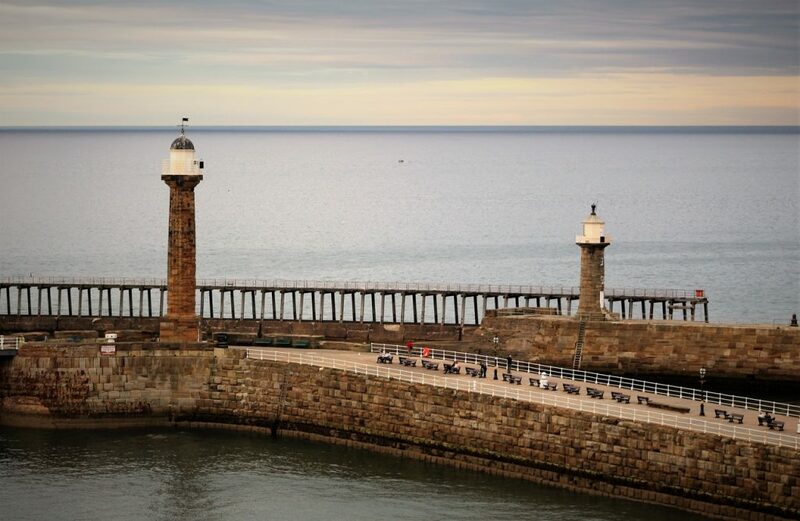 Plenty of lighthouses, and a surprising mixture of coastlines from industrial to picturesque. 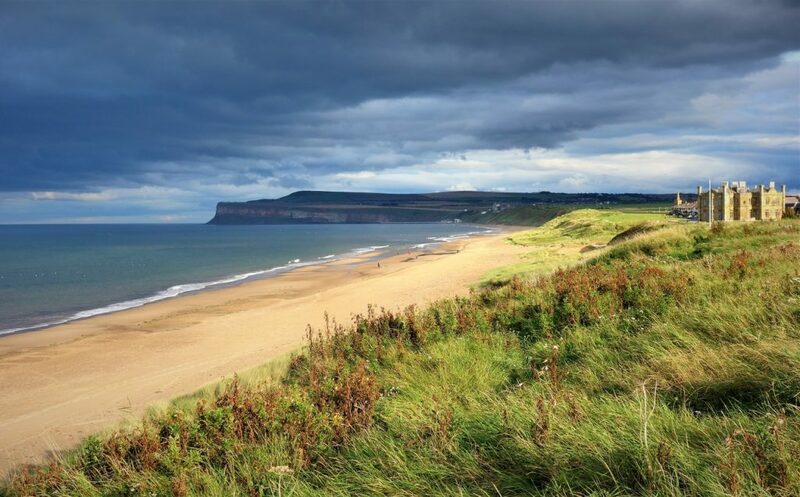 Views towards Saltburn and Hunt Cliff from Marske-by-the-Sea. 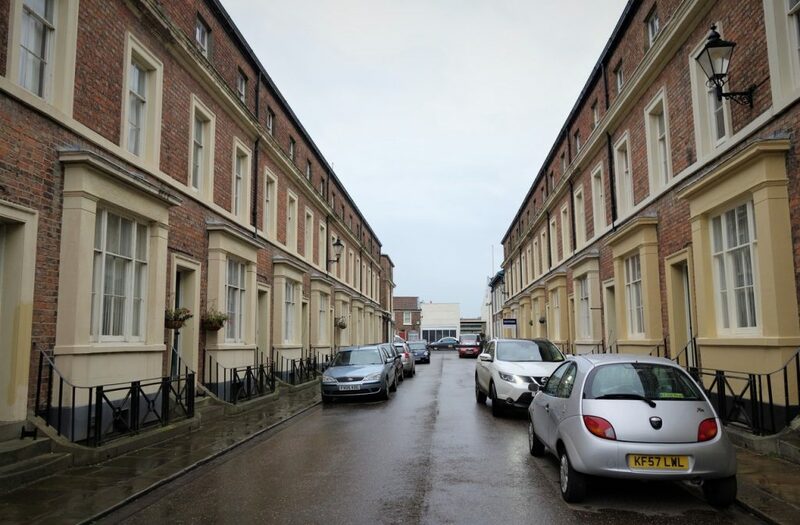 After a small potter around the shops in a very rainy Newcastle city centre, we managed to get lost driving out to South Shields, and ended up driving over the Tyne Bridge three times! 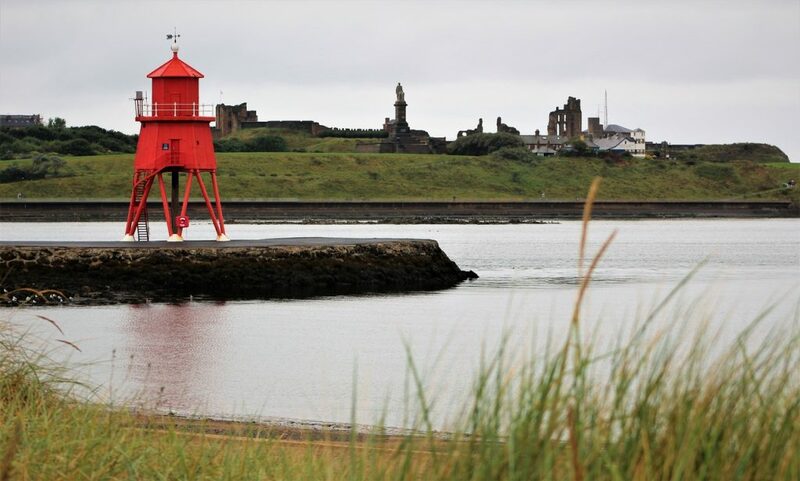 Eventually we arrived at Littlehaven Beach and Promenade, with its views past the bright red lighthouse to Tynemouth Priory and Castle on the north side of the Tyne. 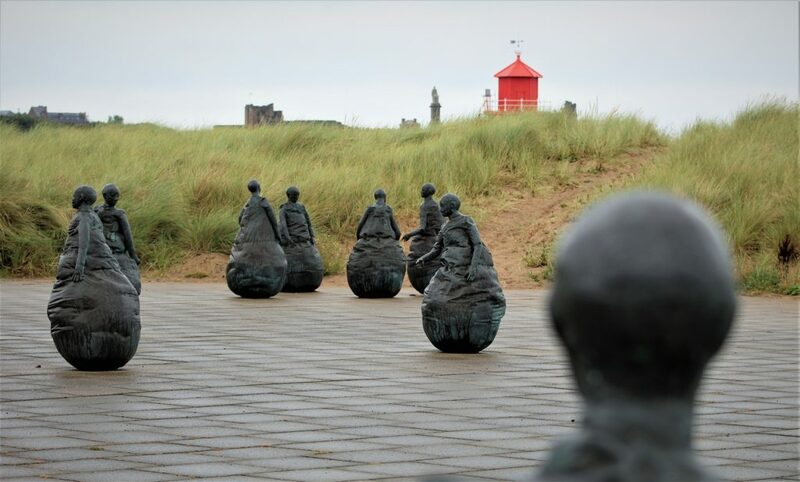 An intriguing cluster of sculptures by Juan Munoz, called ‘Conversation Piece’ at Littlehaven Beach and Promenade. 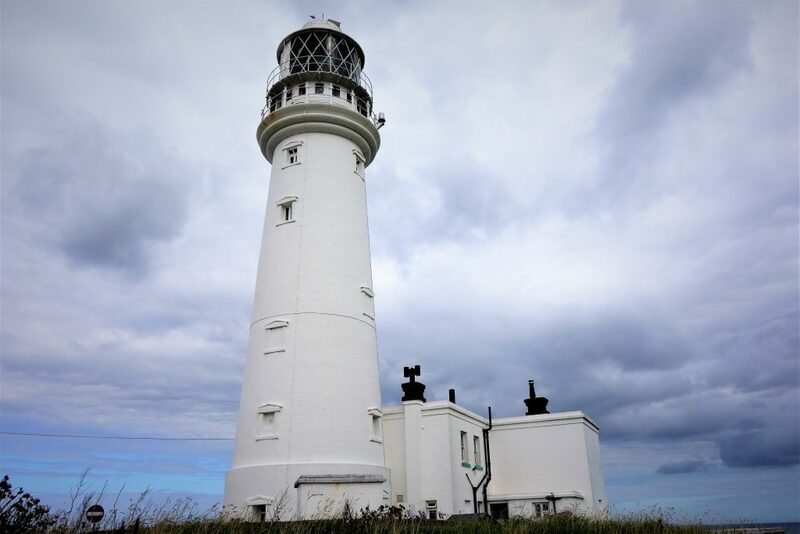 Souter Lighthouse precariously close to the cliffs at Marsden Bay. 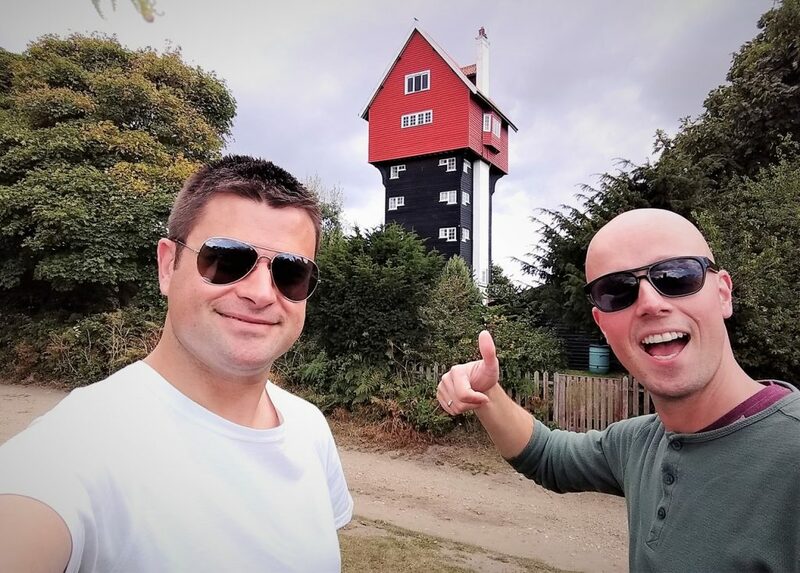 Another National Trust property, so we made use of our membership. 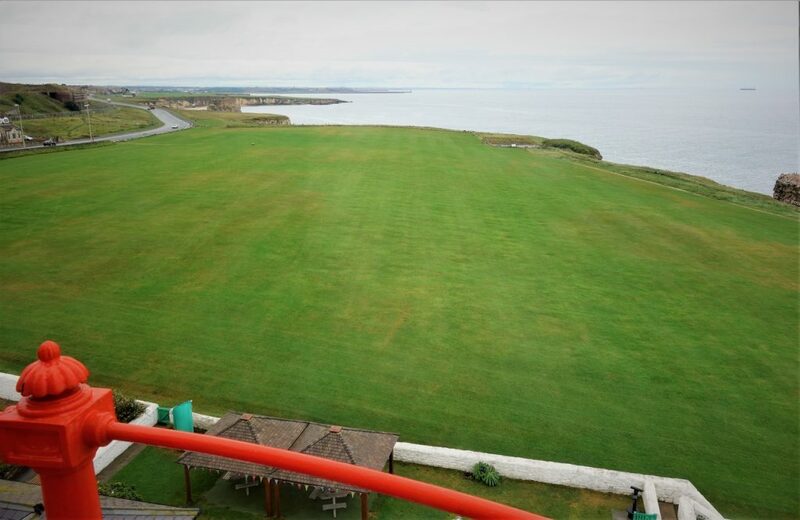 Despite the weather we had great views from the top of the lighthouse back towards Marsden Bay & South Shields. 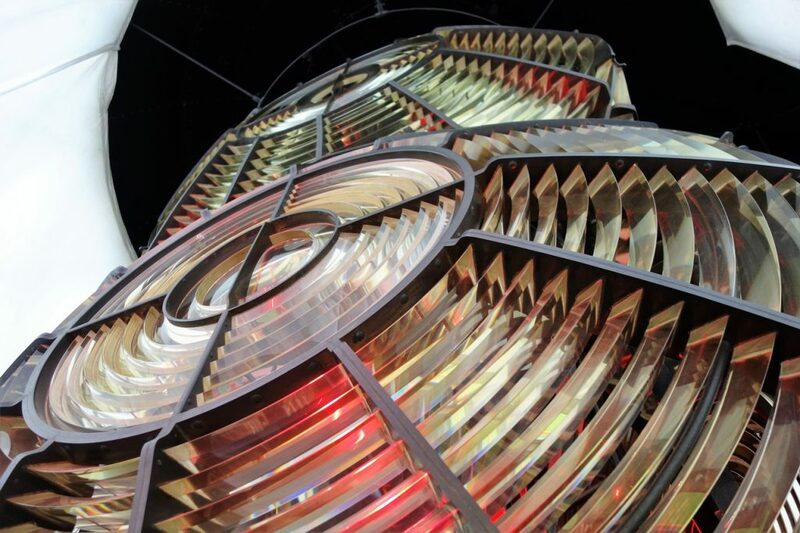 The helpful National Trust guide explained about the lighthouse and lens to us, and gave it a little spin. 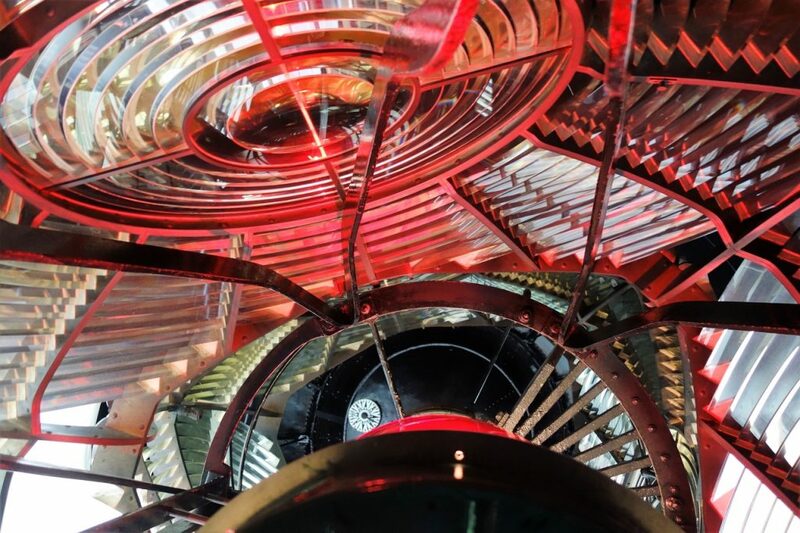 Inside the lens, a very weird feeling as it spun around. 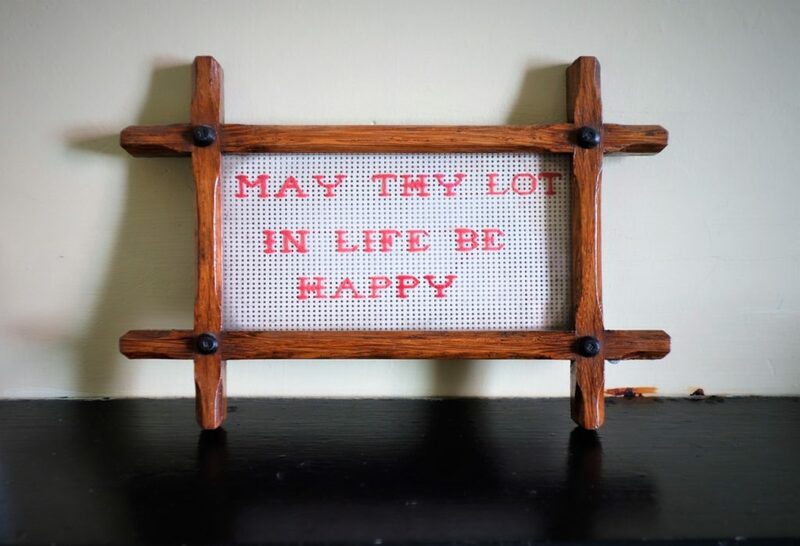 Totally agree with this message on the lighthouse keeper’s mantle piece. 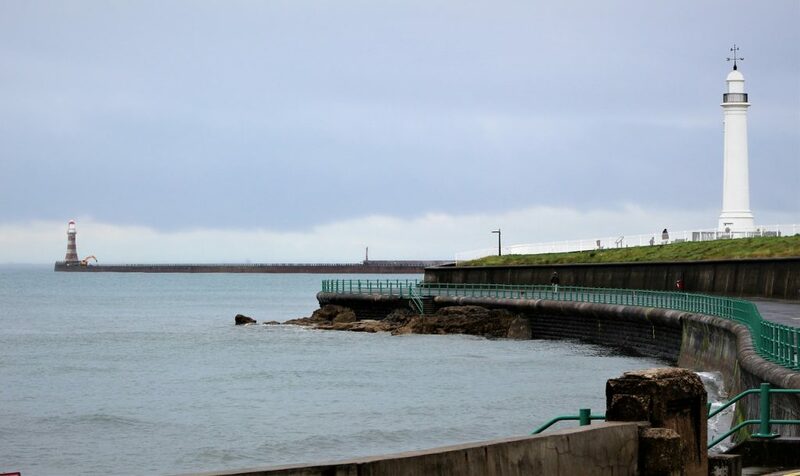 More lighthouses at Seaburn, Roker Lighthouse on the left and The White Lighthouse on the right. 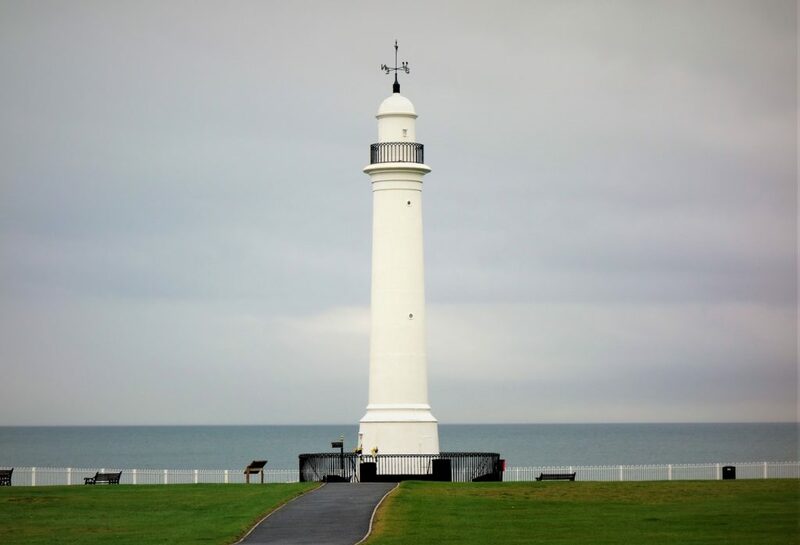 The White Lighthouse at Roker beach looking very smart with its large weather vain on top. 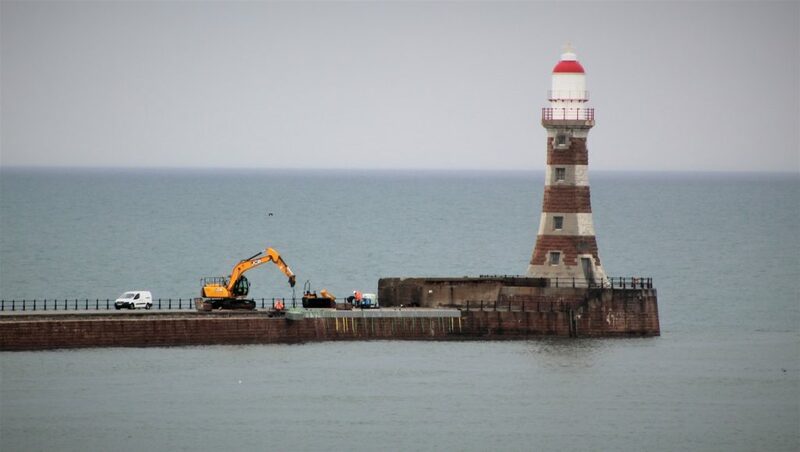 A bit of a renovation going on at Roker Lighthouse at the end of Roker Pier. 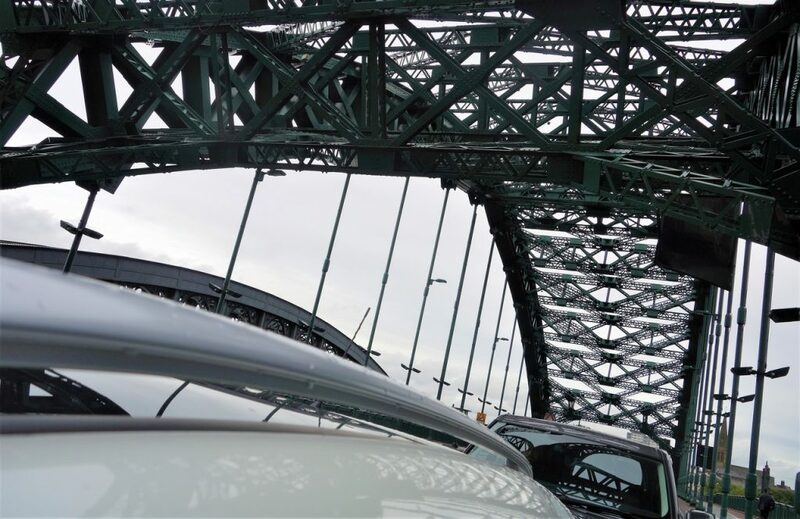 Trying to get a photo crossing the Wearmouth Bridge at Sunderland. 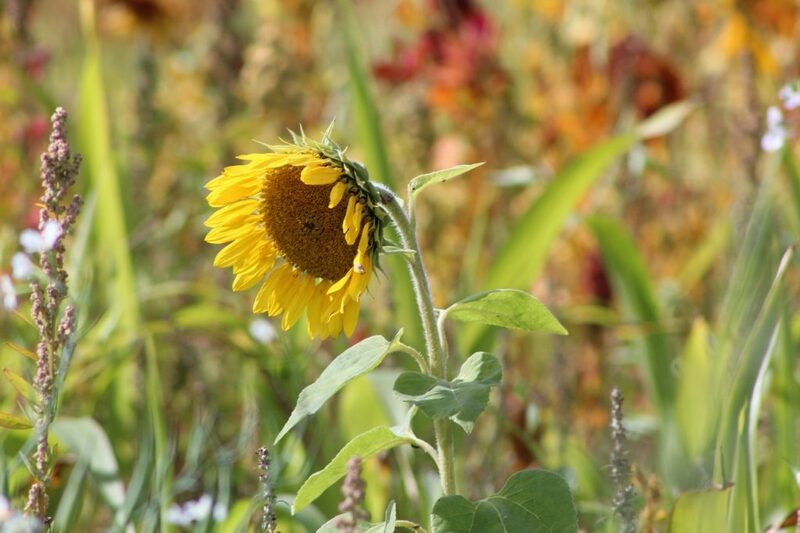 Wow, the sun is finally peeping through the clouds today. 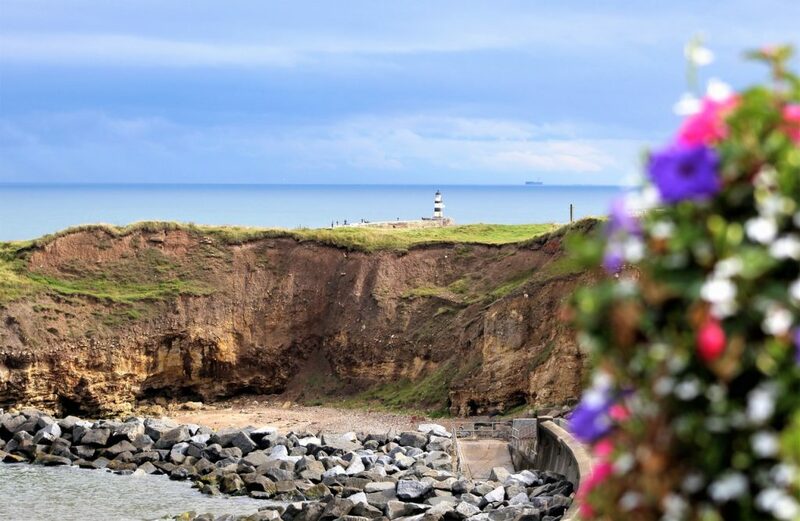 Seaham Beach and Seaham Lighthouse at the end of the north breakwater. 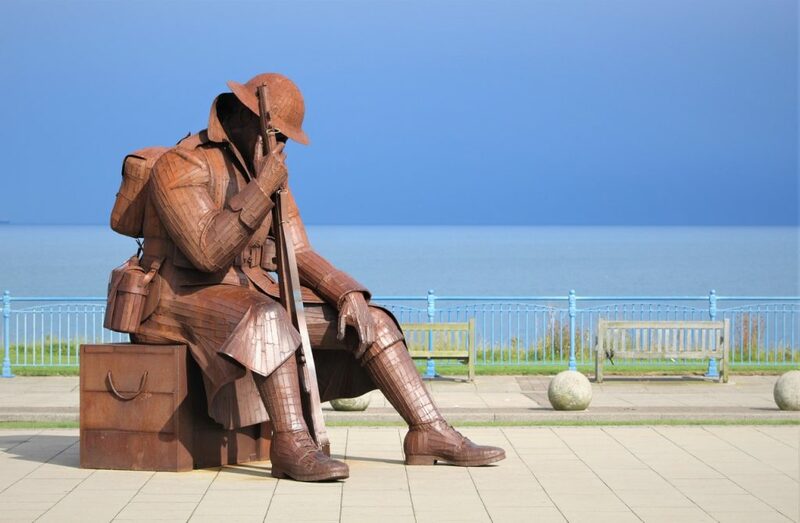 The rusty steel Tommy sculpture on the Terrace Green at Seaham. The World War One Soldier was pretty huge at almost three meters tall. 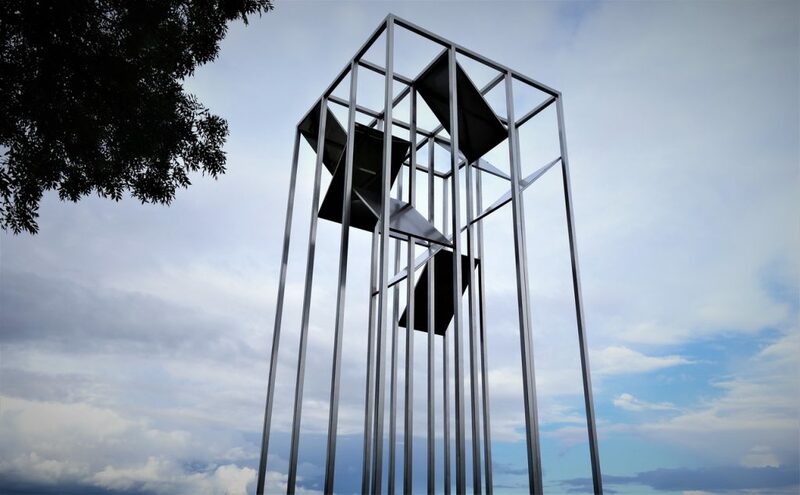 Officially named Eleven ‘O’ One, after the minute of armistice peace at 11am on the 11th November 1918. 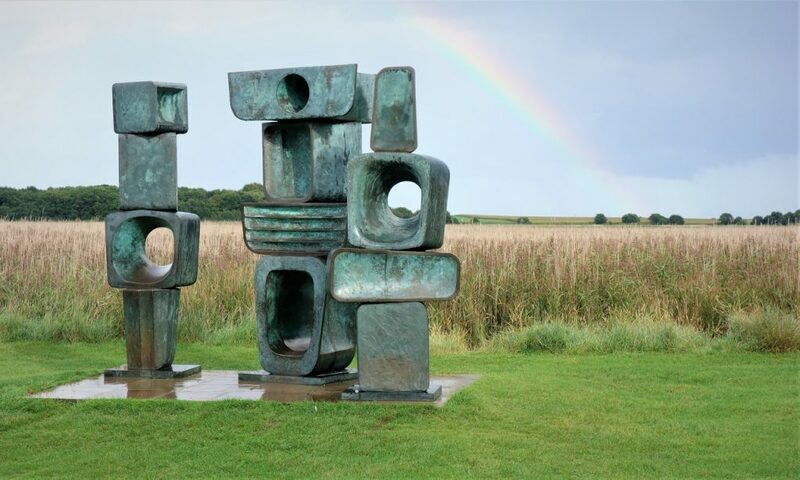 And more rusty sculptures at Nose’s Point along the National Trust Durham Coast. 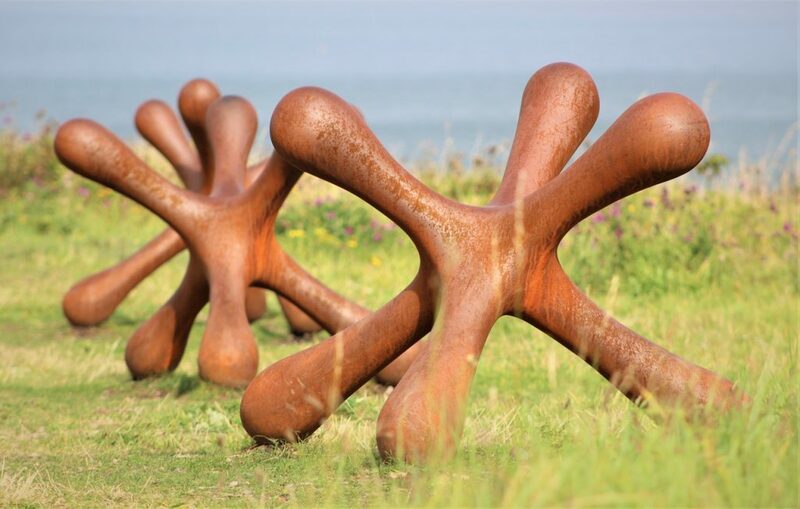 ‘Ps in a Pod’ in cast iron by Louise Plant, expressing human energy and movement. 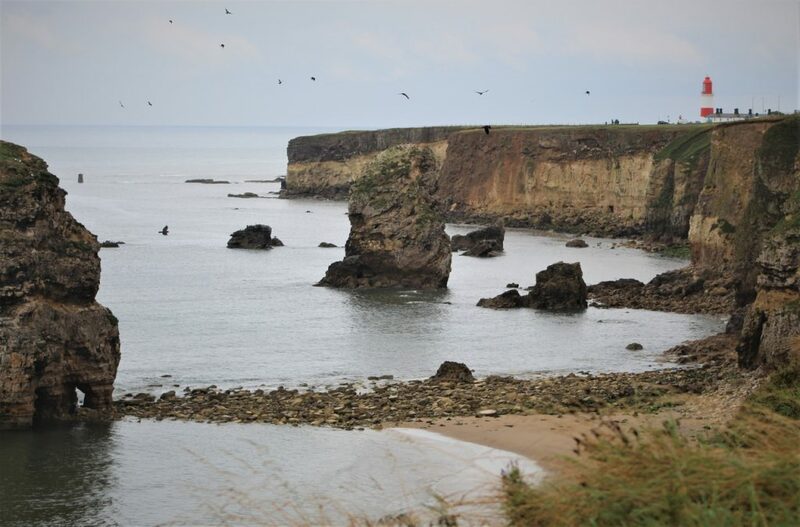 Despite a bit of dull road through the Blackhall area, we found these great views by making a short detour down to the coast at Blackhall Rocks. 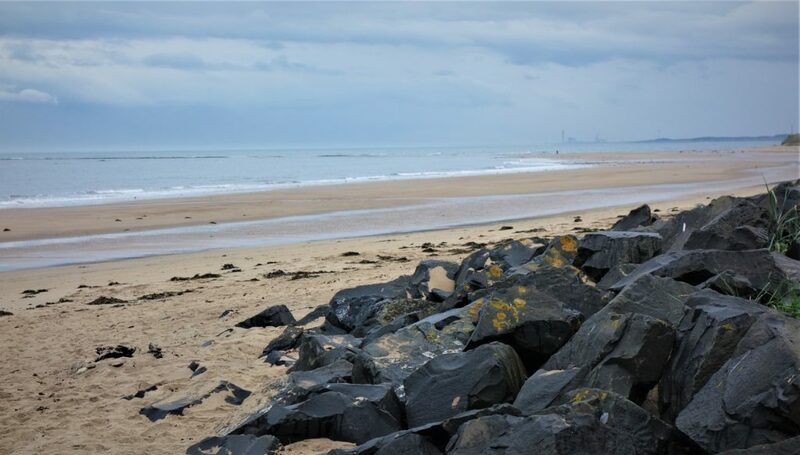 The view south east to Hartlepool. 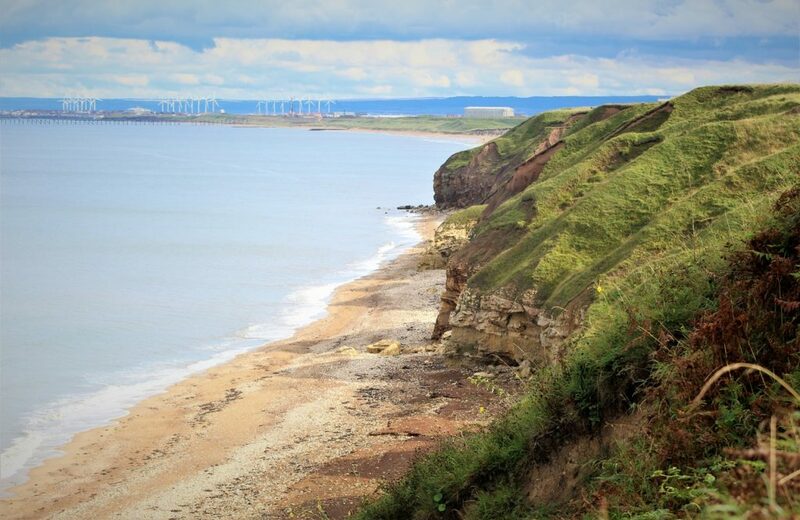 And the views back north along Durham Heritage Coast. 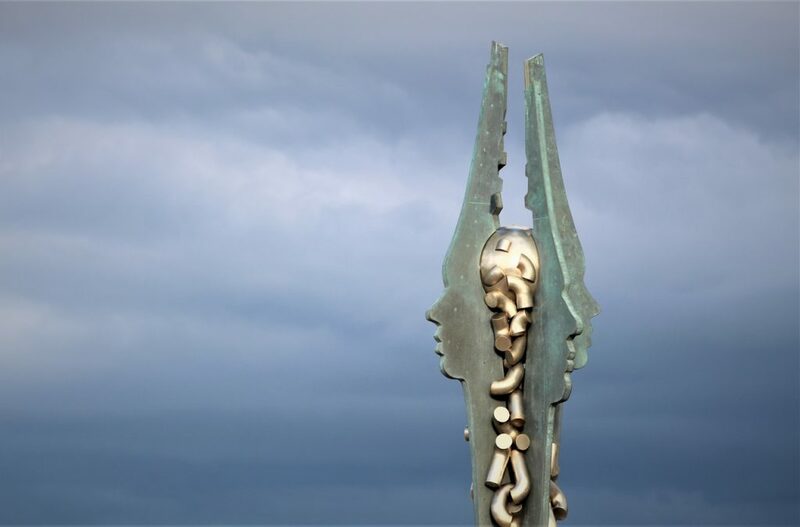 Lots of birds keeping their beady eyes on us at the Heugh Light at Hartlepool Headland. 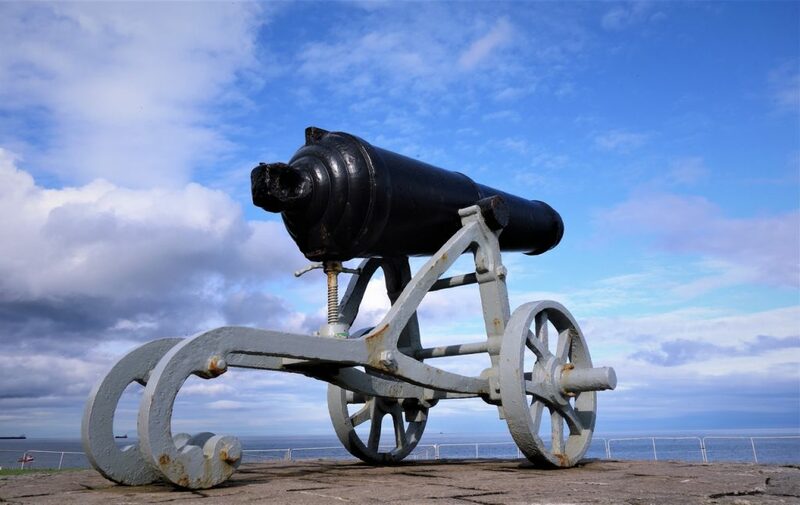 The Heugh Gun Battery, the only open air WWI museum in the UK. 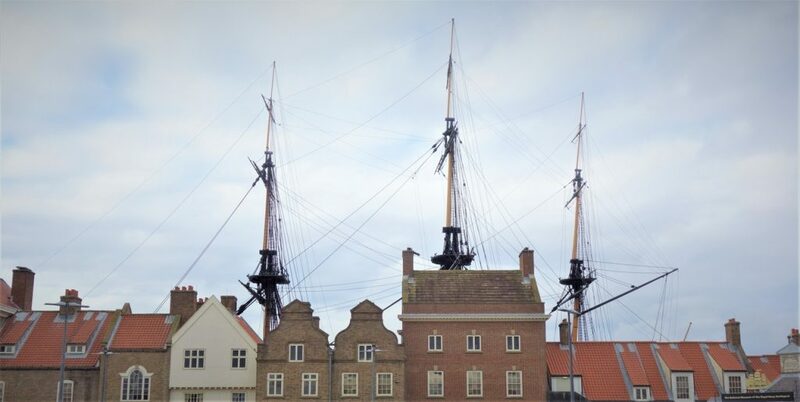 The masts of the H M S Trincomalee towering over some rather Dutch looking houses at the National Museum of the Royal Navy. 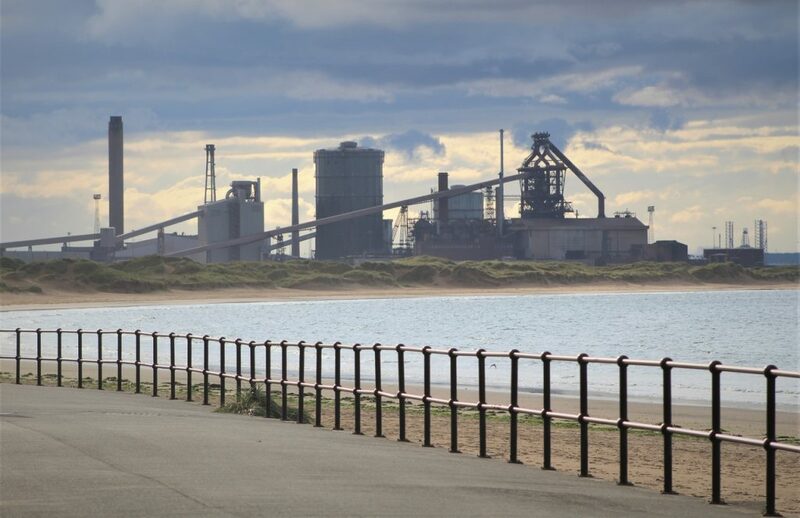 Driving over the River Tees at Middlesbrough we arrived at Redcar surrounded by steel plants and coke ovens (sadly now closed). 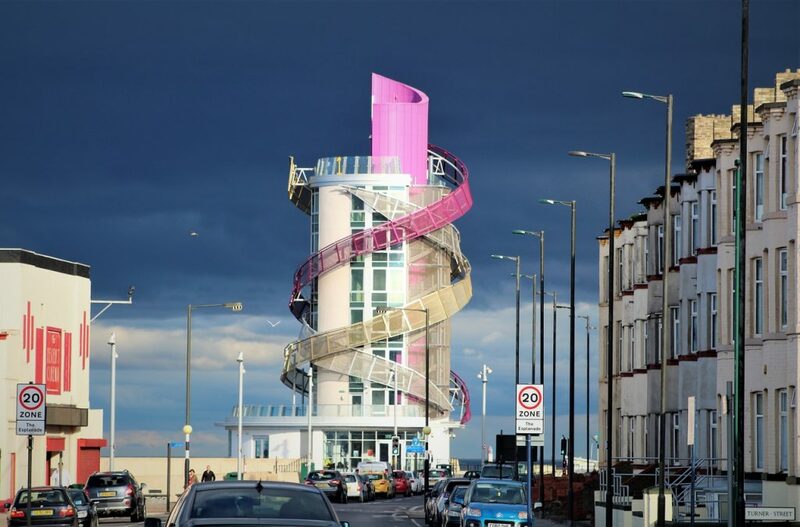 …and the pink Redcar Beacon, contrasting against the stormy sky. As the stormy clouds passed over Marske-by-the-Sea it created really dramatic lighting over the view to Saltburn and Hunt Cliff. 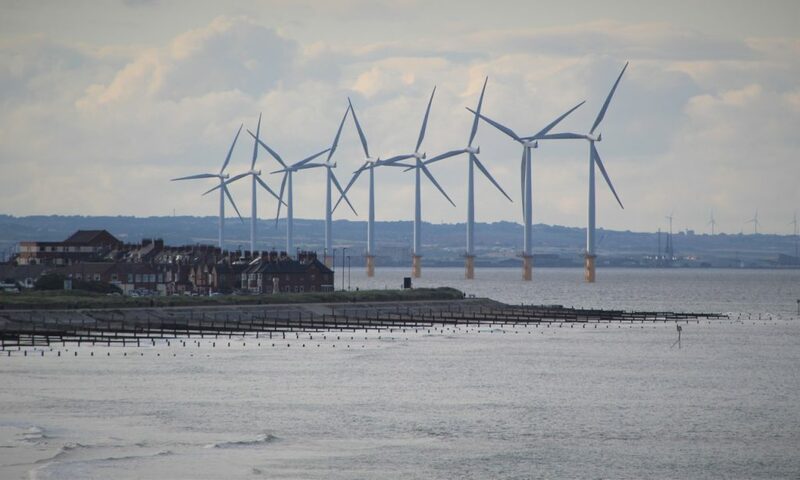 The view back to Redcar and the offshore wind turbines. 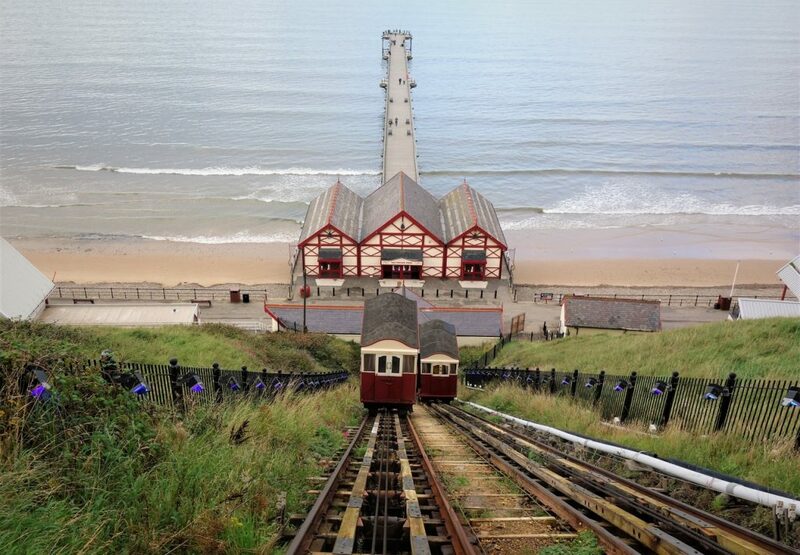 The old Cliff Tramway down to the pier at Saltburn-by-the-Sea. The oldest operating cliff funicular of its type in the world. 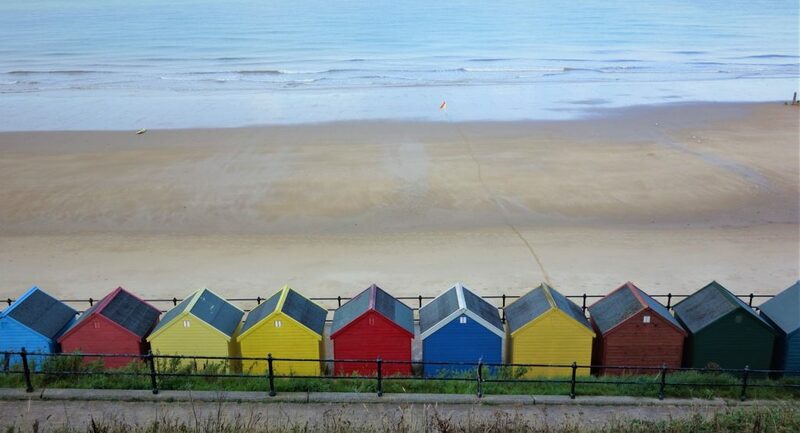 Brightly painted beach huts curving around the beach at Whitby, our first stop along the North Yorkshire Moors coast. 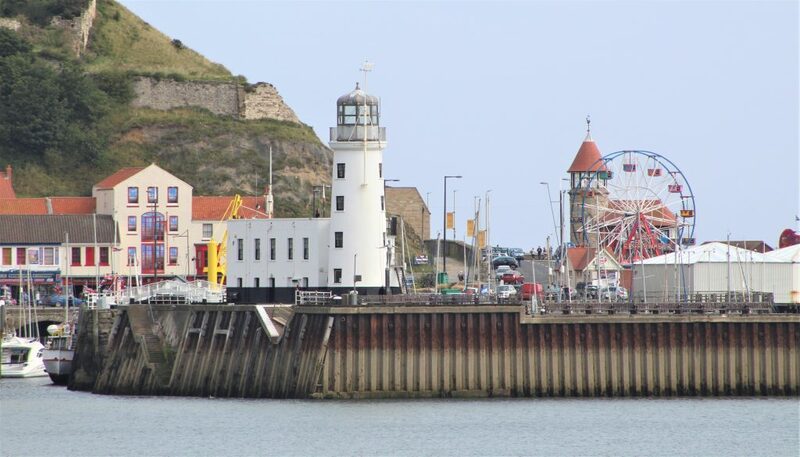 The East and West Harbour Lighthouses marking the entrance to Whitby. Whitby Abbey across the River Esk. 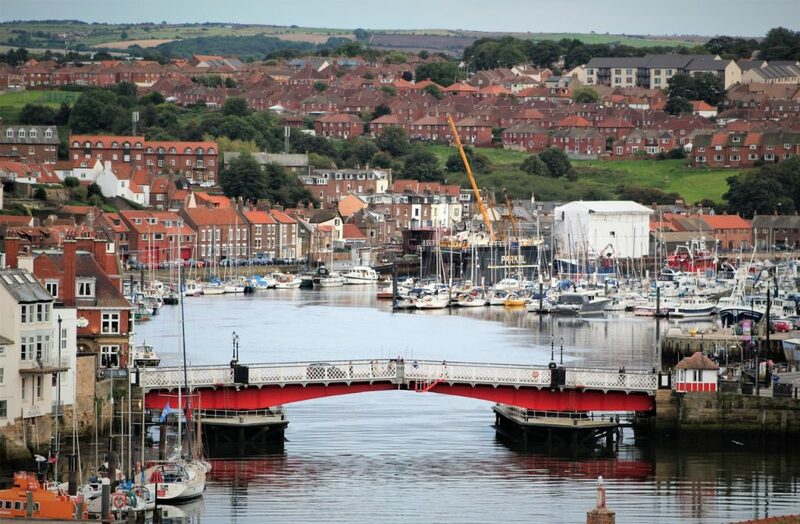 Whitby was larger than we had expected, but still kept a small town charm about it, with its quaint houses nestled around the harbour. 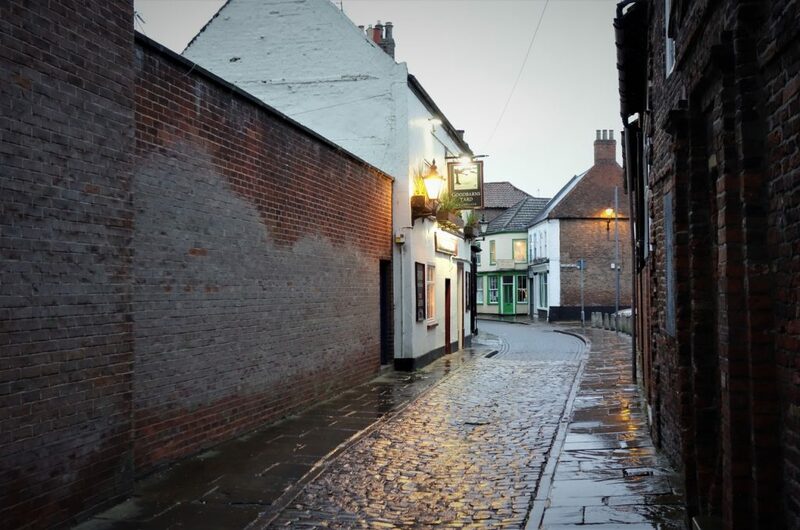 Interestingly Whitby inspired Bram Stoker when writing ‘Dracula’ after staying there in 1890… though we didn’t see any vampires on our visit. 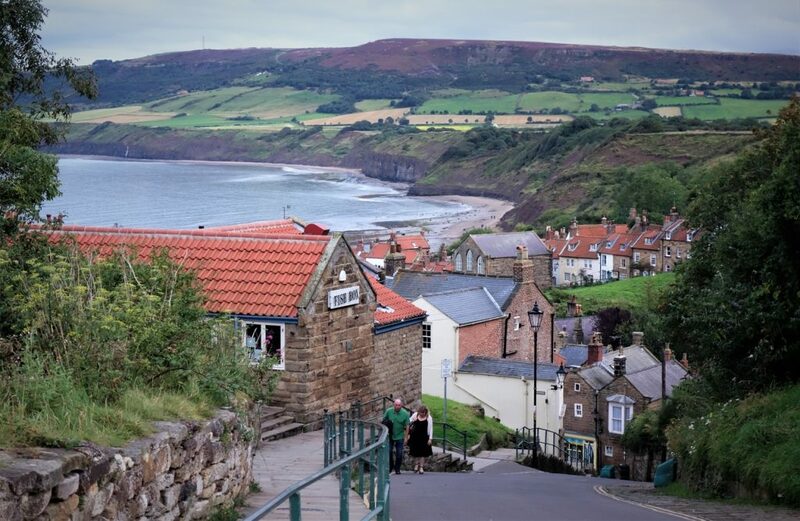 Before heading to Scarborough for the evening, we made a final stop of the day at the small fishing village of Robin Hood’s Bay, famous for smugglers! We are starting today by heading a few miles north back in to Scotland (they can’t keep us away). 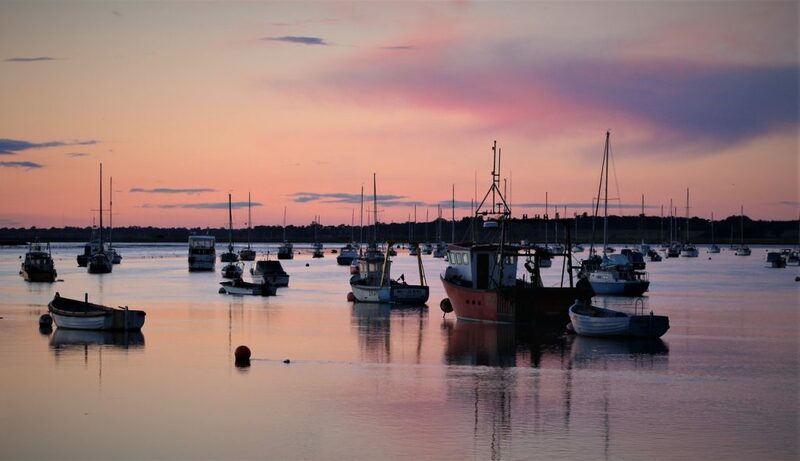 We will then spend most of the day continuing our drive back in England, along the Northumberland coast before ending the day in Newcastle. 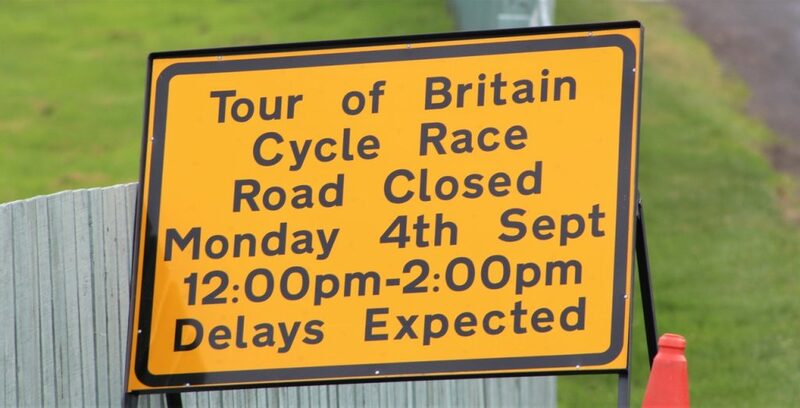 The Tour of Britain Cycle Race arriving in Bamburgh. 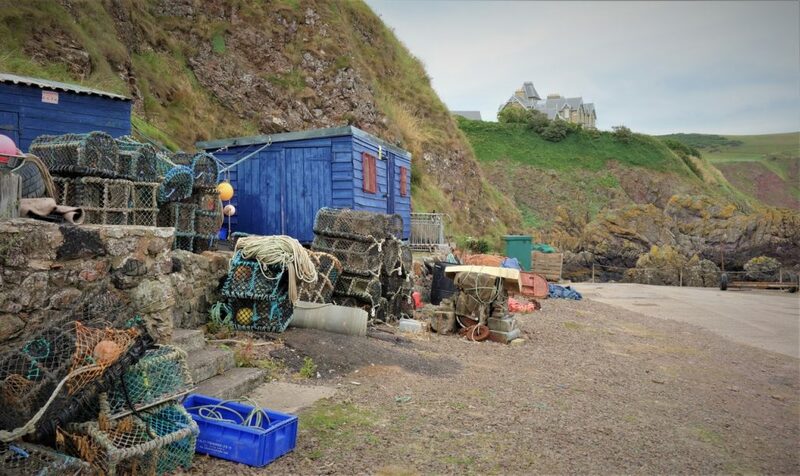 Starting our day just north of the Scottish border at the quiet fishing village of St Abbs. 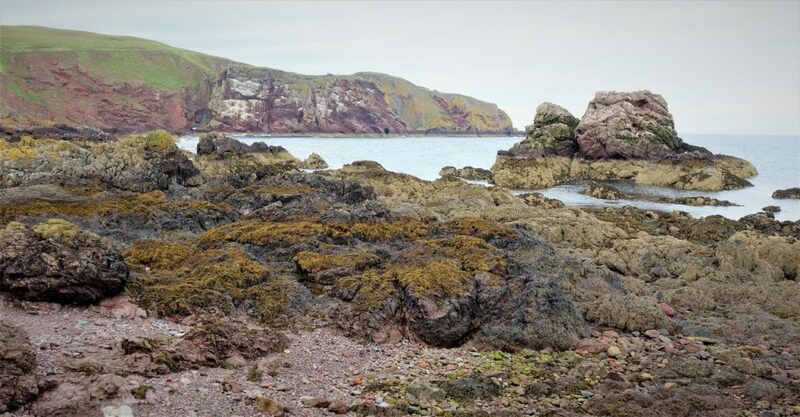 Rocky views past St Abbs Harbour. 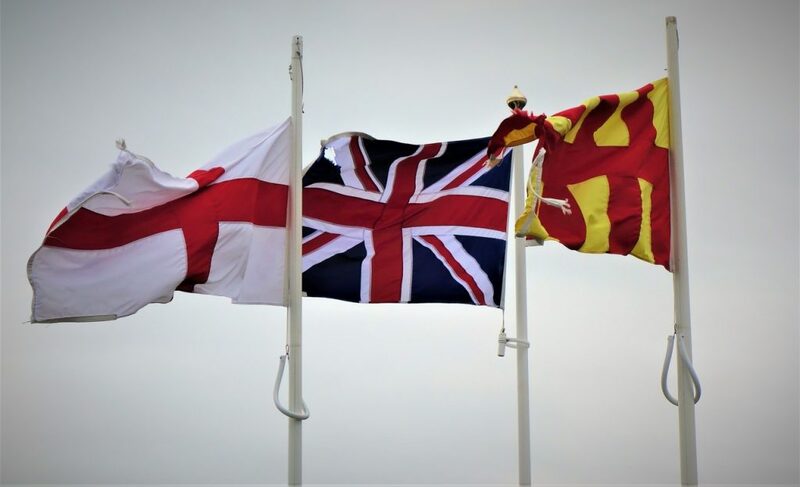 Crossing the border back into England. 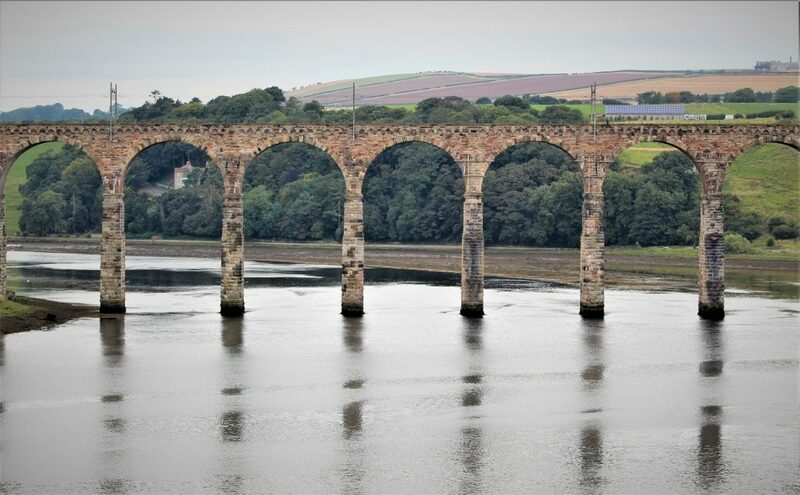 The Royal Border Bridge spanning the River Tweed. The railway viaduct was opened by Queen Victoria in 1850. 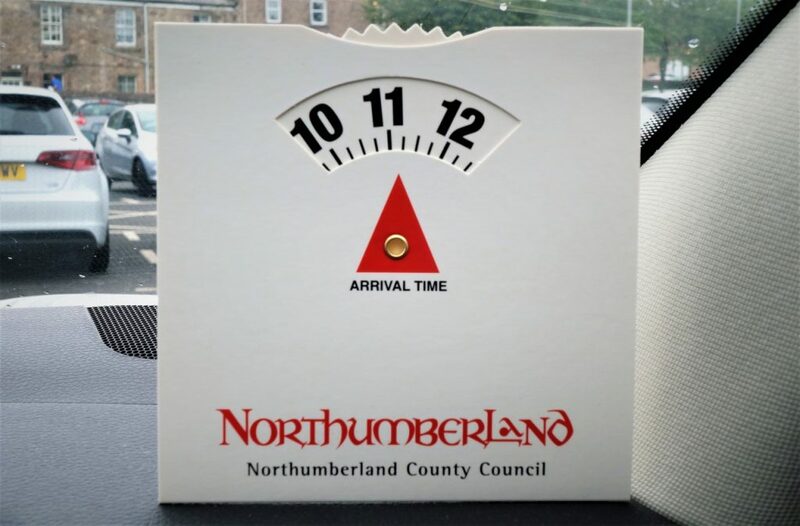 I remember these parking discs as a kid, and didn’t realise they were still in use. 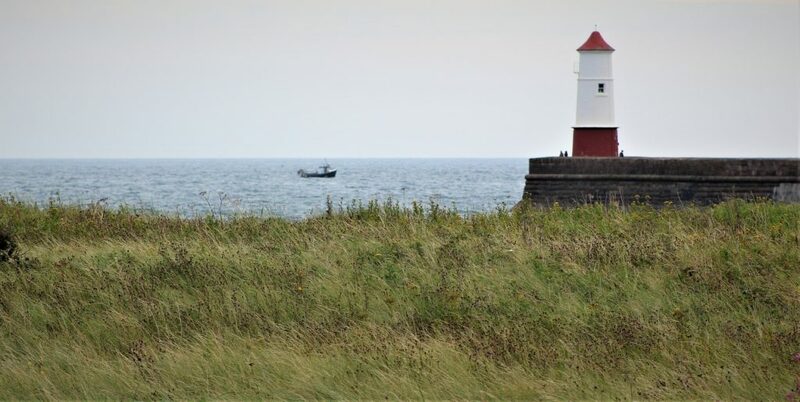 The simple but neat lighthouse at the end of the Berwick-upon-Tweed breakwater. 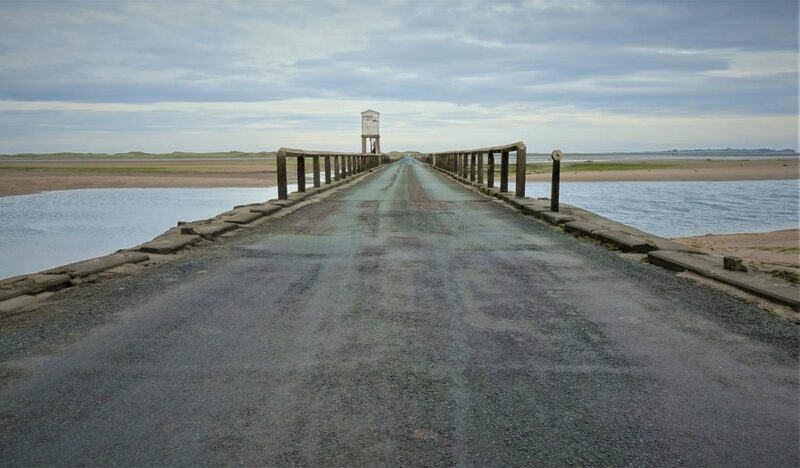 Crossing over the causeway to Lindisfarne (AKA The Holy Island). 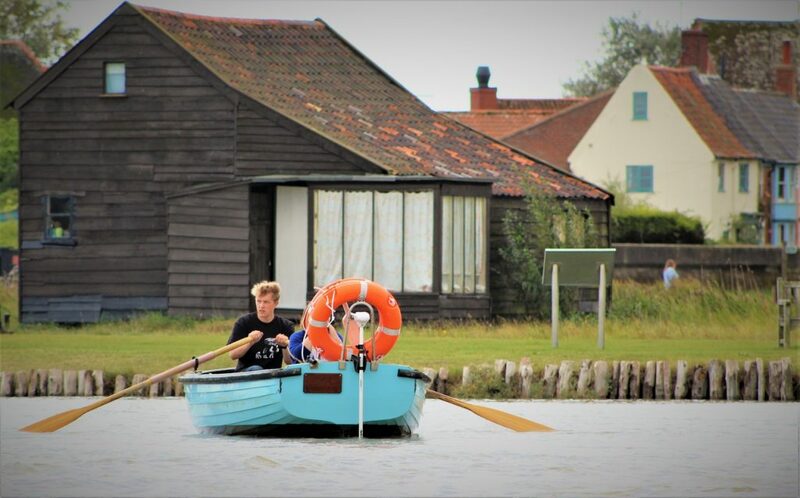 We better be quick, in fifteen minutes the tide is coming in, and we won’t be able to get back to the mainland until the evening. 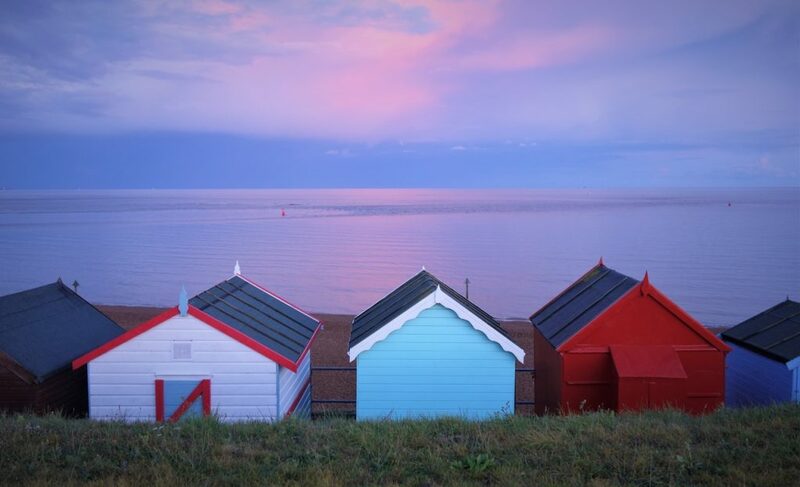 In case you get stranded as the tide returns, there’s a handy refuge hut to escape the rising tides. Your car might get a bit wet though. 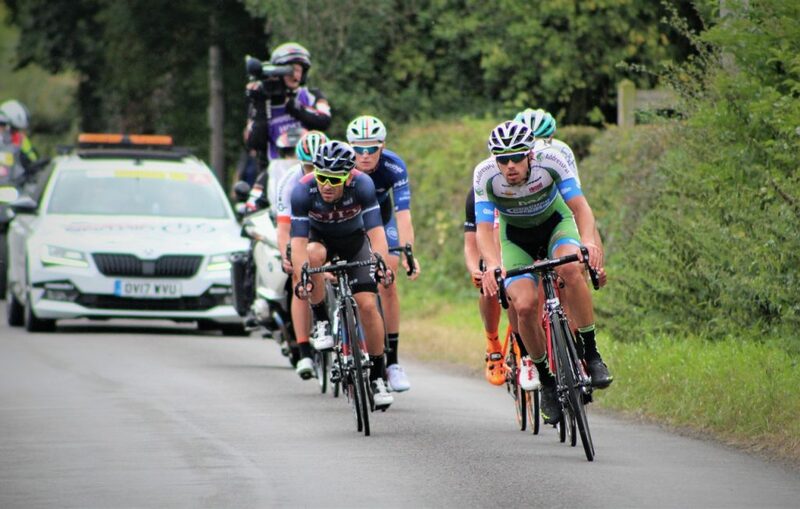 As we drove along the country lanes towards Bamburgh we suddenly found ourselves on the Tour of Britain Cyle Race route. A complete surprise. Perfect timing. 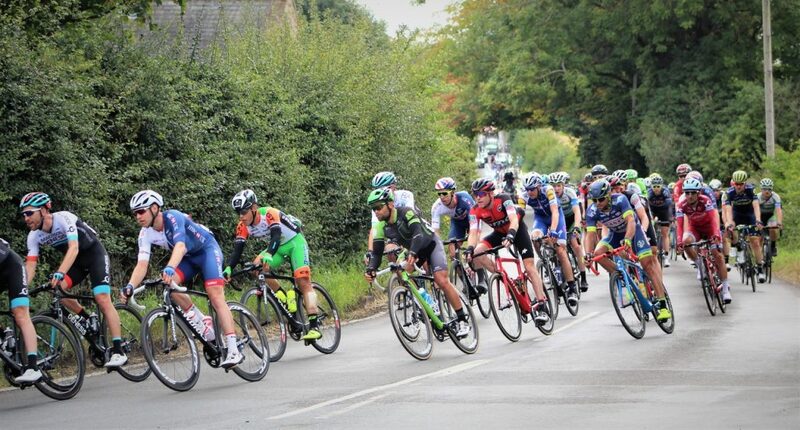 … then the race leaders came charging through…. 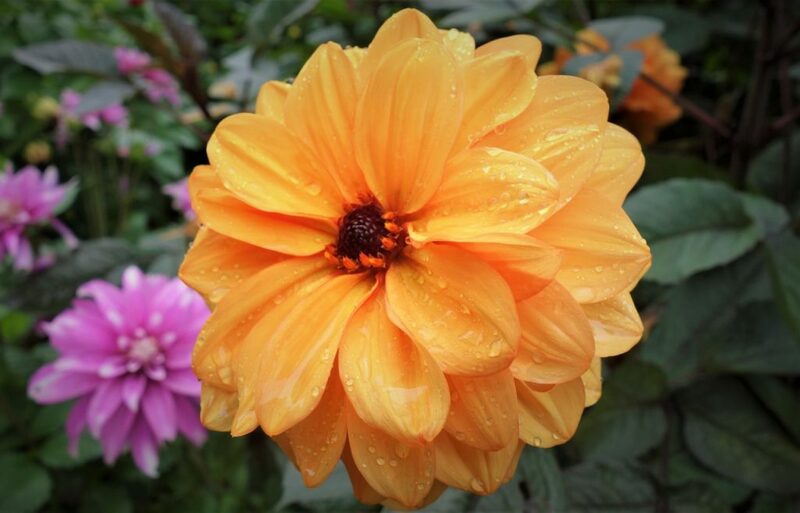 …followed by the main group. Ten minutes later we were back on the road again after this nice little interlude. 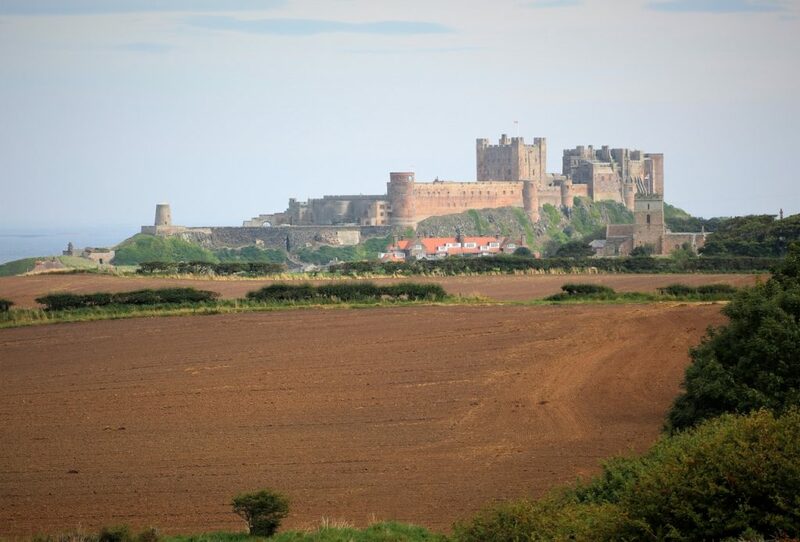 Stunning views over the freshly plowed fields to the huge Bamburgh Castle. 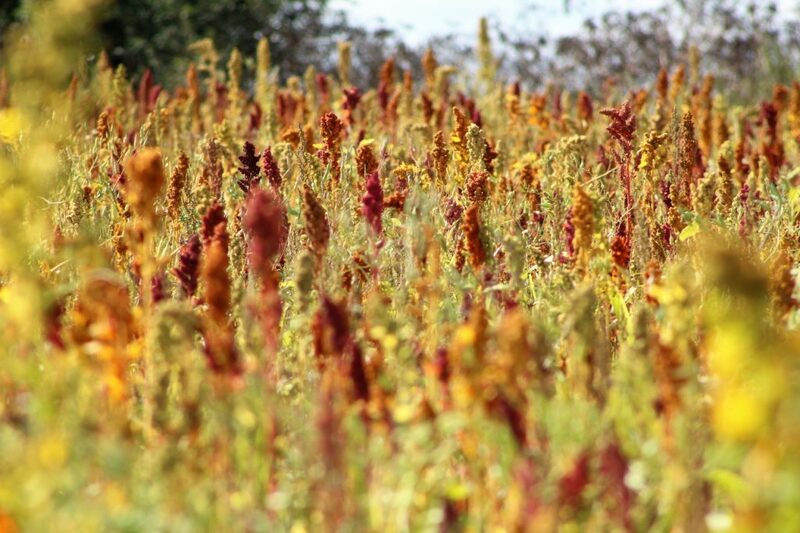 And even more impressive close up. Just passed Bamburgh Castle, the view over to The Farne Islands and Inner Farne Lighthouse. 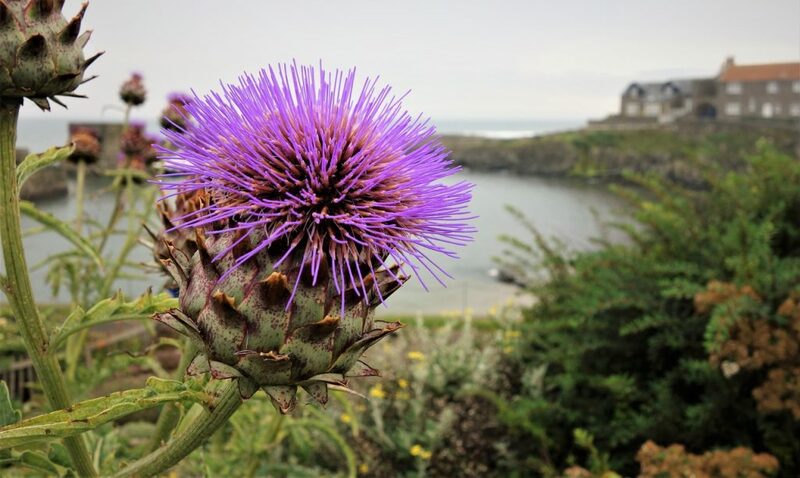 The islands are famous for their seals and wide variety of seabirds. 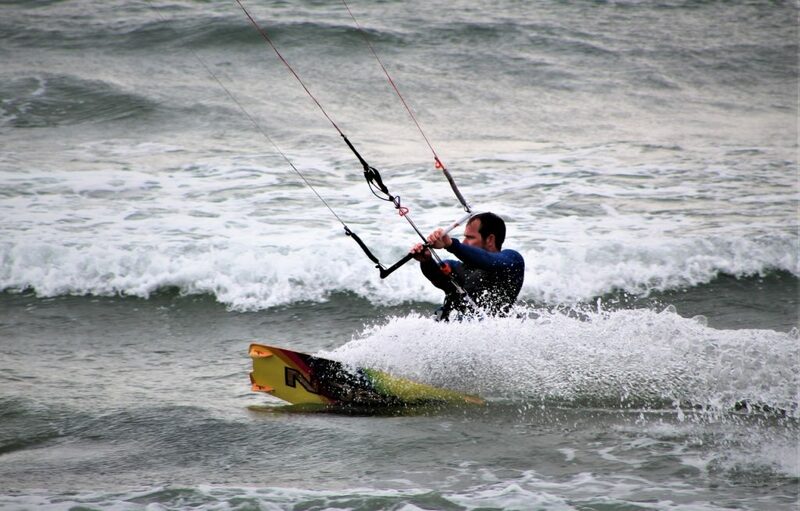 Kite Surfing on Beadnell Beach. 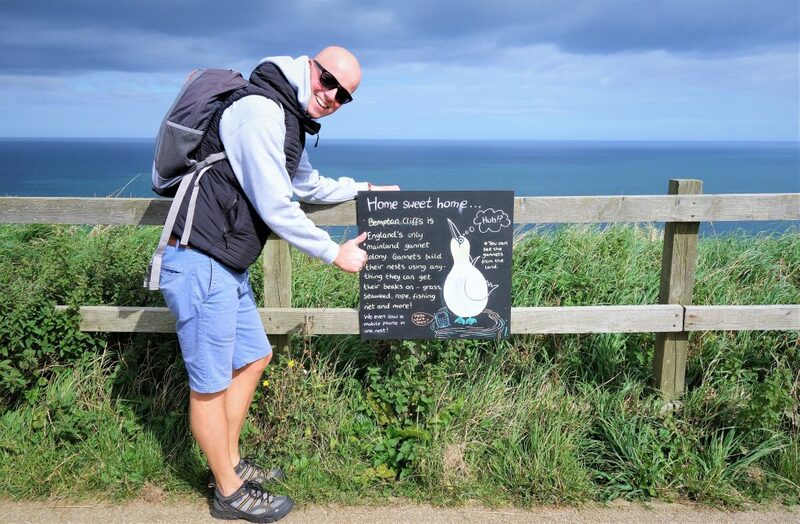 Jarno doing some more beach graffiti at the National Trust managed Embleton & Newton Links. 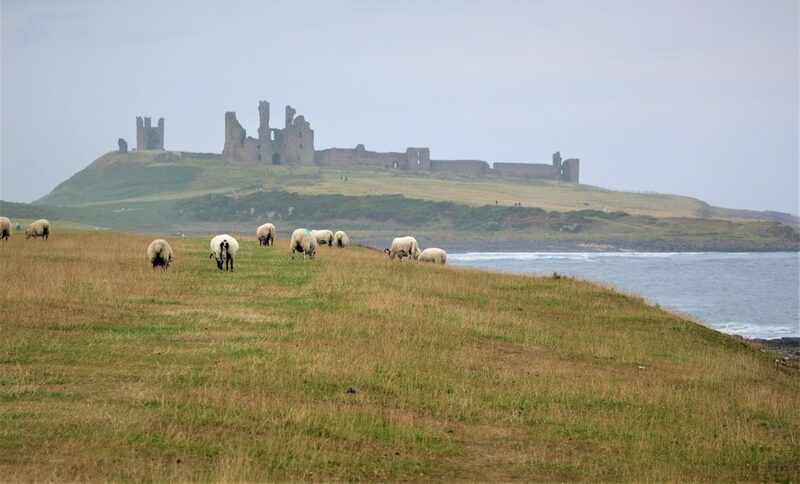 In the distance you can also spot Dunstanburgh Castle. 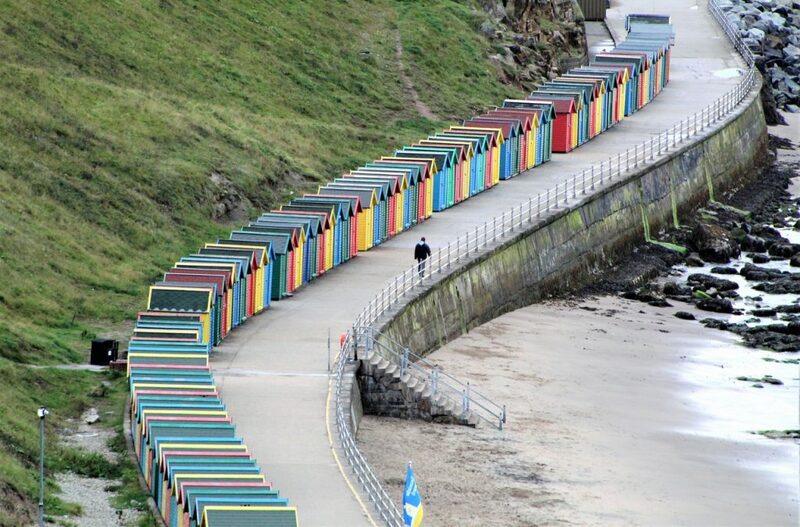 A little bit of colour as rain clouds rolled in over Craster Harbour. 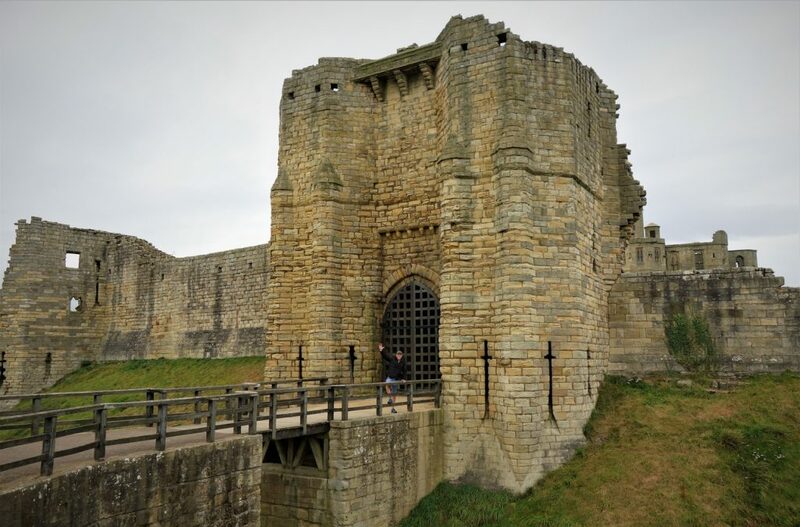 The seat of the Duke of Northumberland, at our final castle of the day, Alnwick Castle, just outside the picturesque market town of Alnwick. 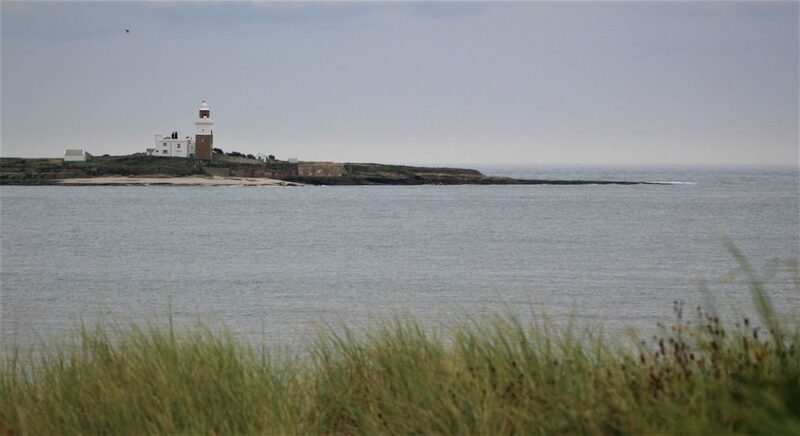 The tiny Coquet Island and its lighthouse viewed from Amble Beach. 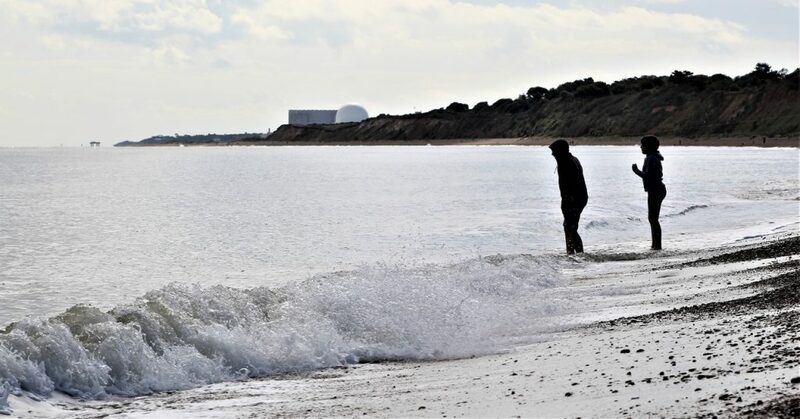 Low Hauxley Beach. Just a bit further along the beach a two-hundred meter long ancient forest has been uncovered by the sea cutting through the sand dunes. 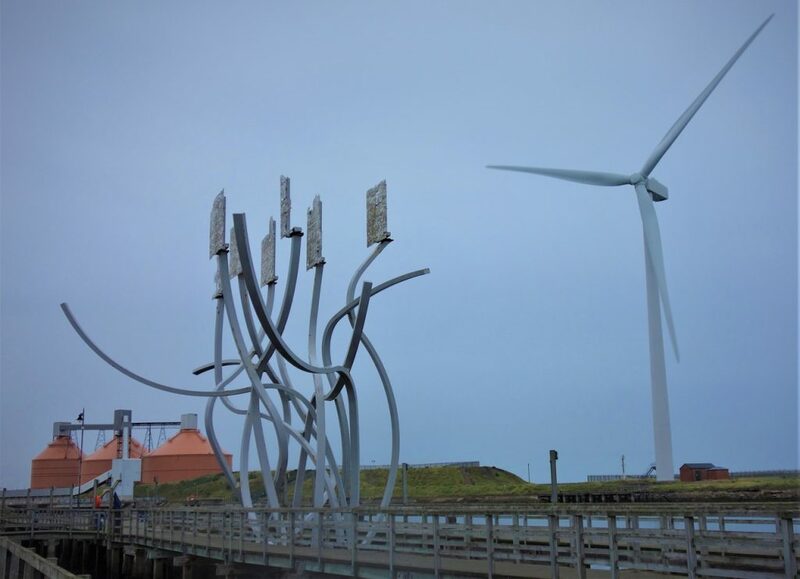 An interestingly arty and industrial coastline as the light faded passing through Blyth. 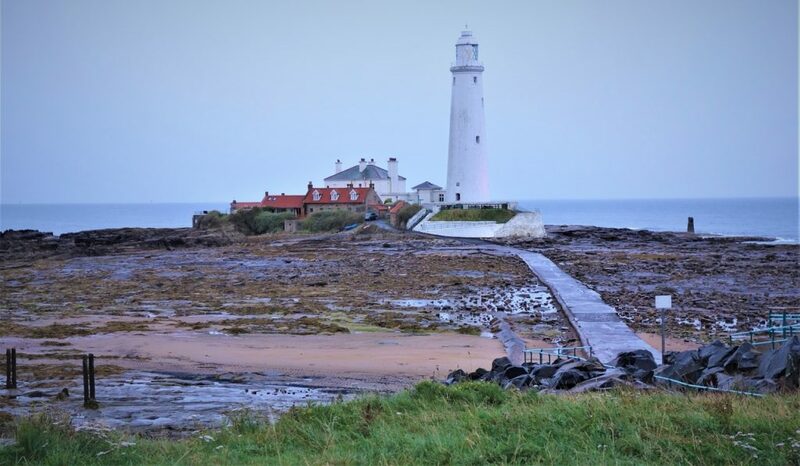 St Mary’s Lighthouse across another causeway, at Whitley Bay. 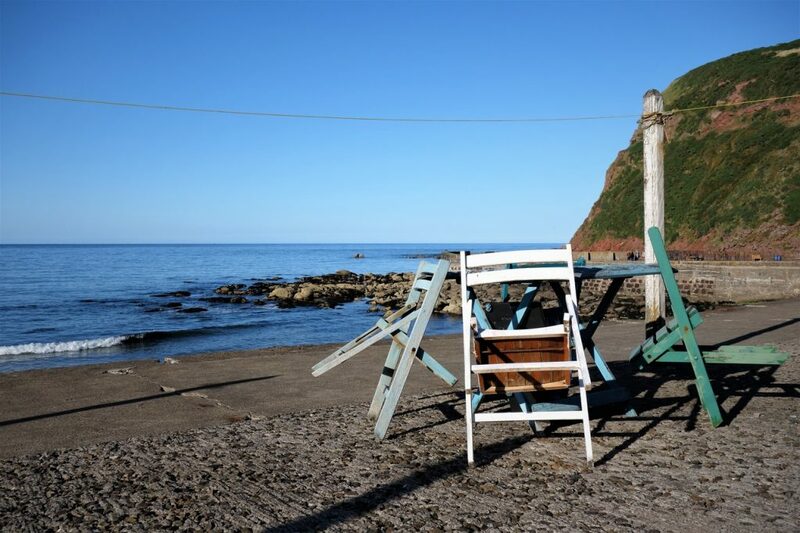 Ending the day with delicious fish tacos on the beach at Riley’s Fish Shack. 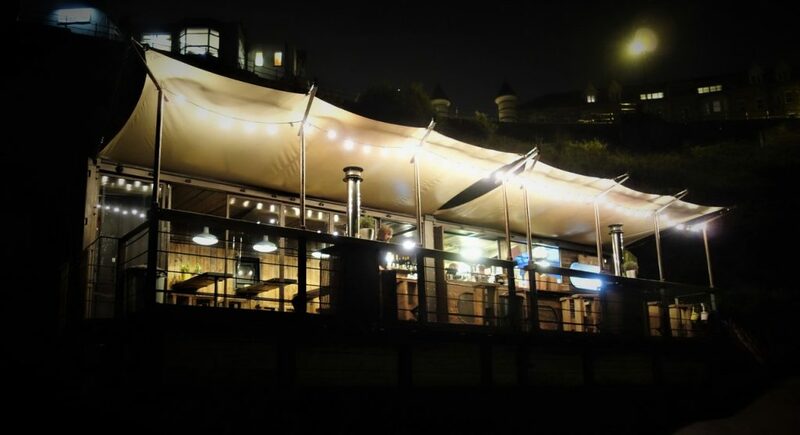 We then headed inland to Newcastle for the night. We started today by heading back east to the coast at Crail, as we’d run out of sunlight yesterday evening after leaving St Andrews. 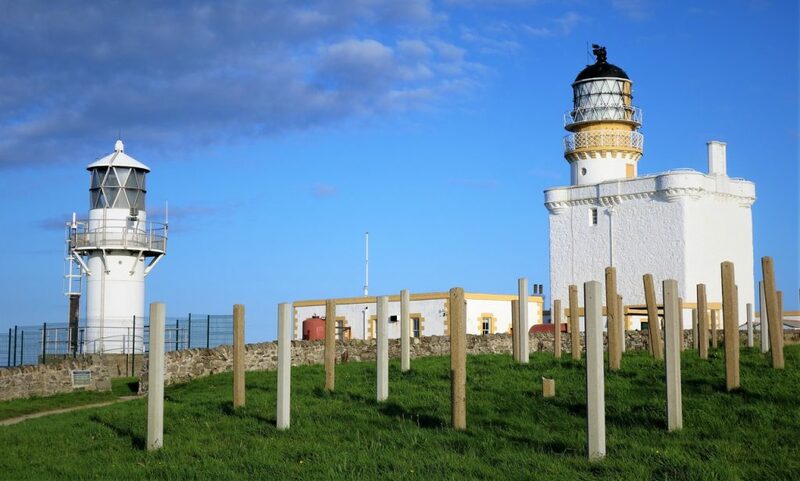 From Crail we then looped back west along the coast, crossing the Firth of Forth before continuing along the coastline to Berwick upon Tweed. A telescope at North Berwick. 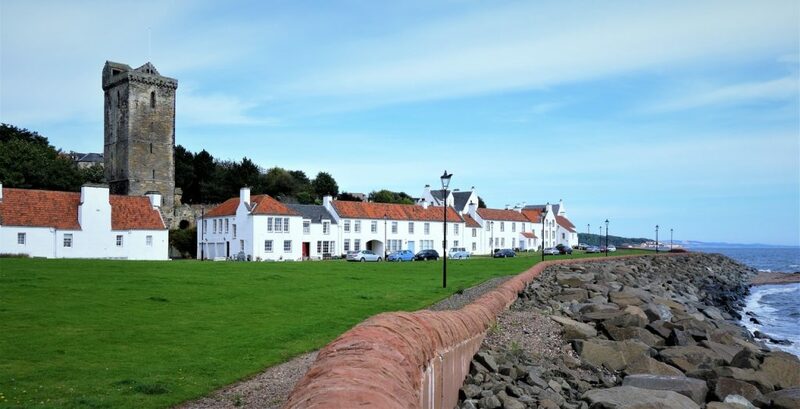 A quiet Sunday morning on Crail seafront. 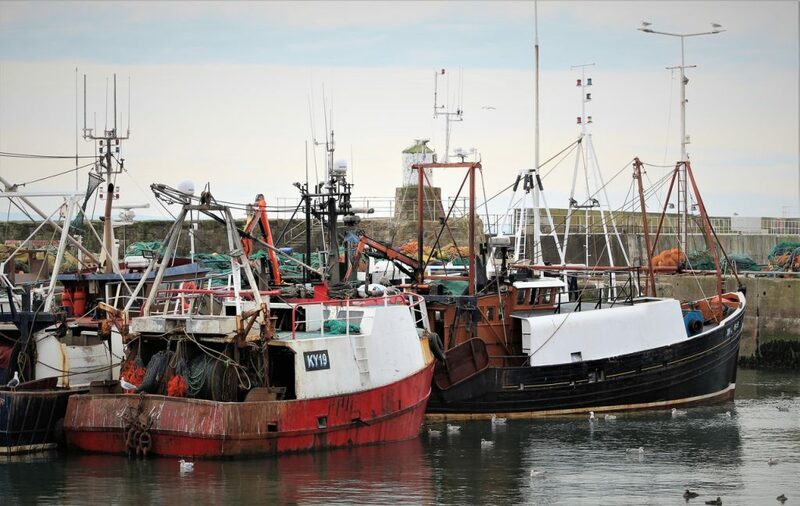 Fishing boats gathered in Pittenweem Harbour. 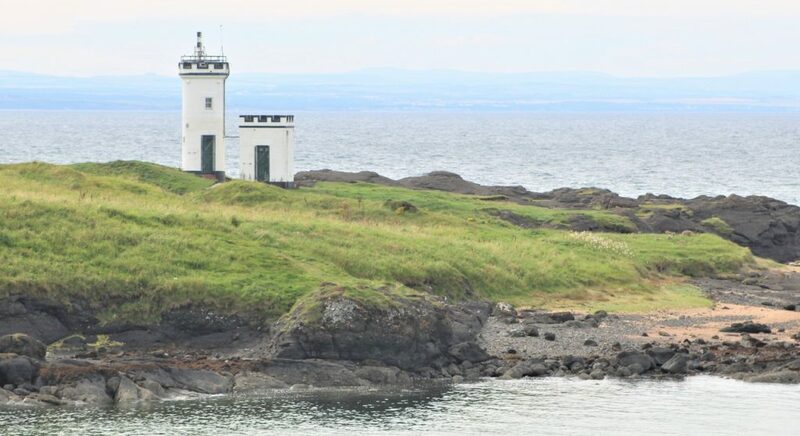 A modern lighthouse on the headland at Elie Ness. 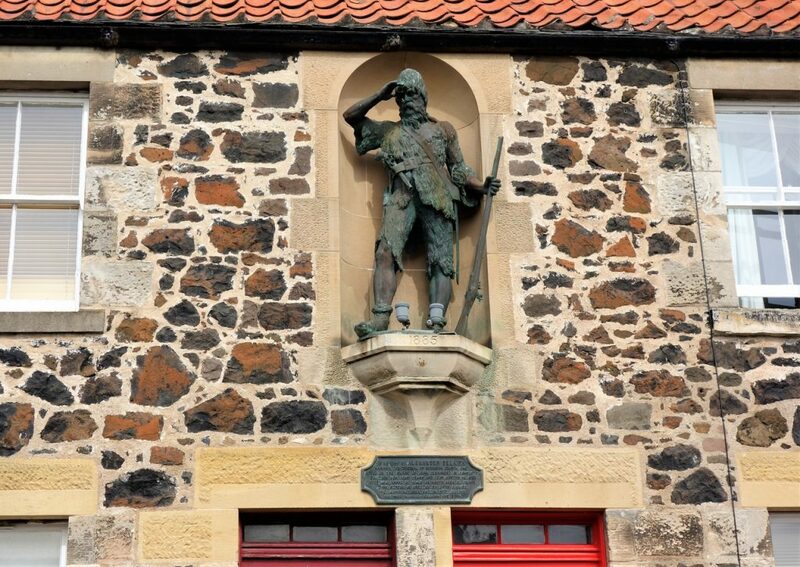 A statue of Alexander Selkirk mounted on a house in Lower Largo, the inspiration behind Robinson Crusoe. 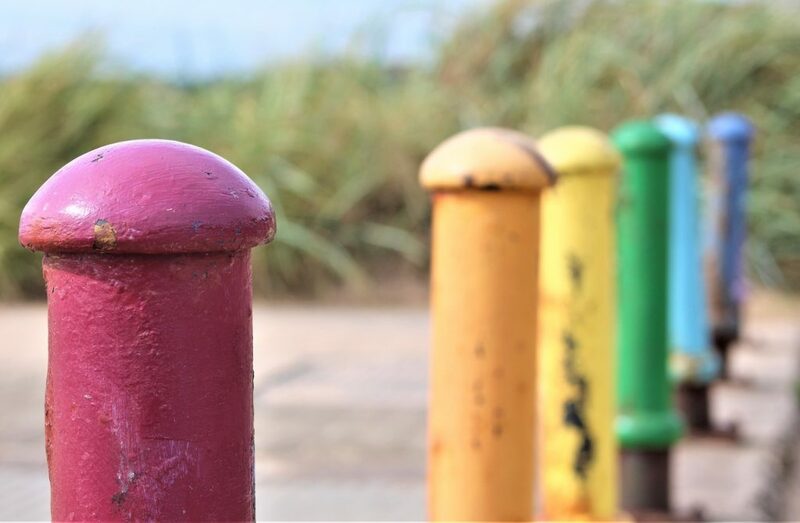 Colourful bollards on the Lower Largo seafront. 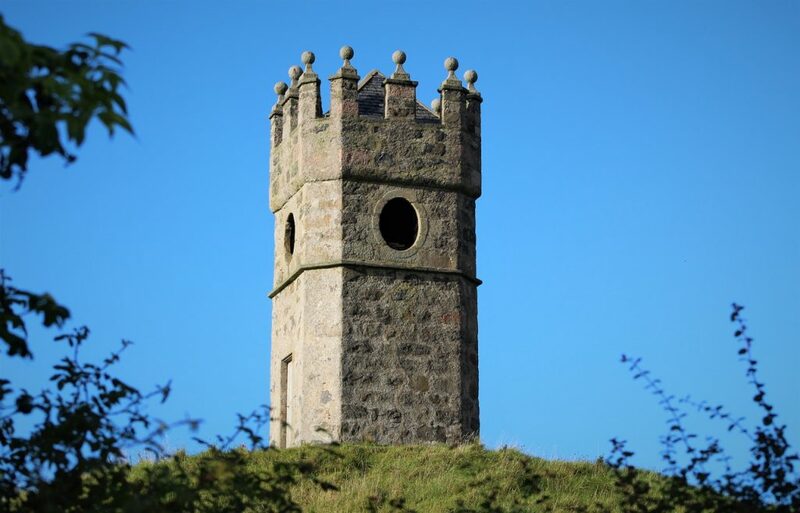 Just outside Kirkcaldy, the quaint Dysart. 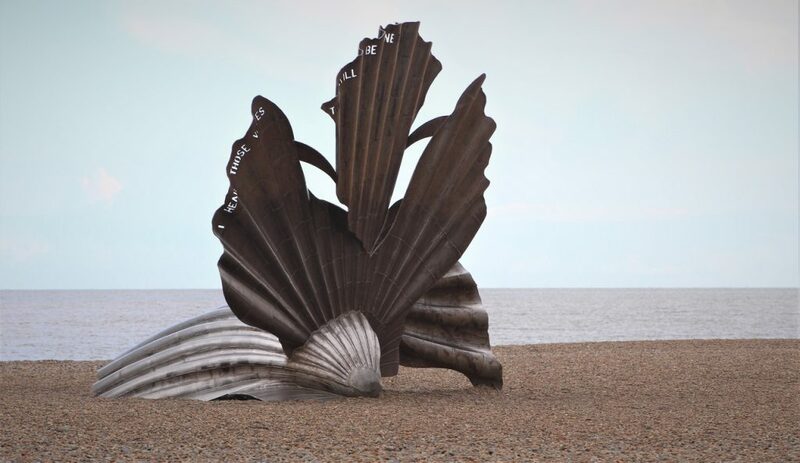 And an interesting coastal art installation by Donald Urquart just by the harbour. 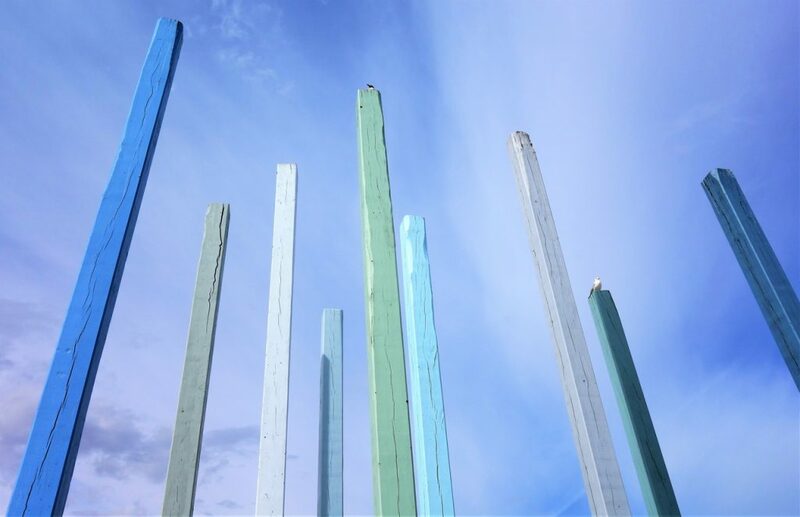 The 9 huge vertical beams painted to represent the colour of the sea under different light. 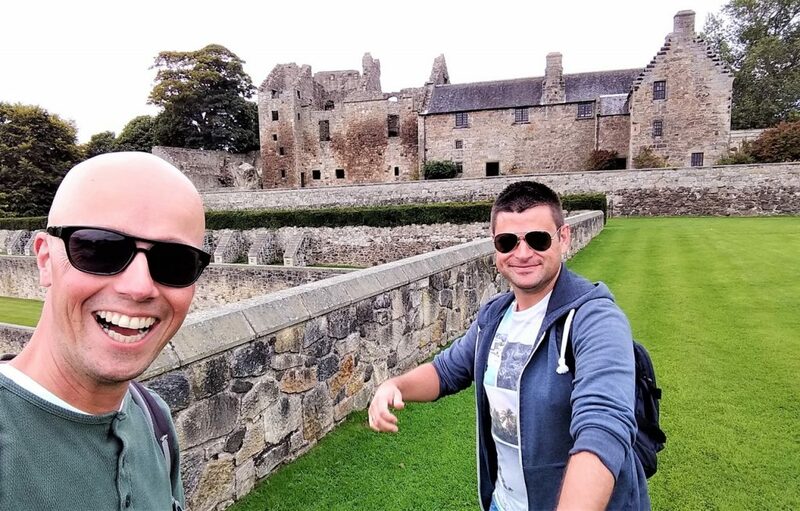 Yep, no idea either, but we seemed to be enjoying ourselves at Historic Scotland’s Aberdour Castle. 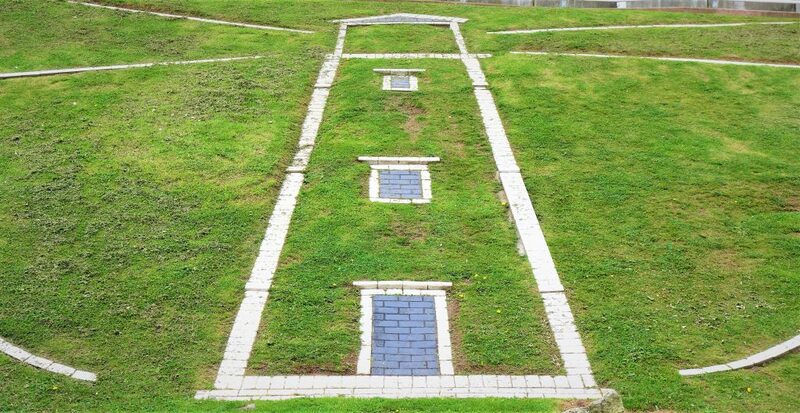 We weren’t sure what this building was on the terraced gardens that lead down to the castle orchard. 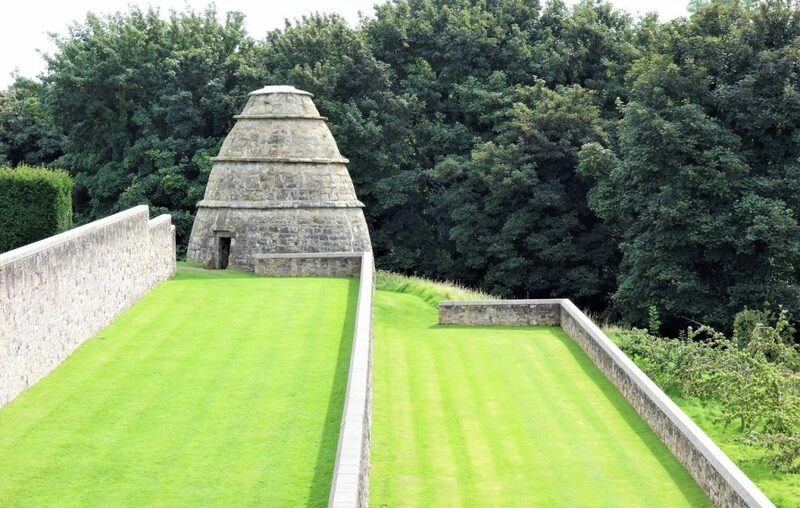 Anyway, it turned out to be an unusual beehive shaped doocot. 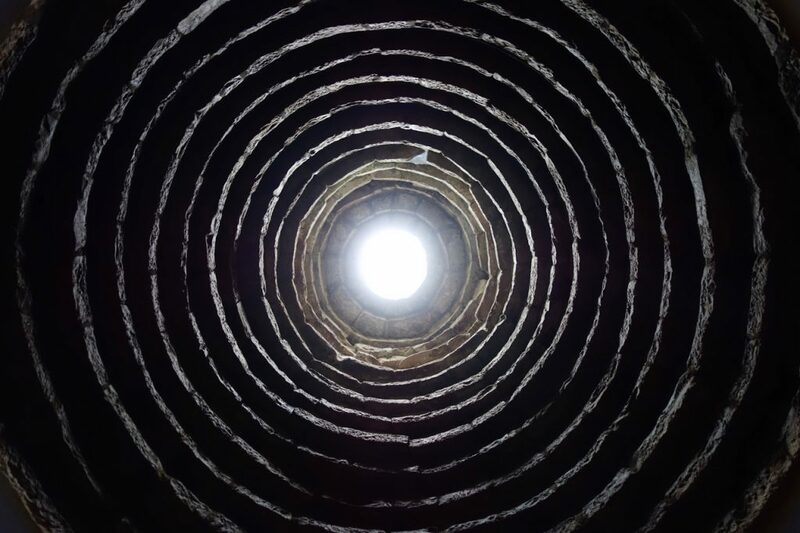 And inside the doocot, looking to the sky. 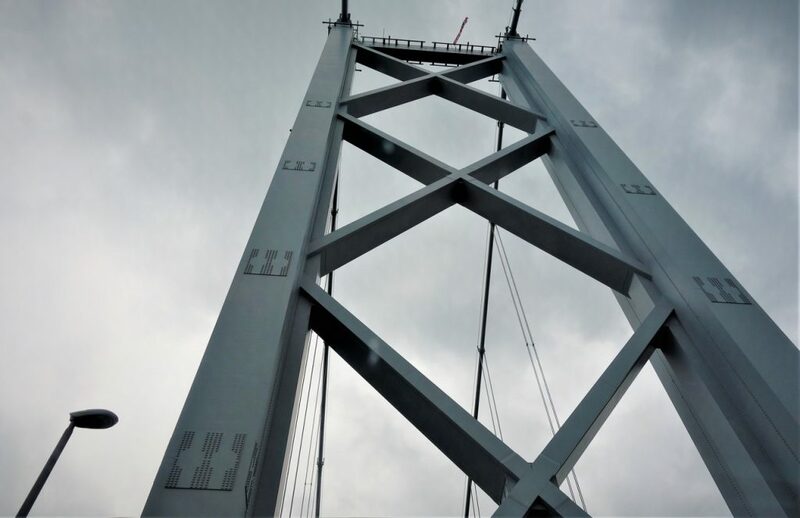 Crossing over the Forth Road Bridge. 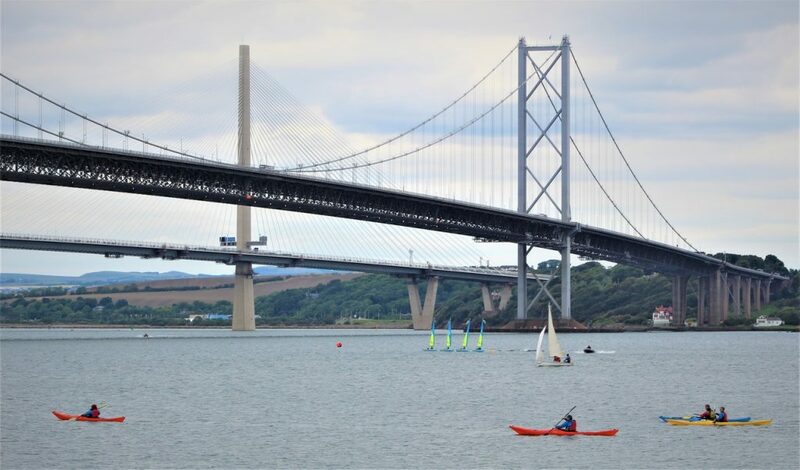 It was really busy, with lots of police and tourists around, then we realised it was the opening week of the new Queensferry Crossing bridge. 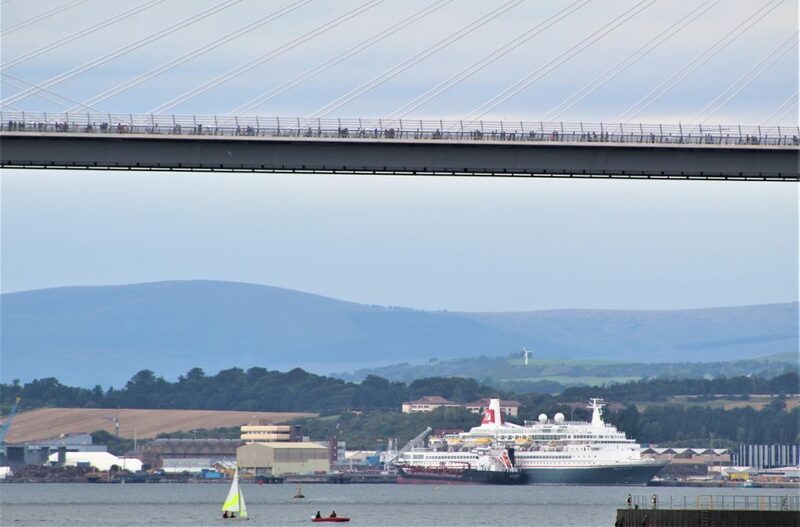 From South Queensferry, looking back to the Forth Road Bridge, and the new Queensferry Crossing behind. 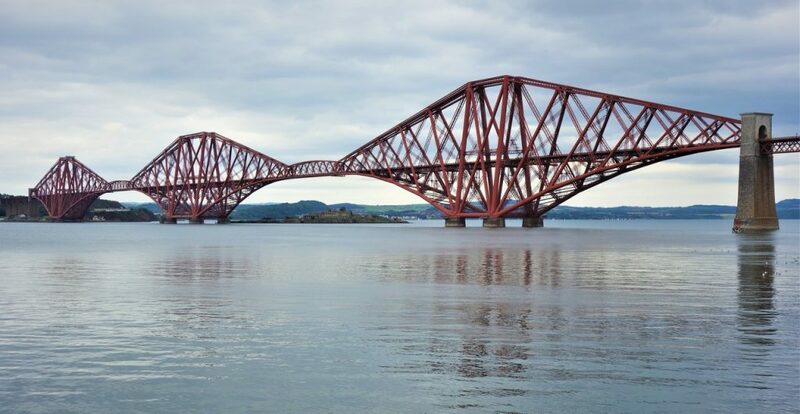 The Queen would be visiting to officially open the new bridge tomorrow. In the meantime the bridge was open for pedestrians to cross. 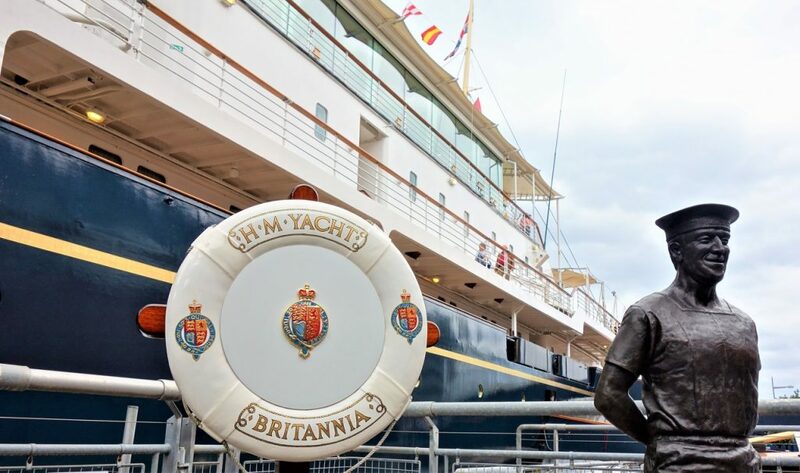 As we skirted around the north of Edinburgh we decided to make a stop at the Royal Yacht Britannia, one of the highlights of our day. In service from 1954 to 1997, and now kept as a museum piece. 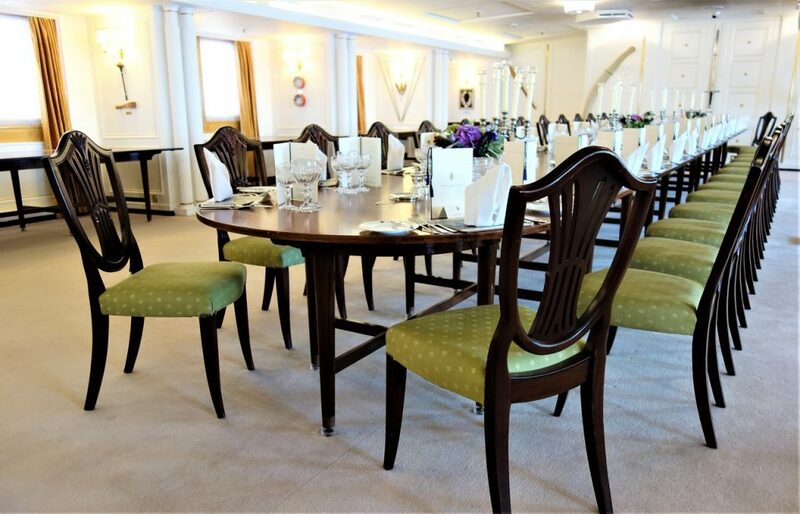 A fascinating insight into the royal life on the seas. 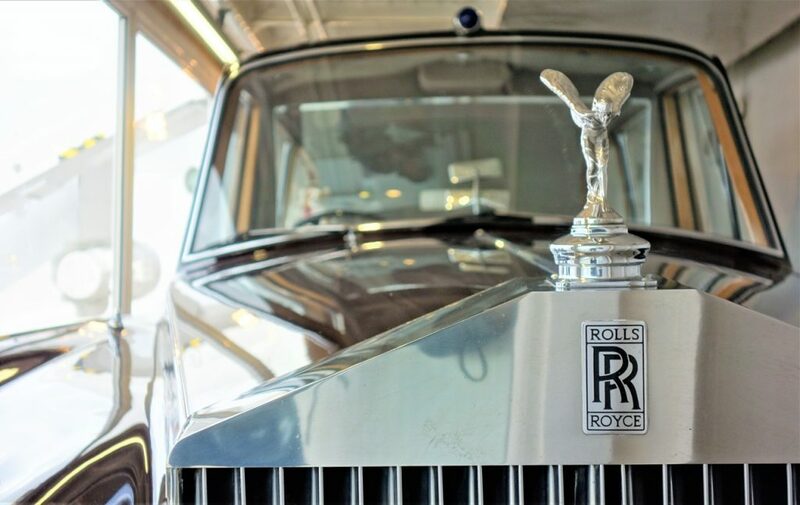 The Royal Roller kept on board for visits to local Kings and Queens. 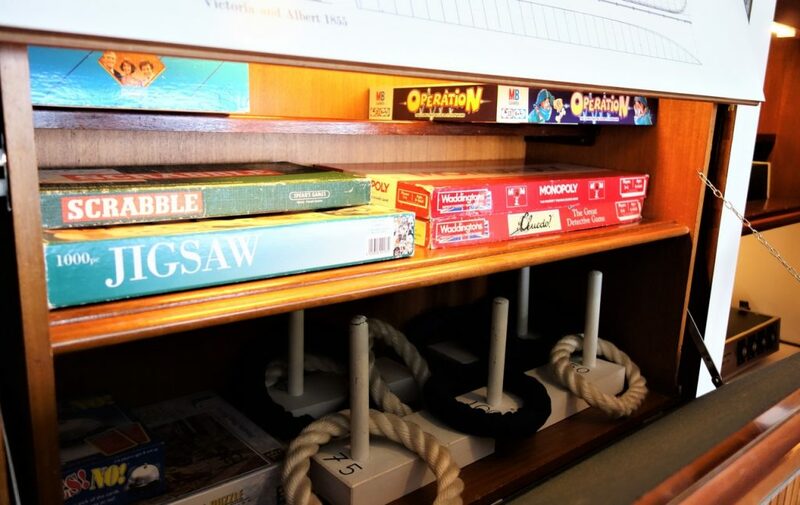 So The Queen likes a game of Operation! Good for her. 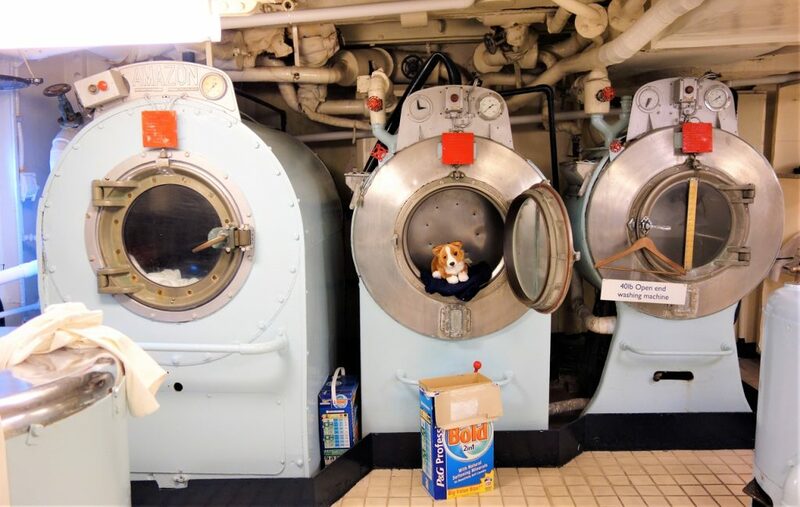 Royal washing machines in the royal launderette. 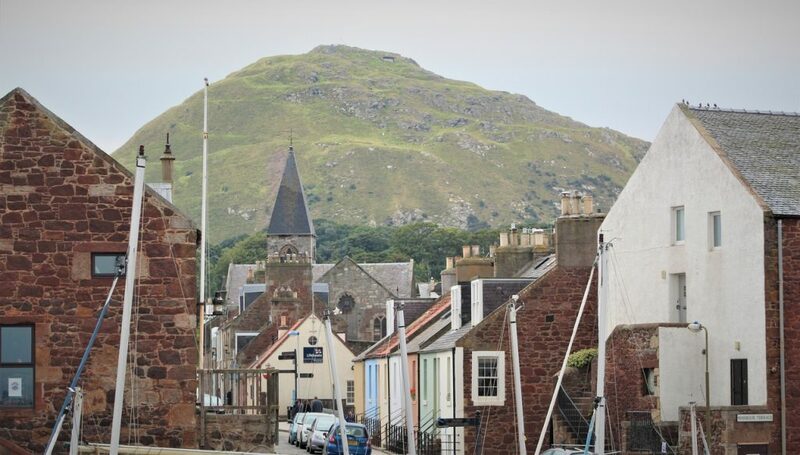 North Berwick in the shadow of the Law hill. 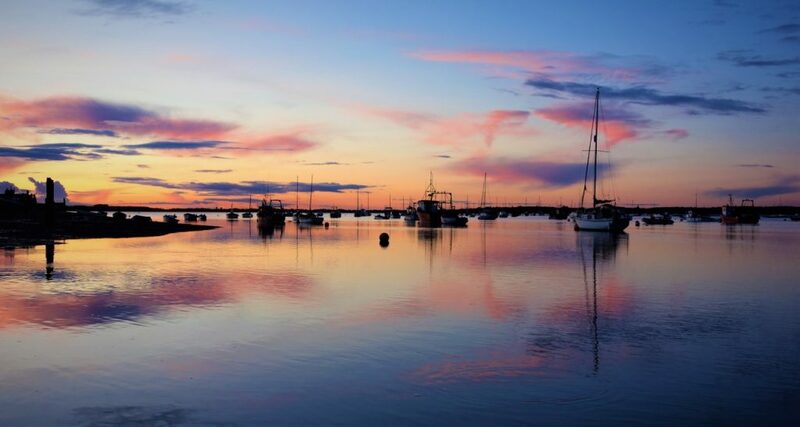 A lovely little town and harbour. 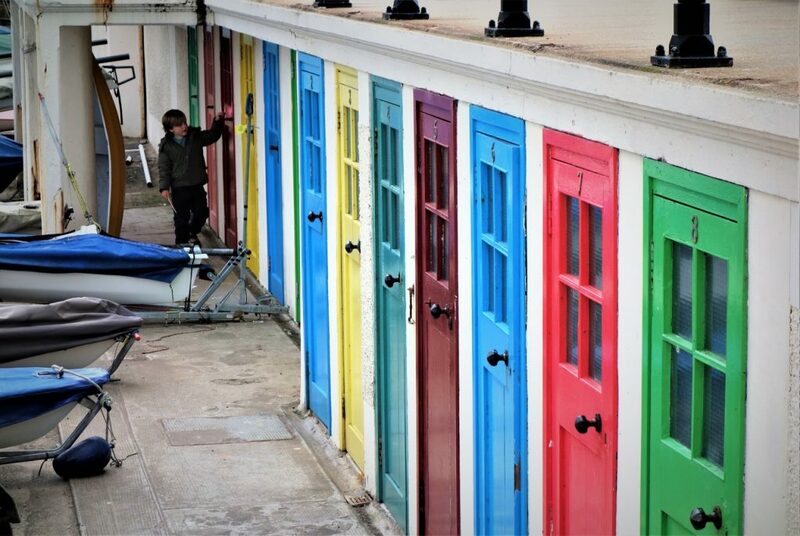 Colourful doors in the harbour boatyard. 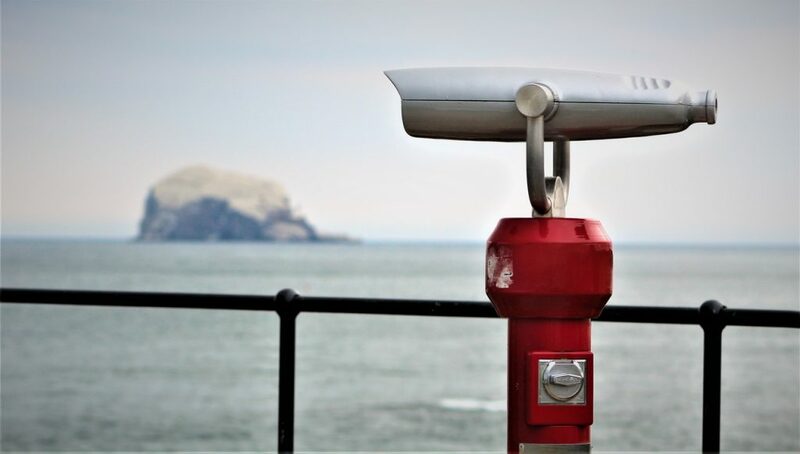 A handy telescope to view Bass Rock, 3 miles out to sea in the outer part of the Firth of Forth. White from bird life. 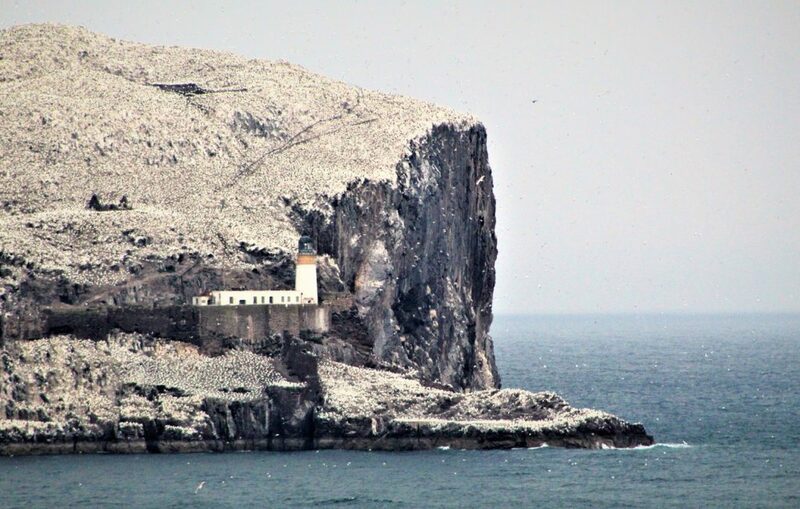 Thousands of gannets visit the island every year, and as many as 150,000 in high season! 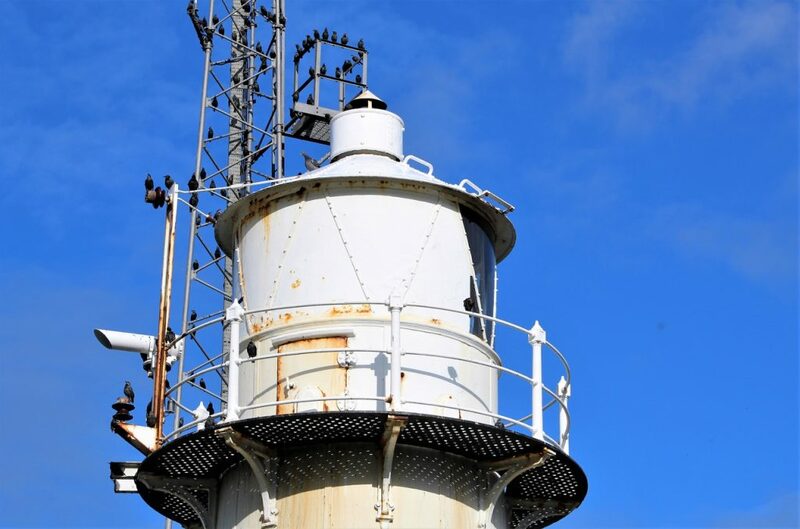 Poor lighthouse, bet that needs repainting quite a bit! 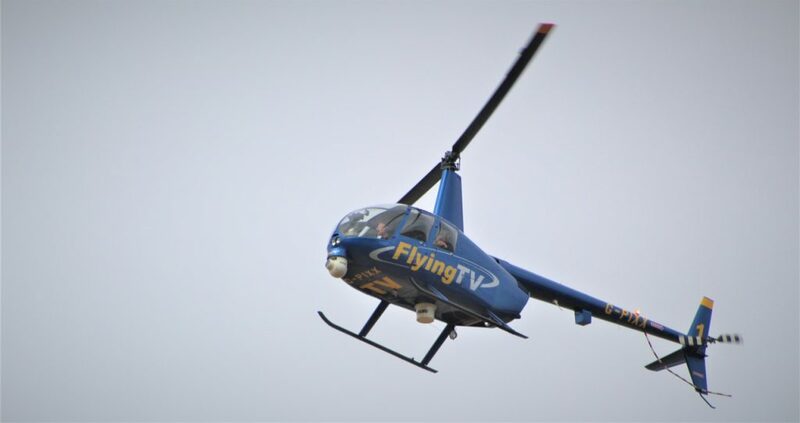 We tried to zoom in, this is about as close as we could get. You can just about make out the thousands of gannets hogging every bit of the island and circling in the sky. 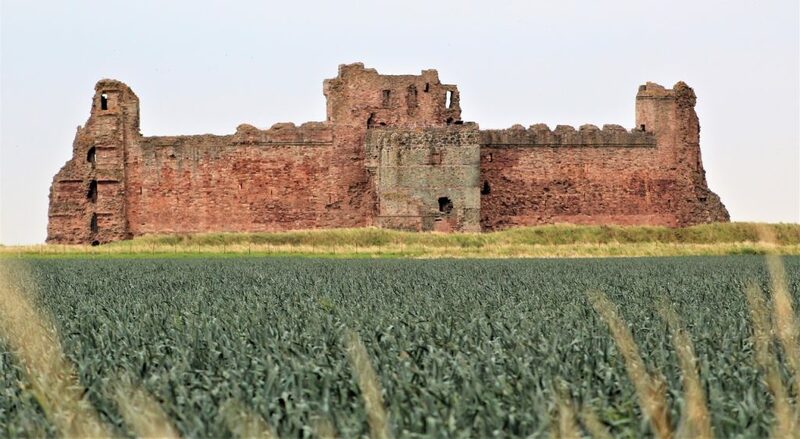 The red sandstone Tantallon Castle, as we drove east out of North Berwick. Another regular along our trip, every few days passing a coastal power station. 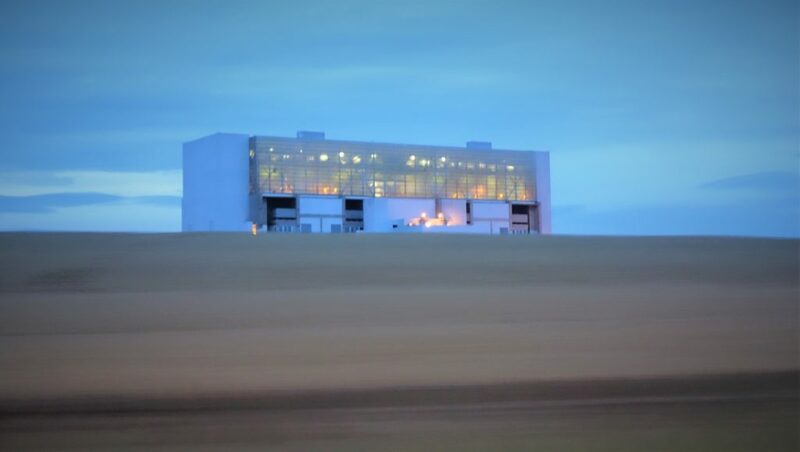 This time Torness Nuclear Power Station, peeping over the blurred fields as we drove past along the A1 to the Scottish border and Berwick upon Tweed. Wow, another beautiful day in Scotland. 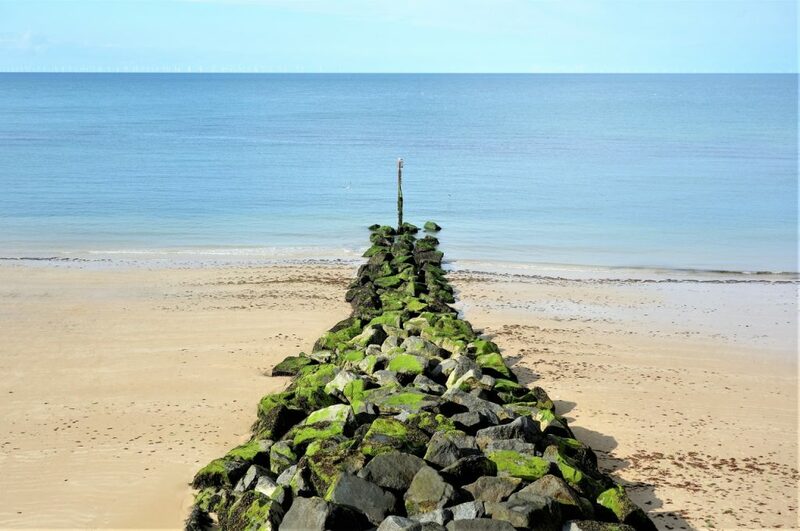 We will spend the morning in Aberdeen, before following the coastline down to Dundee, then across to St Andrews, before cutting slightly inland for the evening at Glenrothes. 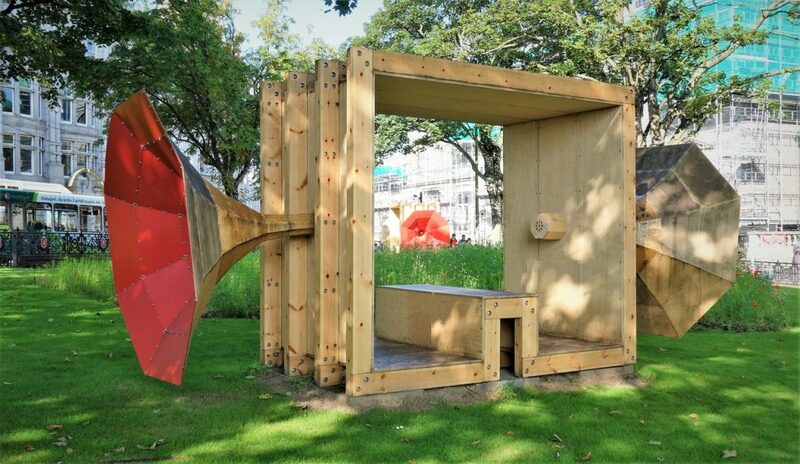 Exploring some street sculptures in Aberdeen centre, here the trumpet like ‘The Listener’. 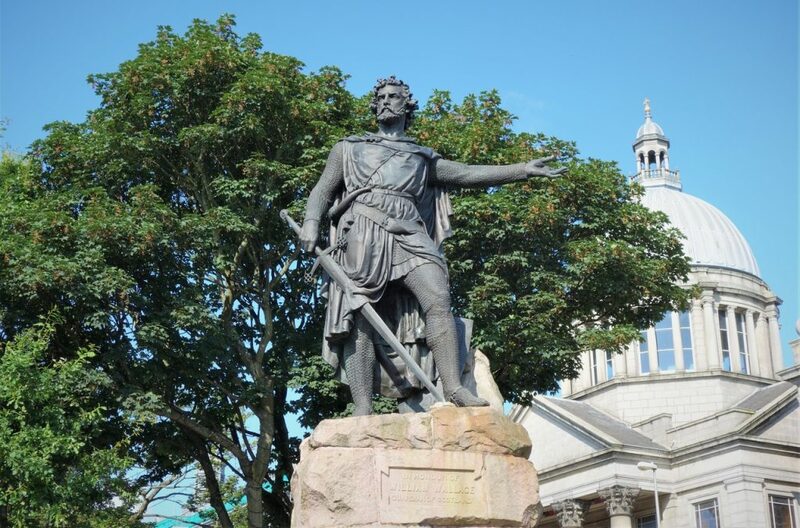 The Scottish knight Sir William Wallace, with the dome of St. Mark’s Church in the background. 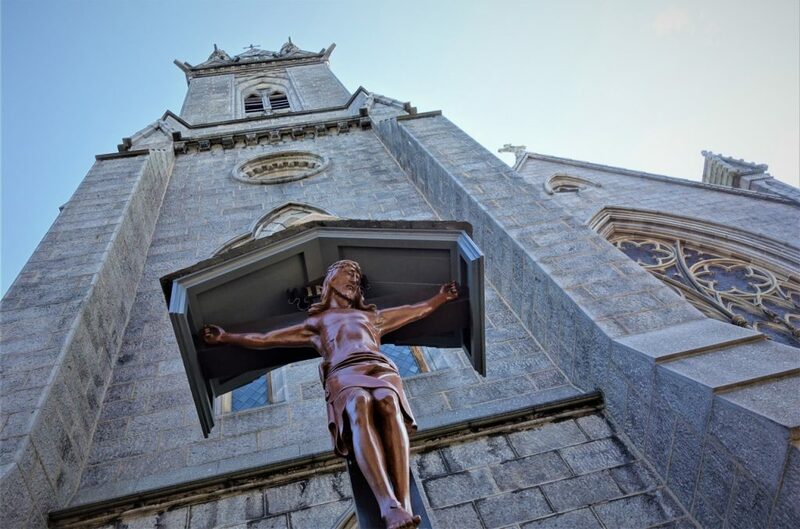 St. Mary’s Cathedral, a service was in progress, so we didn’t go in. Jarno viewing his empire. 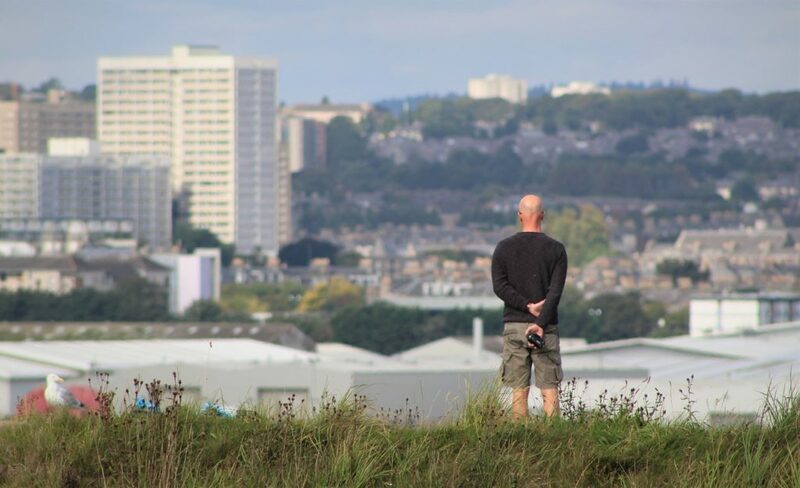 OK, just checking out the view over Aberdeen and the River Dee from Torry Point Battery. 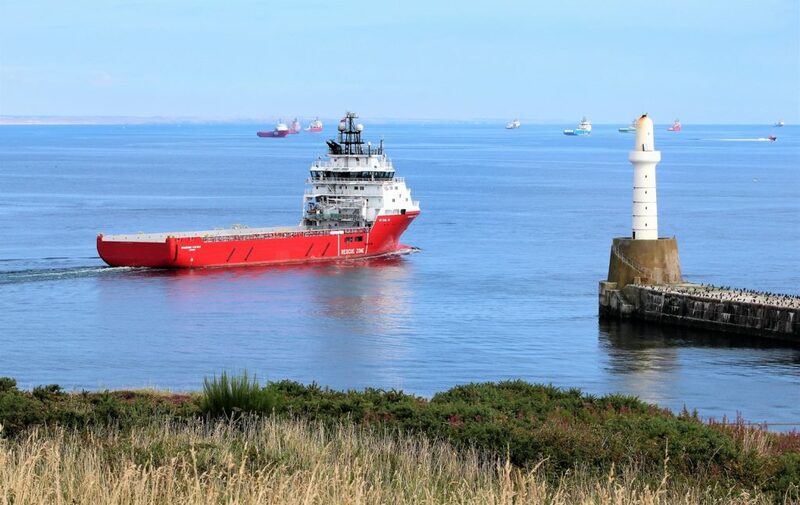 A ship leaving the bustling Aberdeen Harbour past the South Breakwater. And the same ship in the distance as we drove south along the coast road out towards Cove. 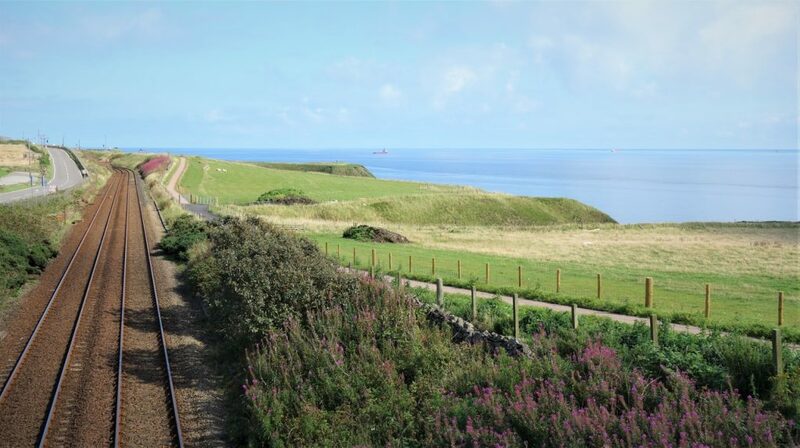 A road, railway line and footpath all following the same coastal route out of Aberdeen. 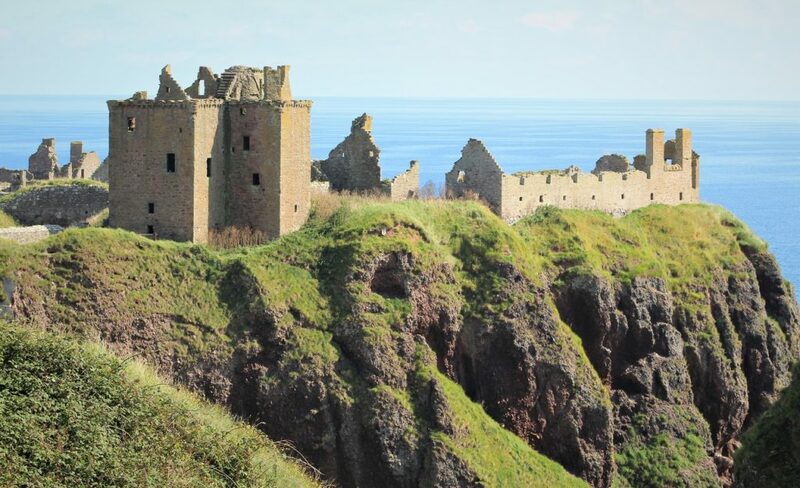 The remains of the medieval Dunnottar Castle perched on near vertical cliffs over the North Sea. It was super busy this Saturday lunchtime. 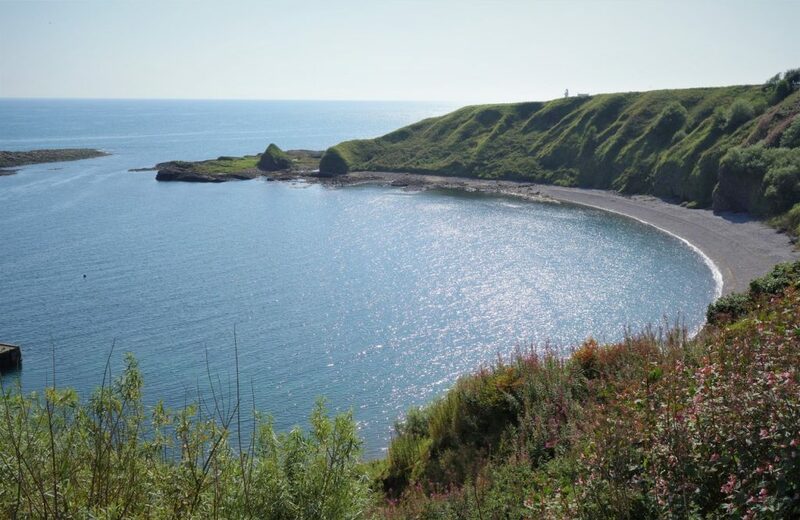 As we had a long way to travel still, we didn’t stay long, continuing on towards Stonehaven. 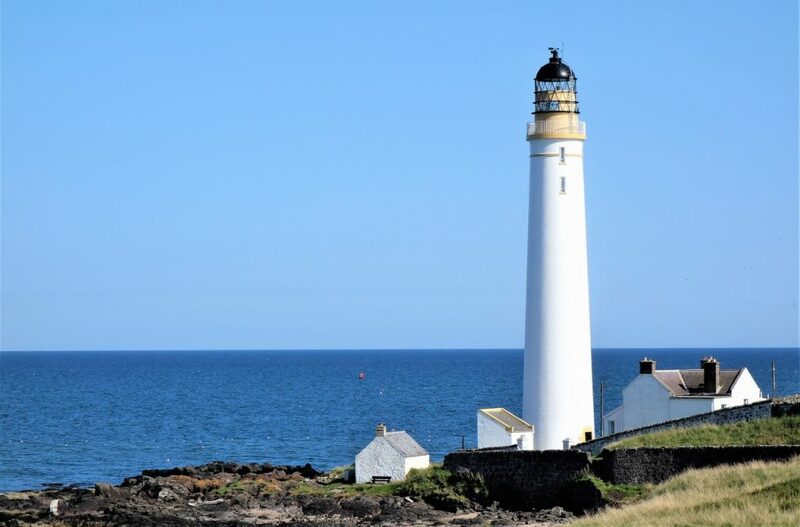 The almost perfect arc of Catterline Bay, with Todd Head Lighthouse peeking over the headland in the far distance. Just past Montrose we parked up at Ferryden, then walked along the South Esk River to the old nautical navigation beacons. 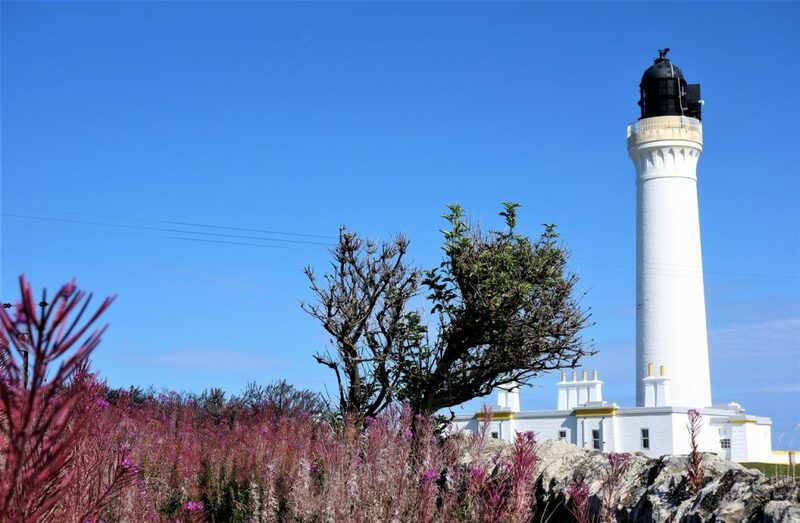 Then around the corner we arrived at Scurdie Ness Lighthouse. As we walked along we were followed by a pod of dolphins playing in the South Esk. They seemed to be having great fun. 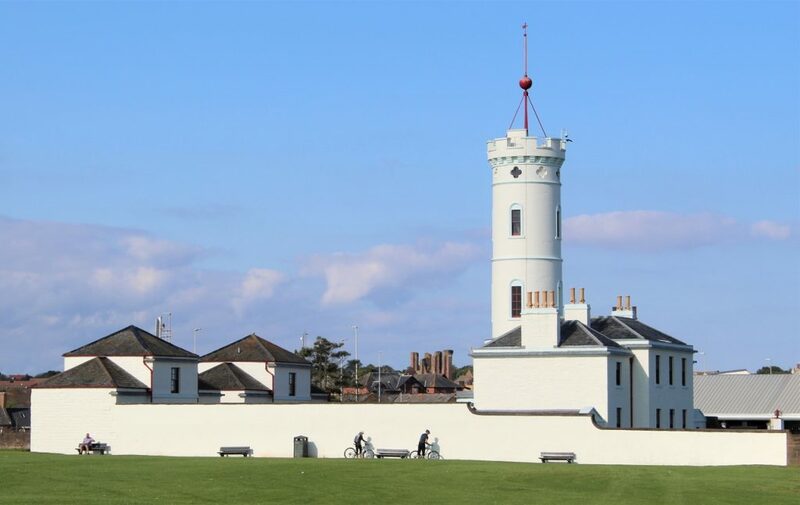 Arbroath Signal Tower Museum on the sea front. 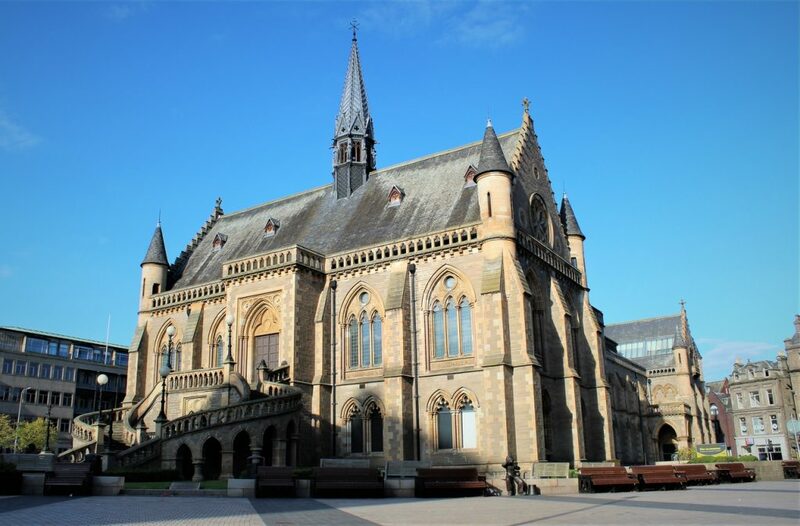 The McManus, Dundee’s Art Gallery & Museum. 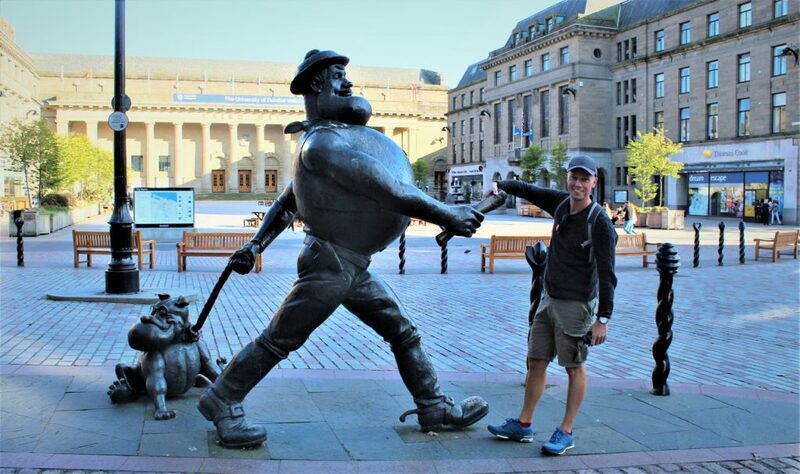 A cartoonish character in a funny hat, and Desperate Dan. 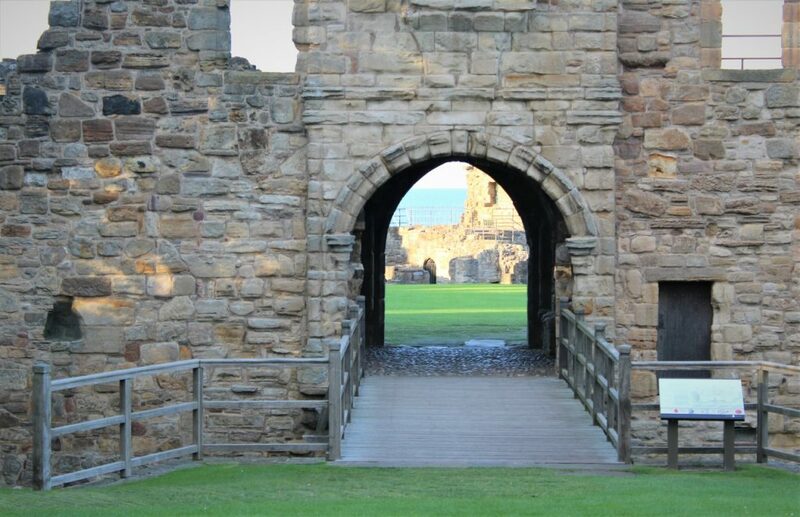 The evening light on St Andrews’ Castle (yes, another ruin). 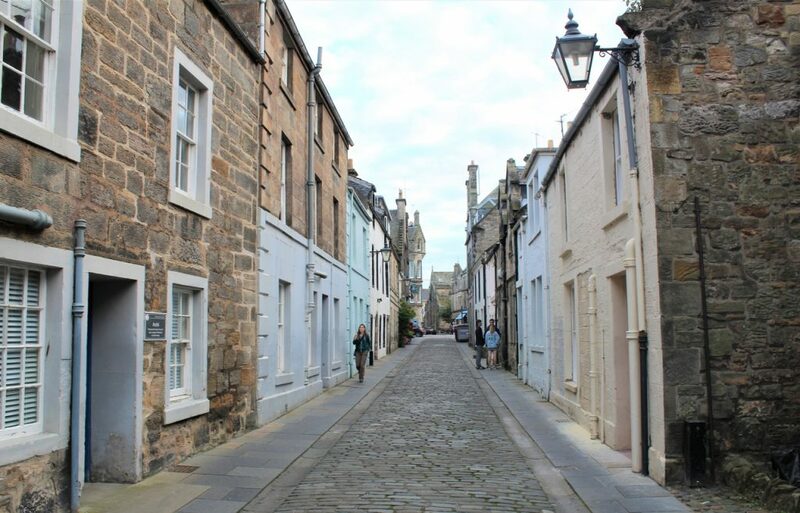 As it was late in the day, the castle was now closed, so we wandered around the outside of the castle and the charming St Andrew’s lanes. 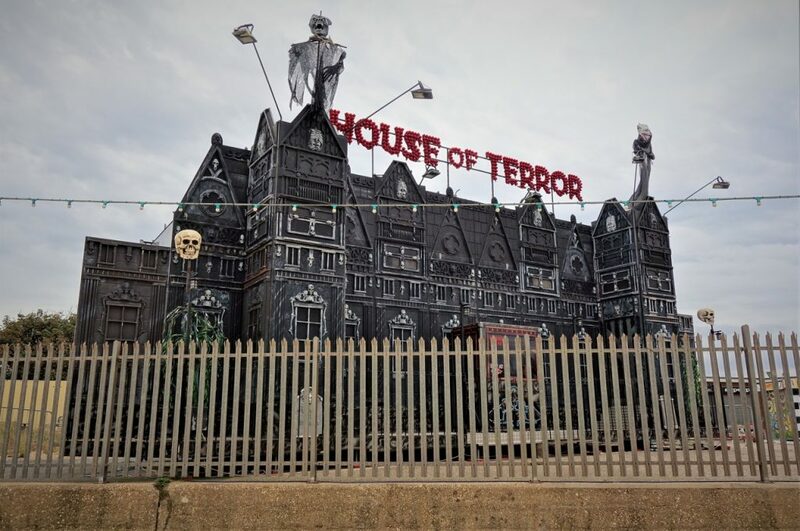 All was quiet, now that most of the tourists had left for the day. A typical stone cottage on the way back to our car. Next stop Glenrothes for the night. The weather was superb for day twenty-seven of our trip, what a difference a bit of blue sky and sunshine makes (especially for the pictures). 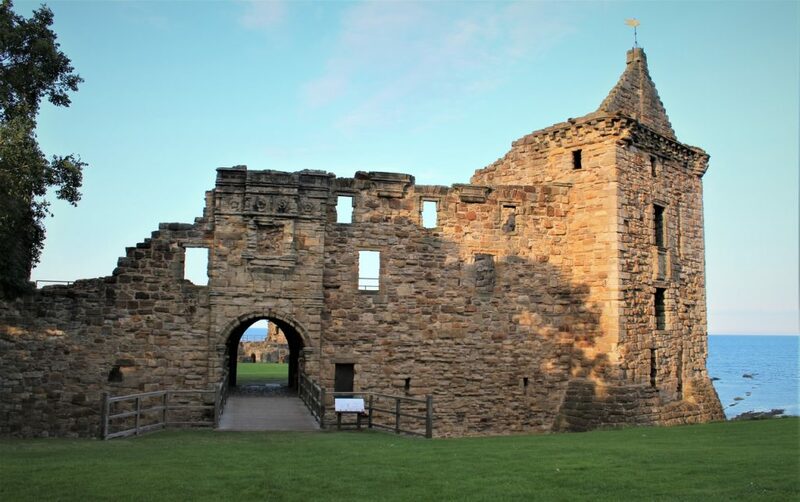 We made full use of our Historic Scotland membership today too, saving quite some cash on the three of their properties we visited. 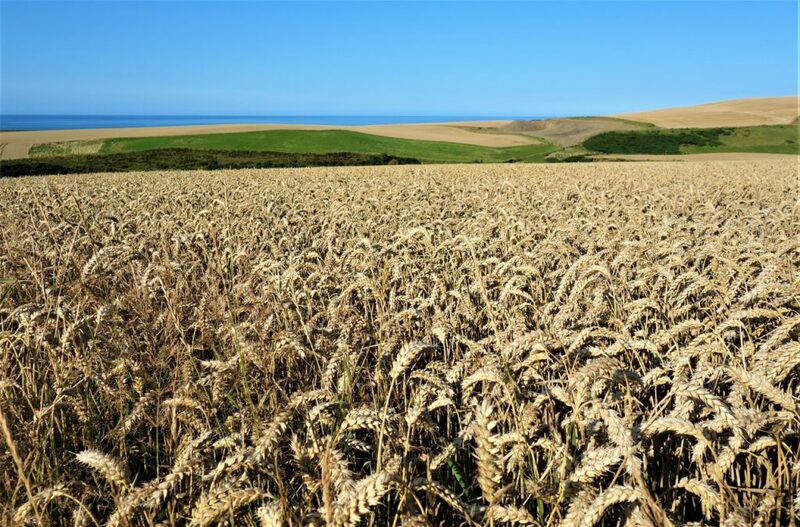 Rolling fields of golden wheat in the late afternoon Scottish sunlight. 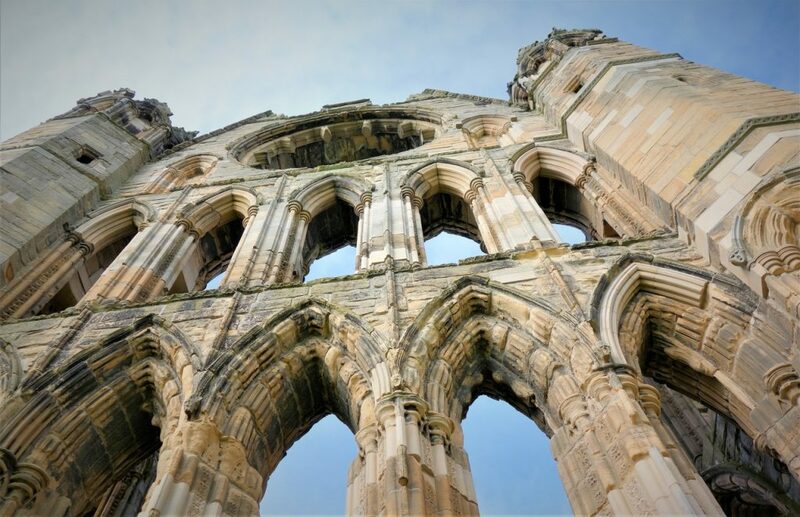 Our first Historic Scotland visit of the day at the 12th century Elgin Cathedral. 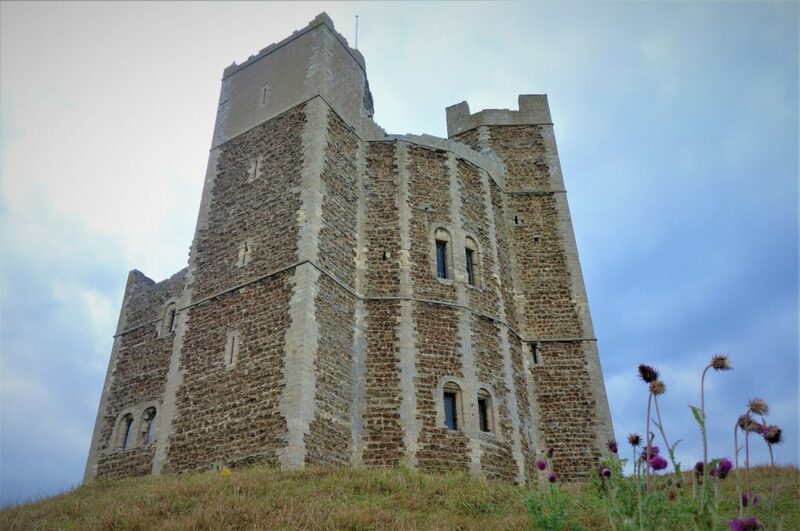 Some great exhibitions in the towers, quite a labyrinth of passageways up steep stone stairs. 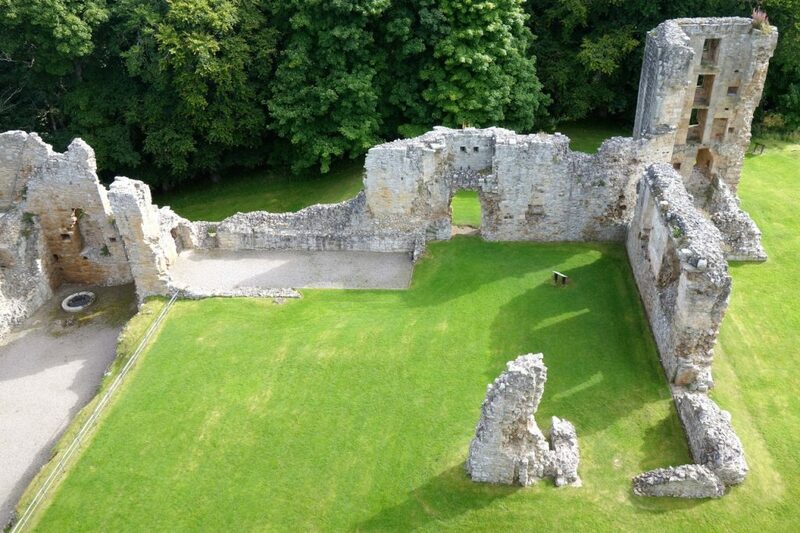 Looking down on part of the remains from the lookout at the top of Spynie Palace. 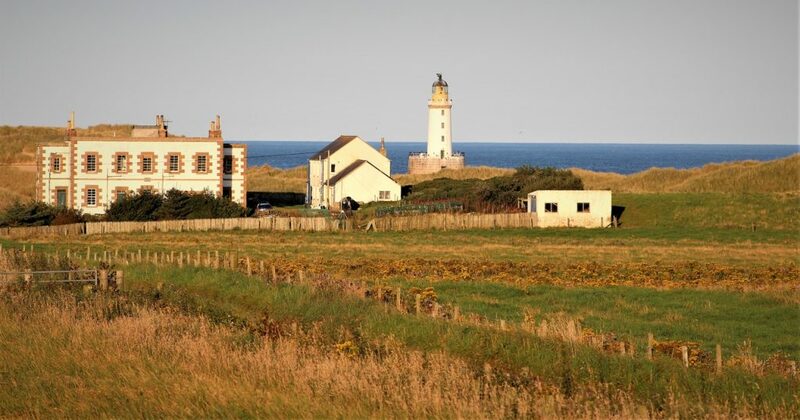 Yay, more lighthouses today, starting at Covesea Skerries Lighthouse, just west of Lossiemouth. 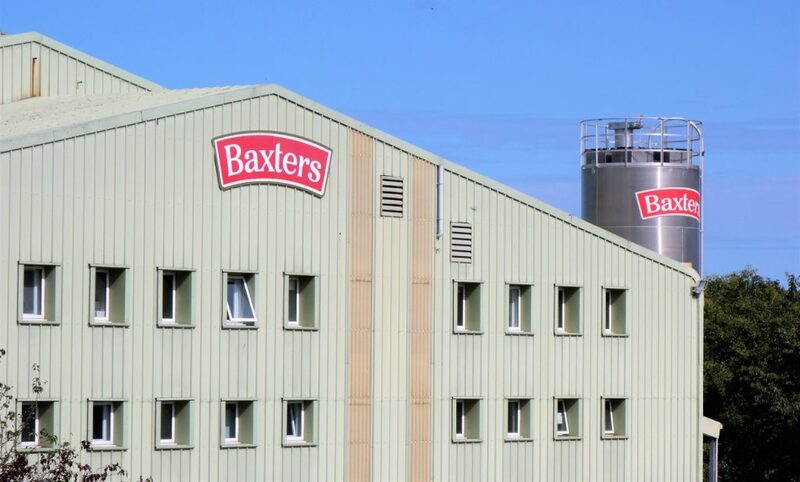 Good timing, we were just getting hungry when we spotted Baxters visitors centre on the map! 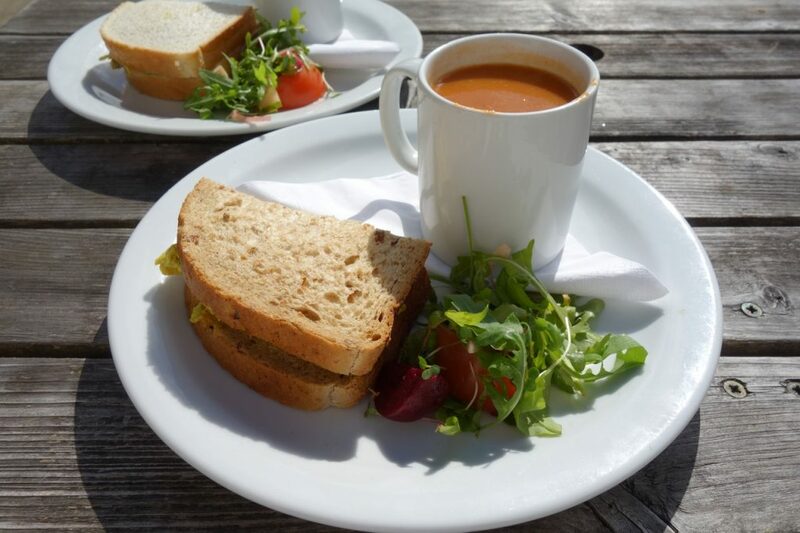 A mug of Baxters soup for lunch, despite it being a lovely day (not really soup weather really), we had to try the local delicacy. 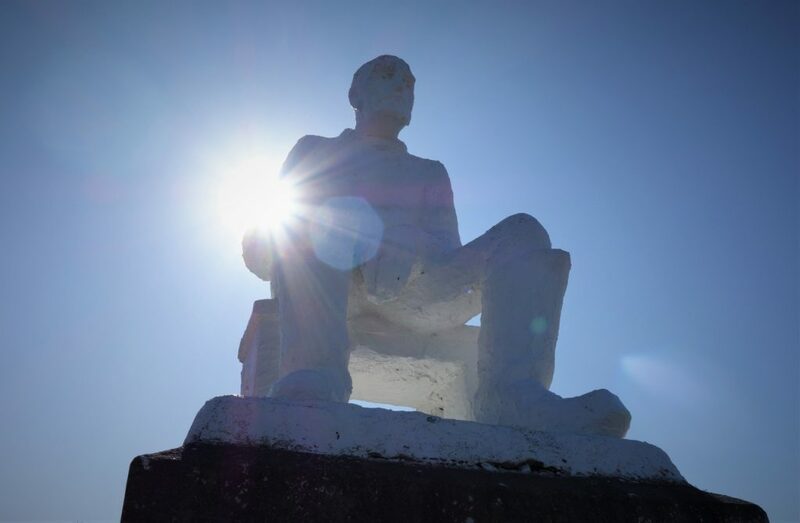 The Mannie statue of a fisherman by Correna Cowie…. 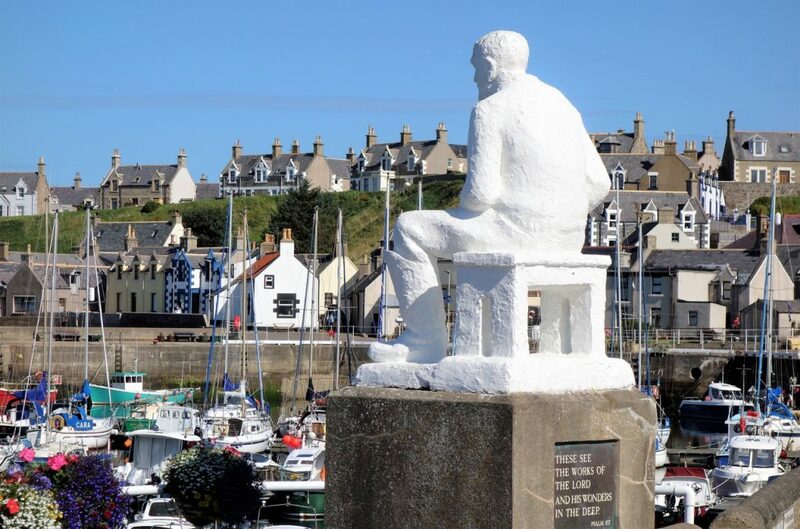 … keeping careful watch over Findochty Harbour. Views west over the rugged coastline from Portknockie. 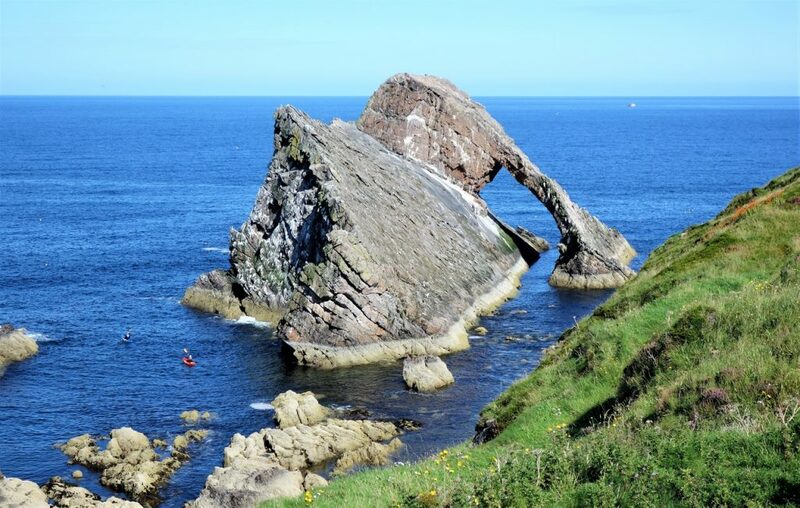 Canoeists dwarfed by Bow Fiddle Rock, which looked more like an elephants head if you ask us. 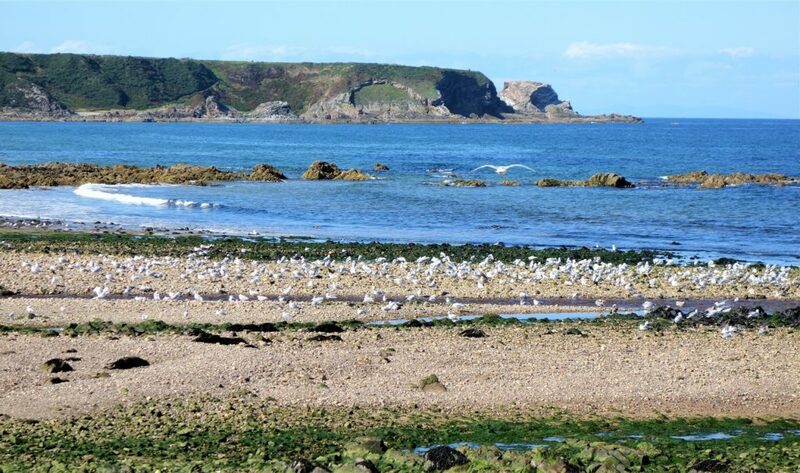 Hundreds of seagulls picking between the pebbles on Cullen Beach. 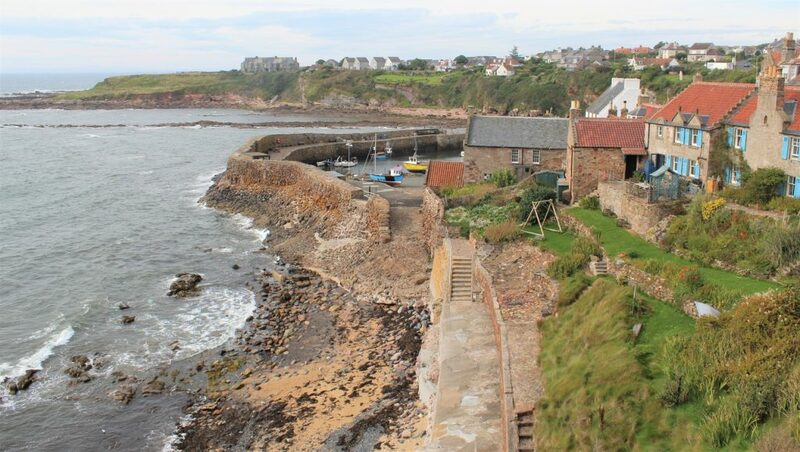 The quiet harbour at Portsoy, apparently often used for filming and commercials. 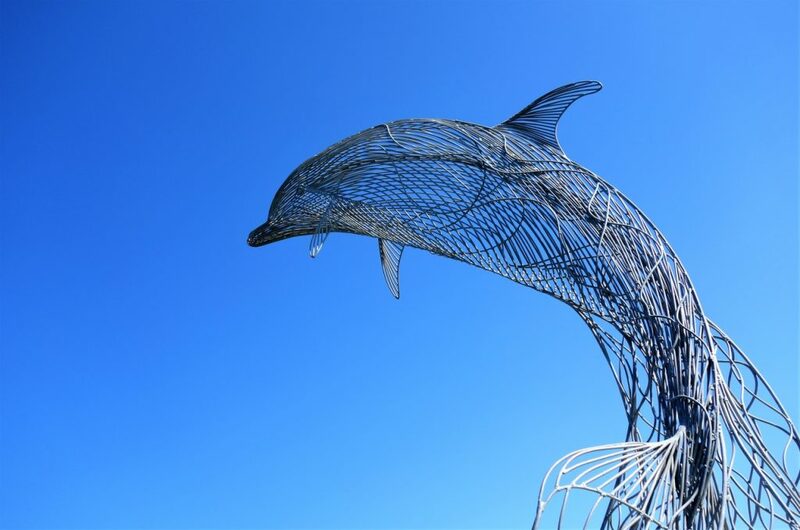 A jumping dolphin sculpture by the artist Carn Standing in the harbour. 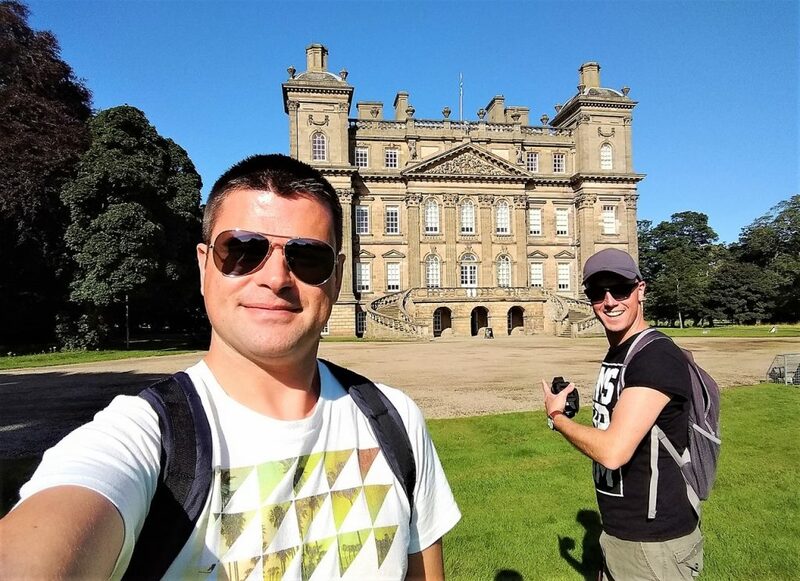 The impressive Duff House at Banff. Again we seemed to pick a good time to visit. 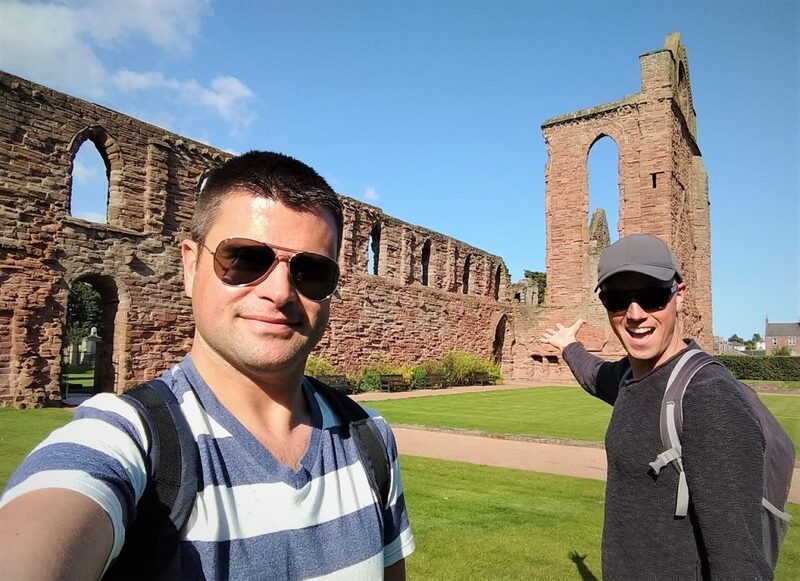 We were the only visitors this afternoon, so we had the helpful Historic Scotland guides all to ourselves. 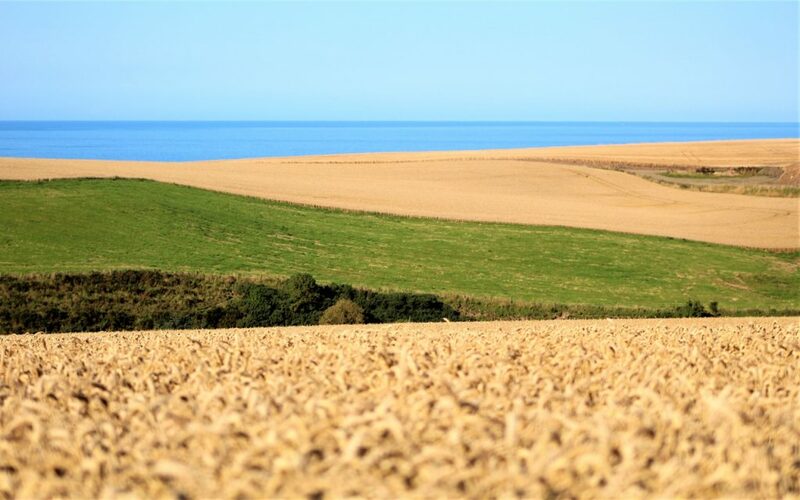 The views over the golden fields near Silverford (along the B9031), breathtaking in the late afternoon sunlight. 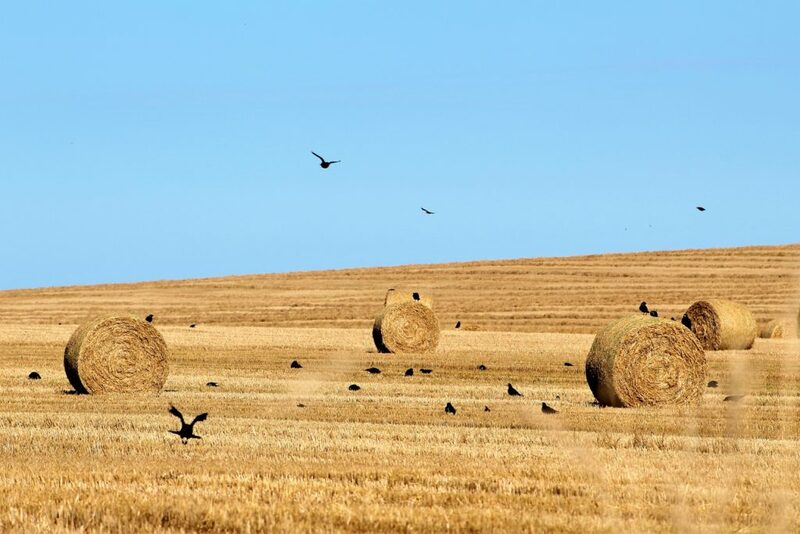 The locales enjoying the fresh hay bales. 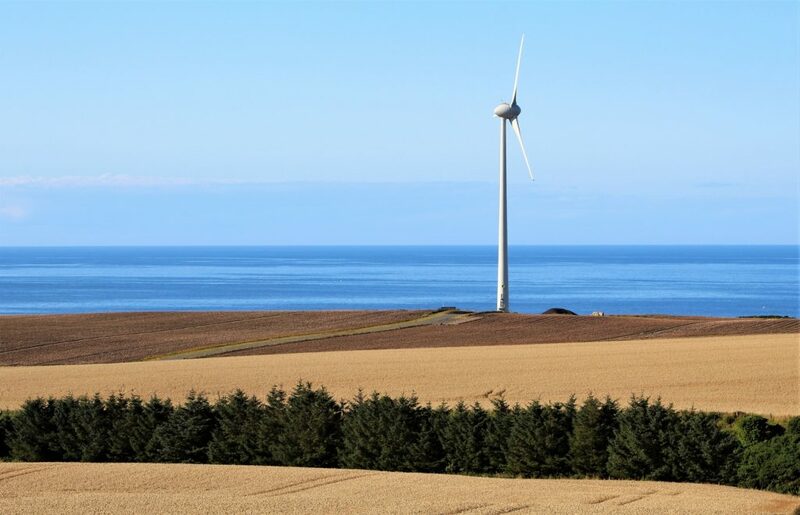 And a solitary wind turbine, nature and technology in harmony. 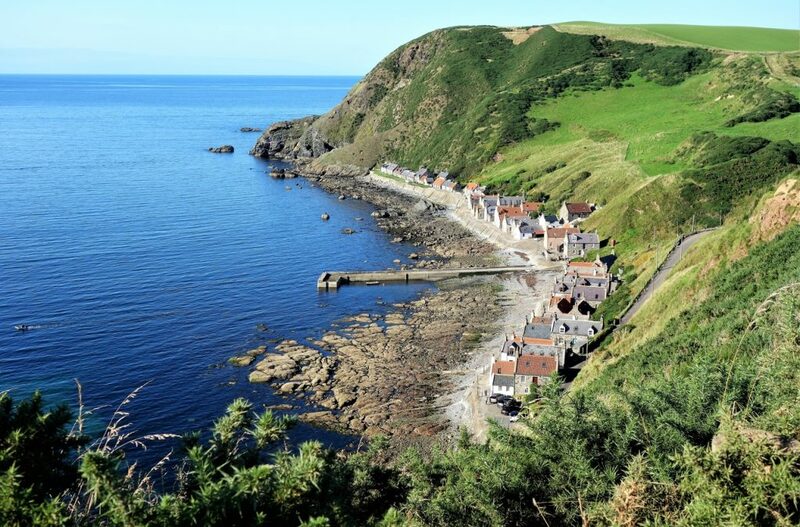 The tiny fishing village of Crovie clinging to the waters edge. No space for cars, just a small access path along the front. 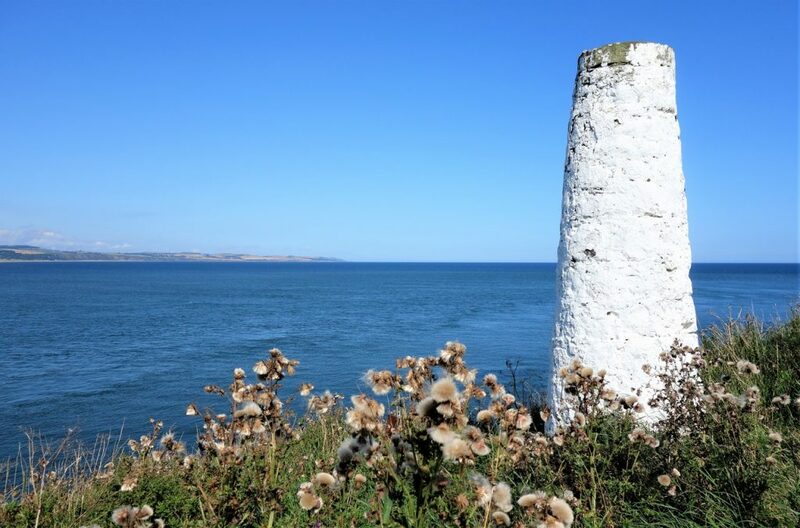 Then just a little further along at Pennan, we could make it down the tiny coastal lane into the village, just. 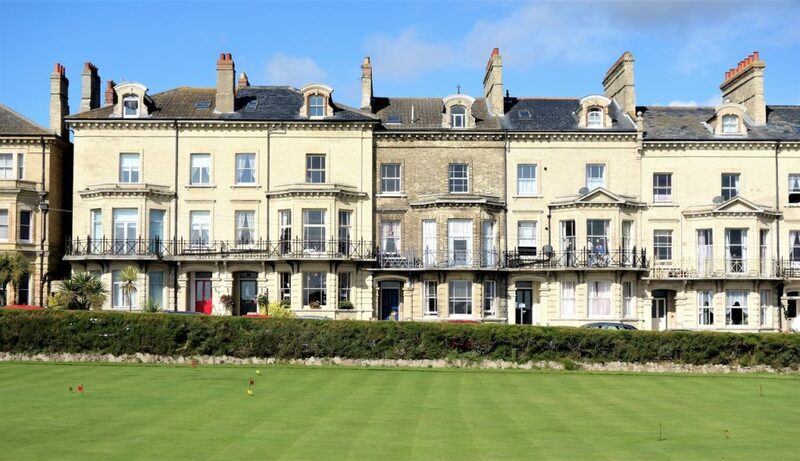 No back gardens, so everything happens on the seafront…. 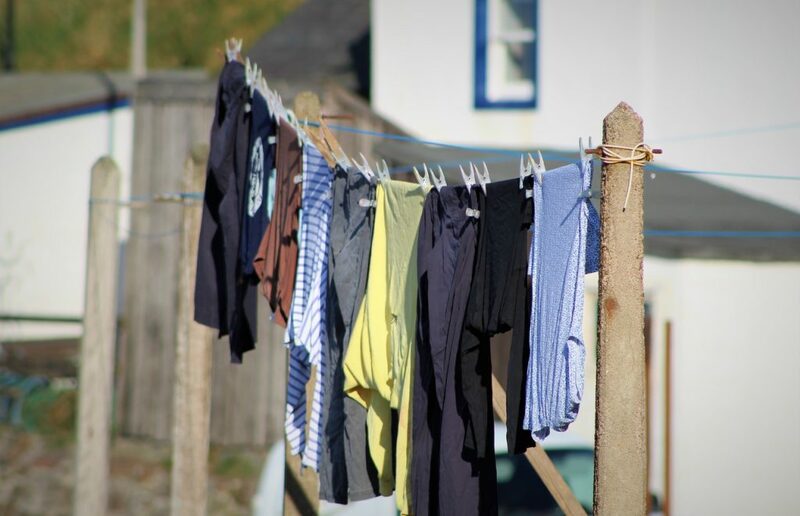 ..including hanging out the washing. 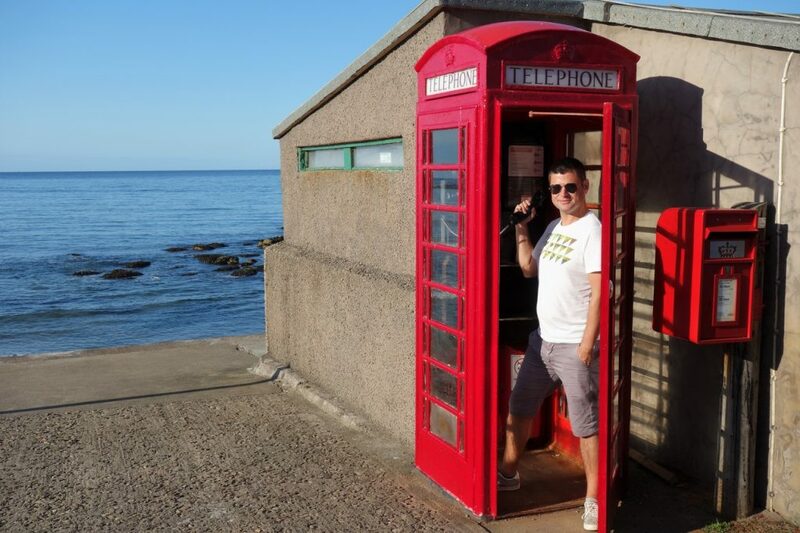 The phone box made famous by the film ‘Local Hero’ (staring Burt Lancaster), actually we haven’t seen the film.. but will do now. 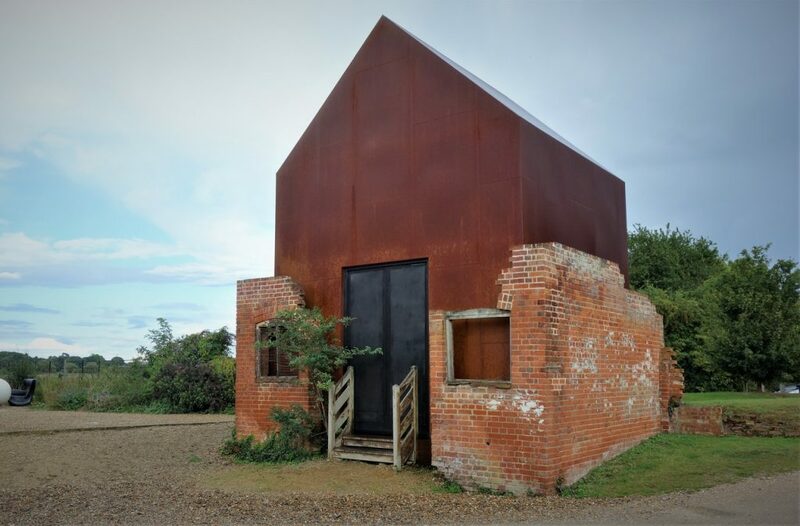 Another dove house, we seem to be making a habit of this. 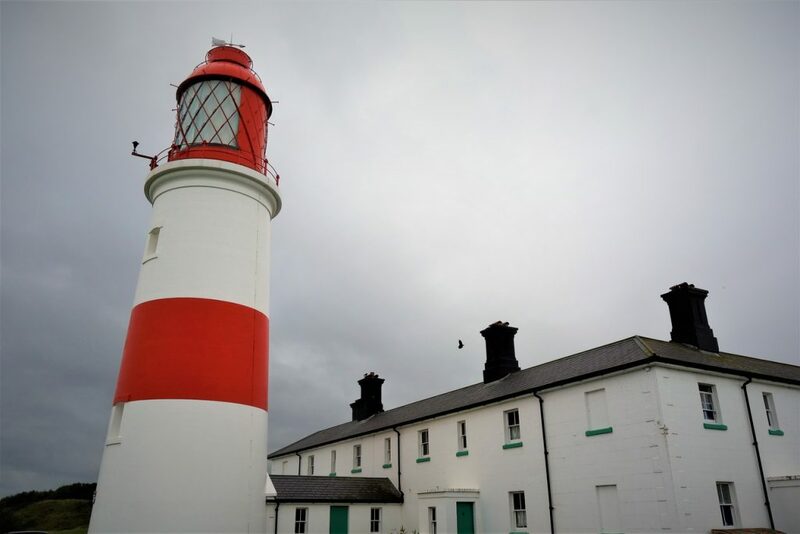 Two lighthouses at Fraserburgh’s Museum of Scottish Lighthouses, one old and one new. 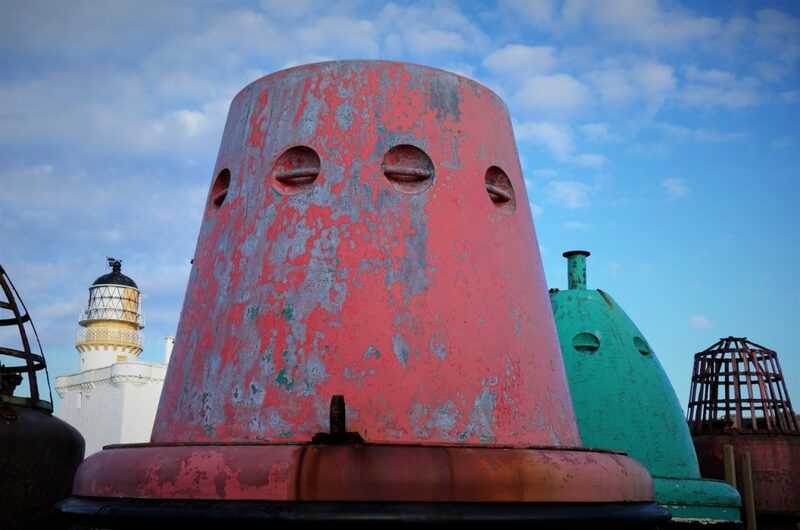 And a collection of disused brightly painted Buoys. Our final stop of the day, as we tried to get closer to Rattray Head to view the lighthouse. 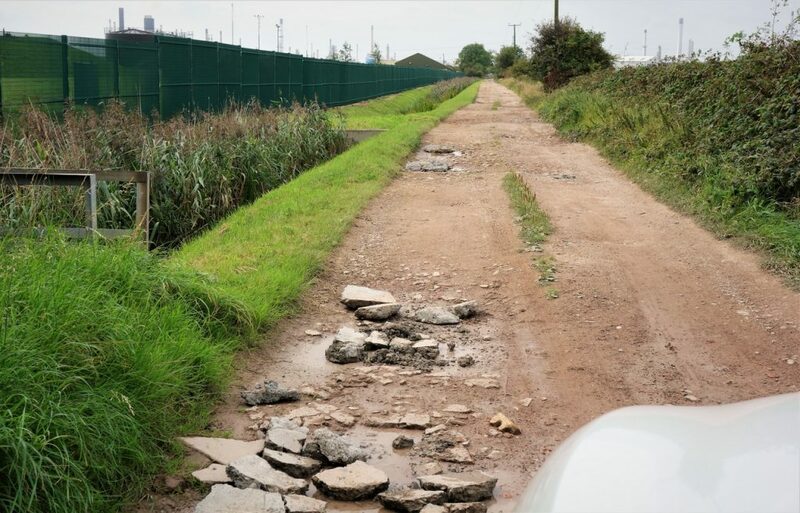 However, the track became increasingly narrow and bumpy and we weren’t sure if we were now on someone’s private drive. 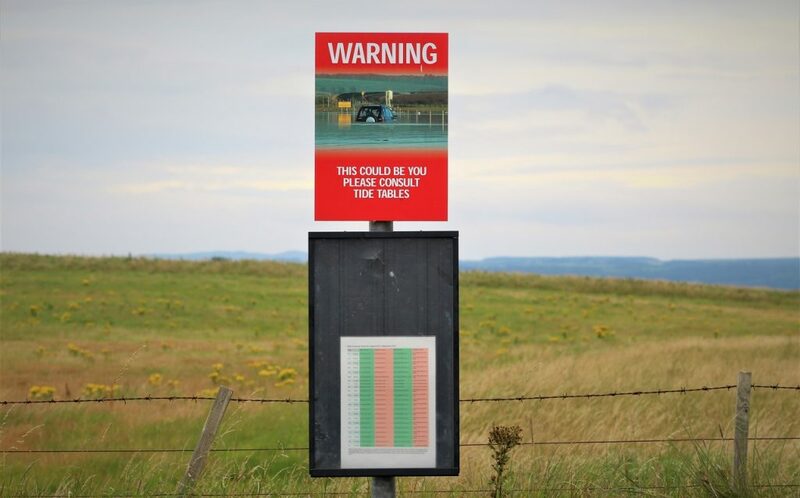 So we took some photos, somehow managed a U turn in the tightest of spaces, then continued our drive down to Aberdeen.